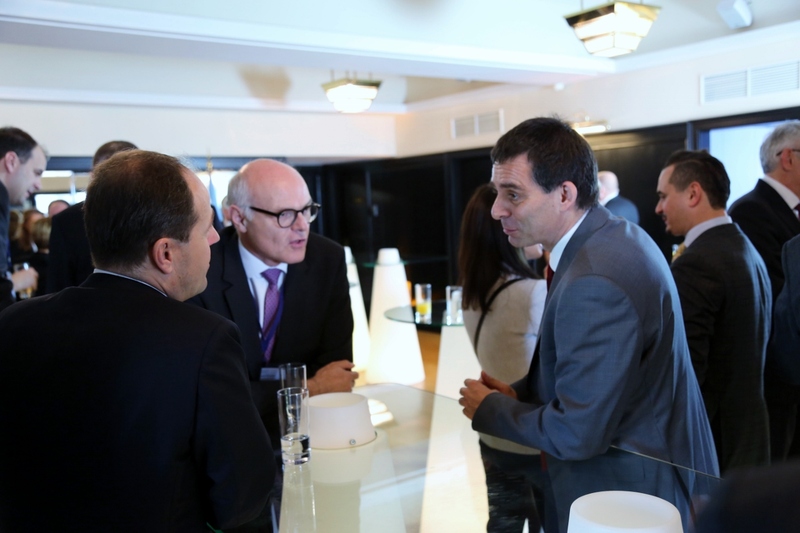 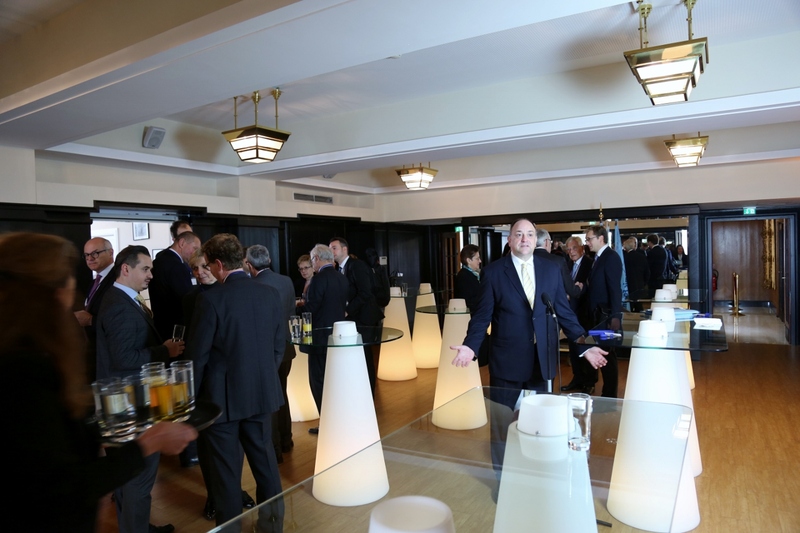 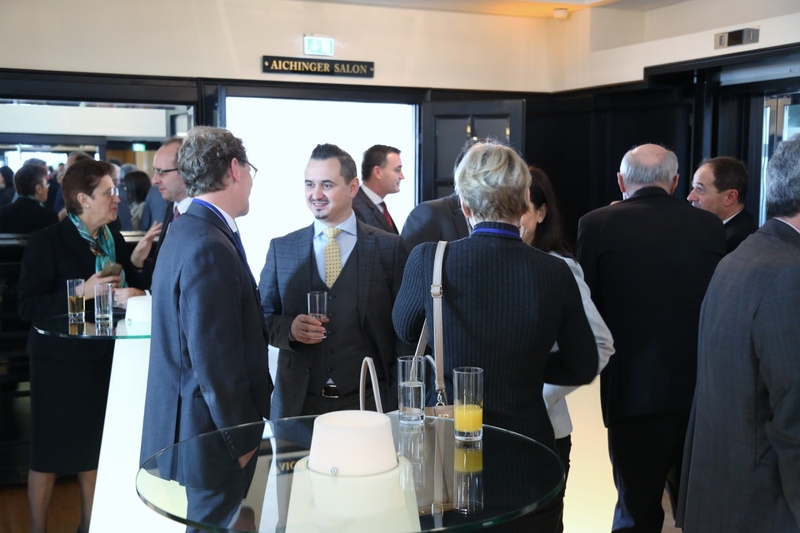 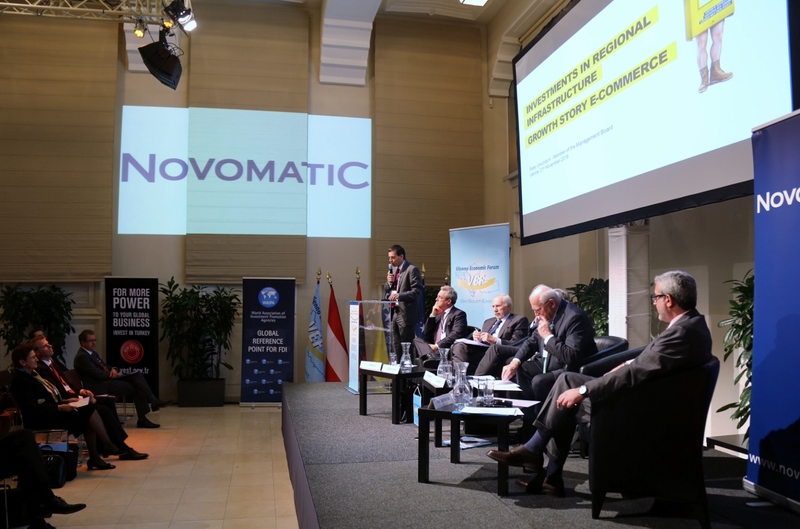 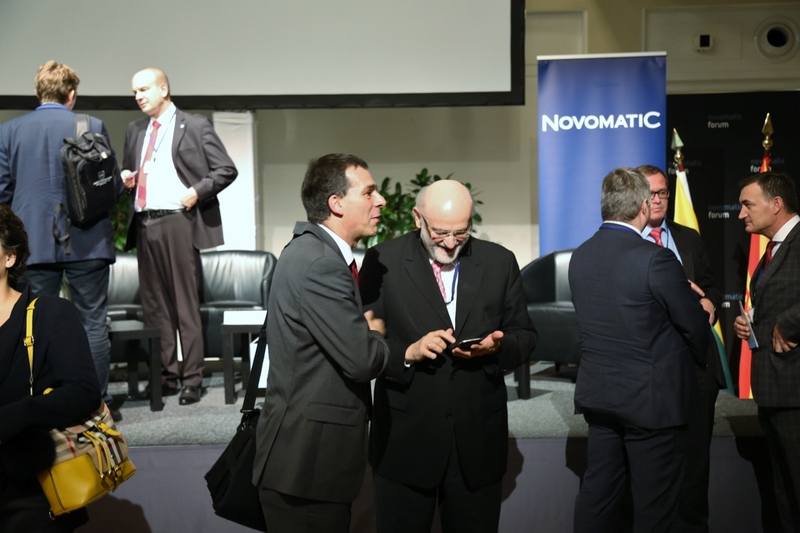 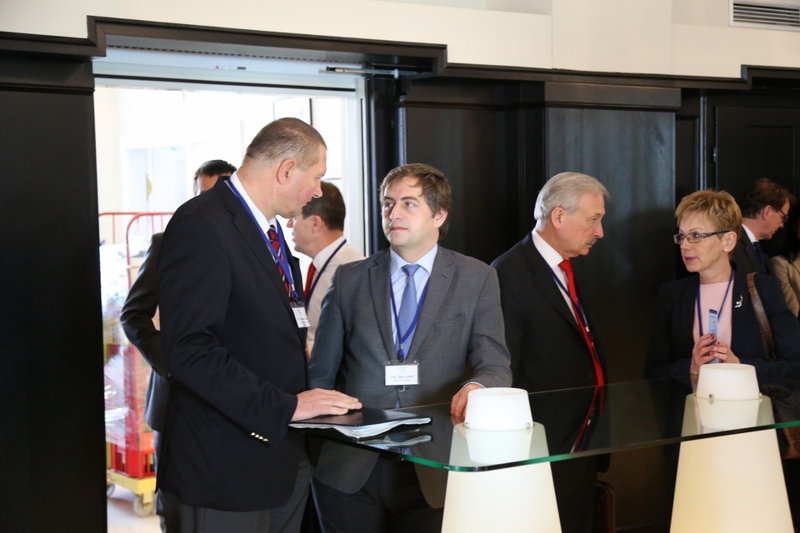 At the official opening the CEO of Novomatic AG, the host Mag. 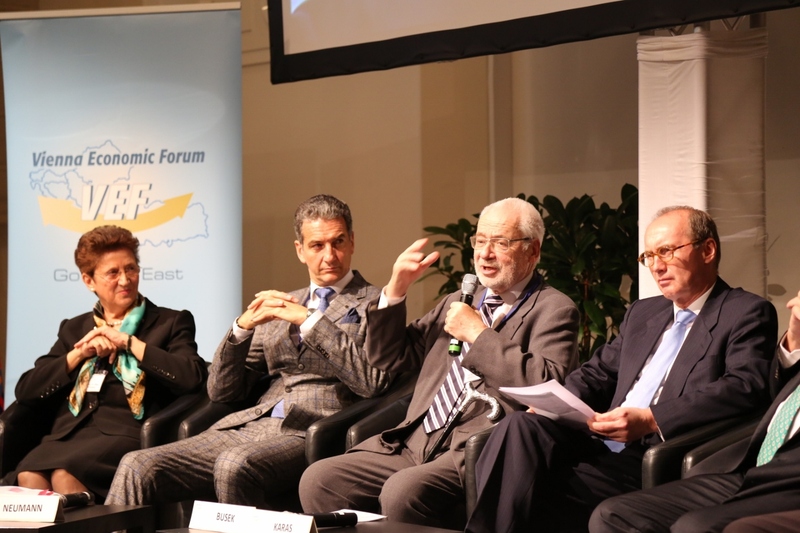 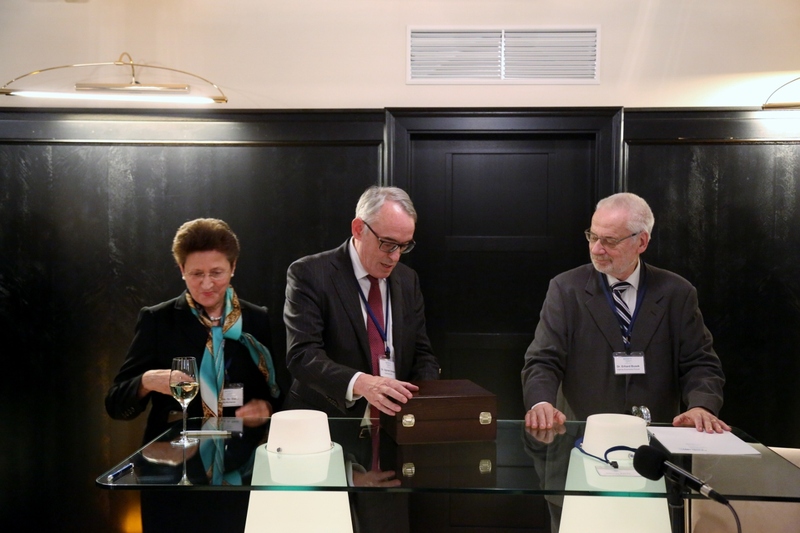 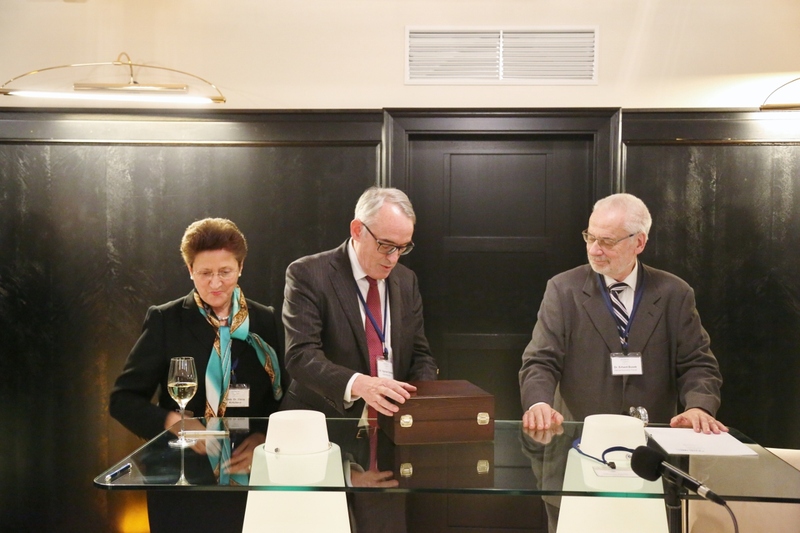 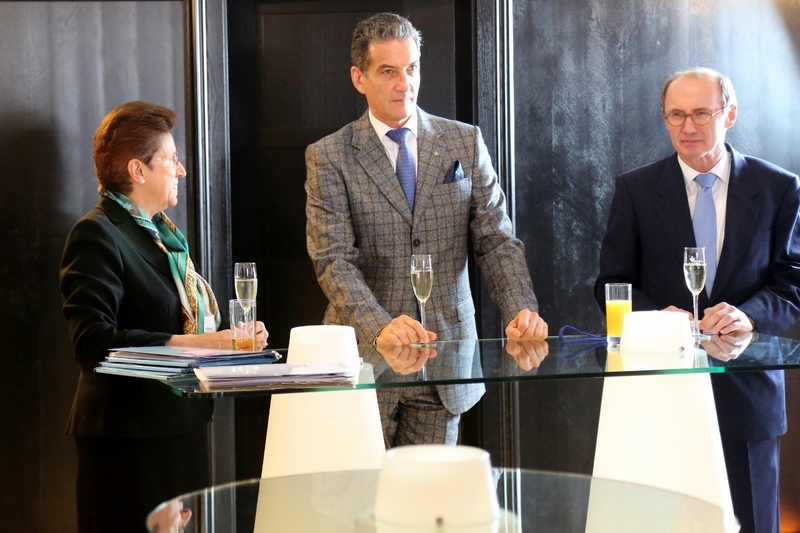 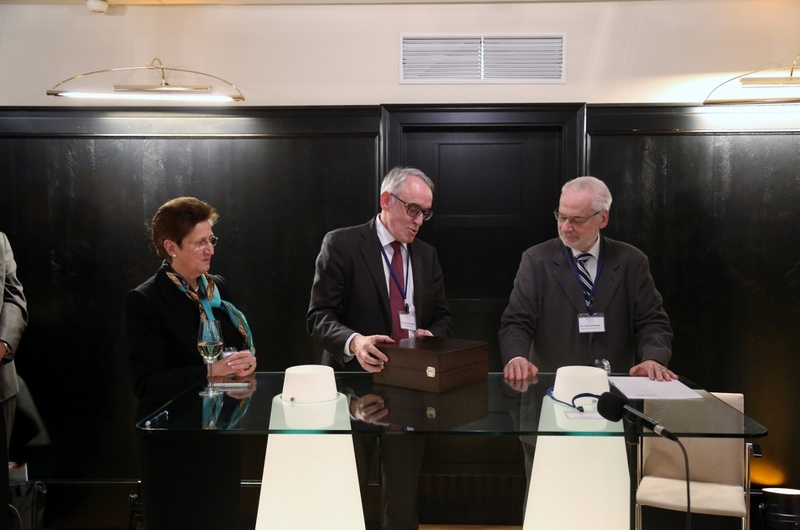 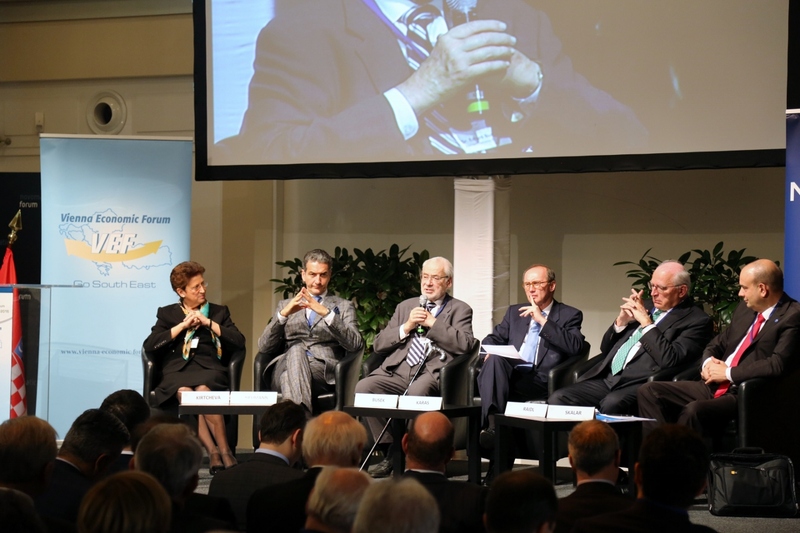 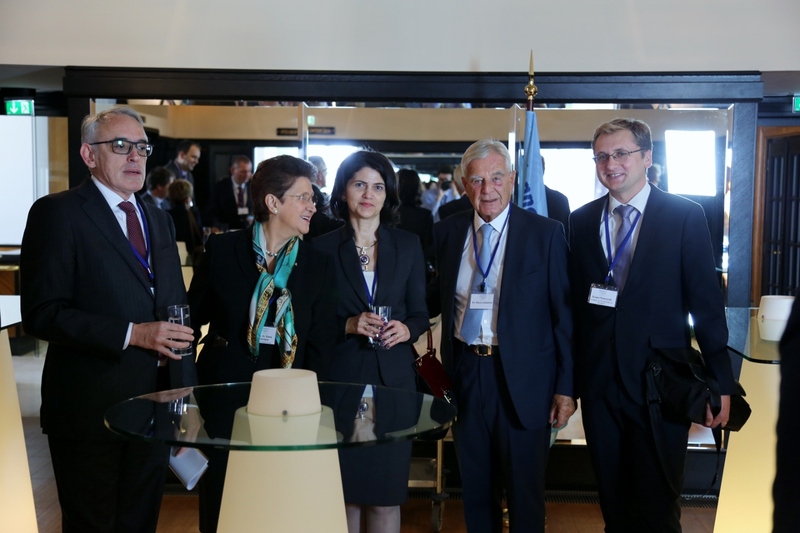 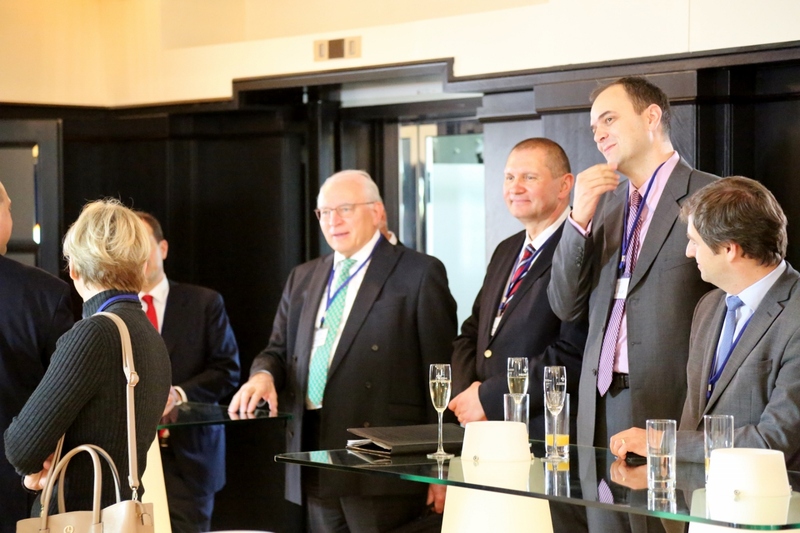 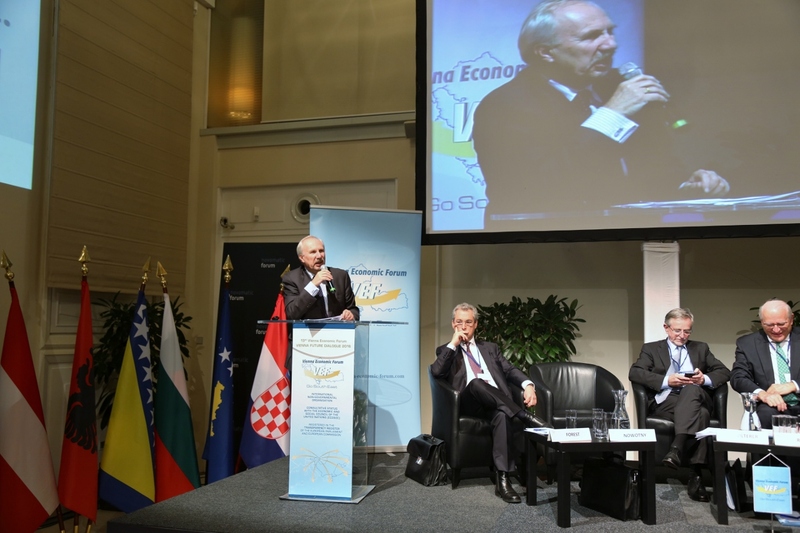 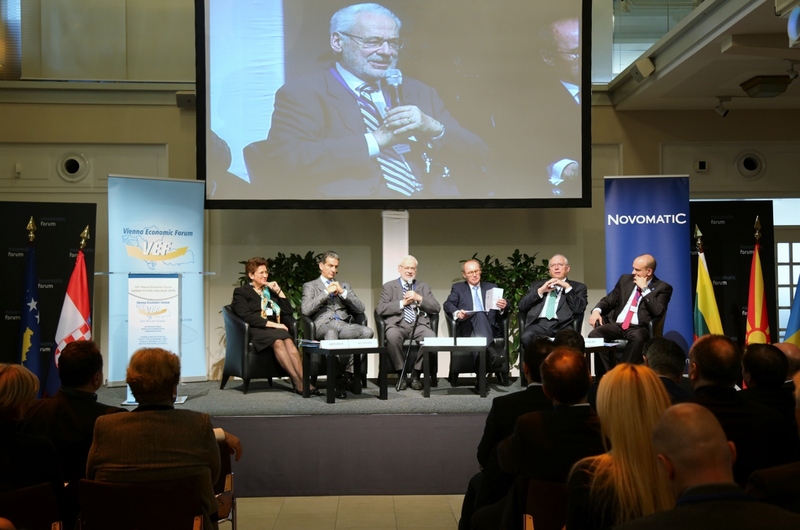 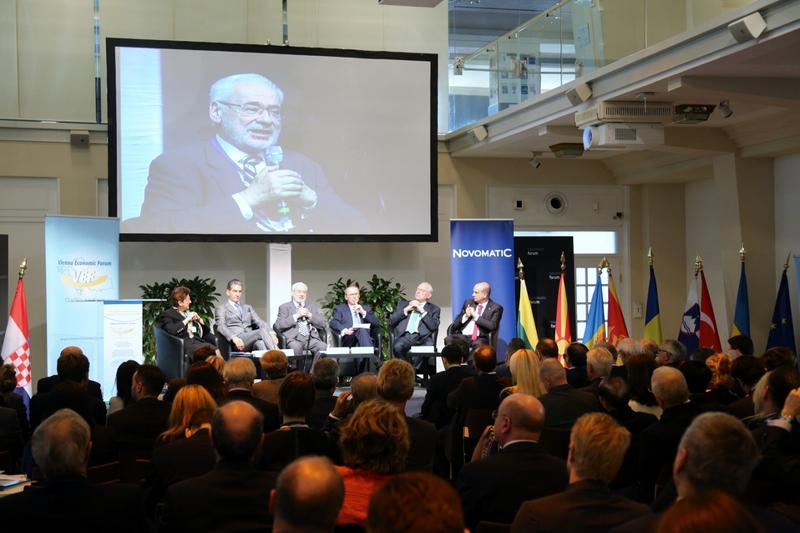 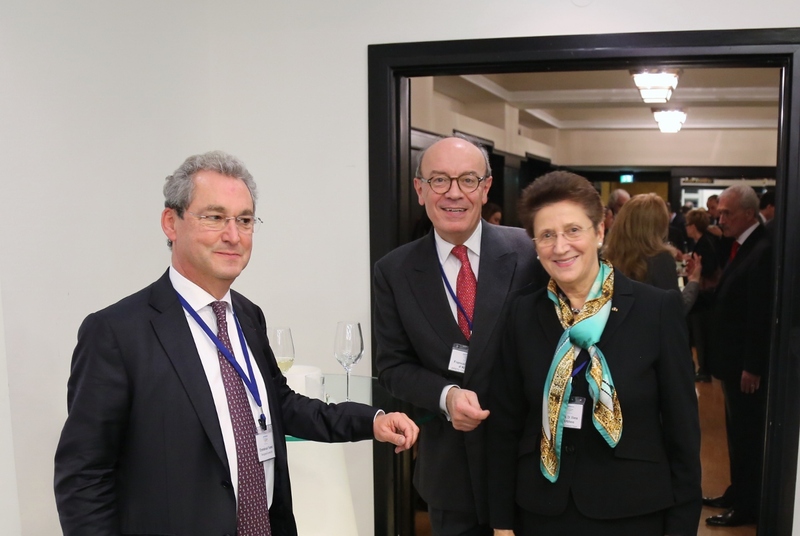 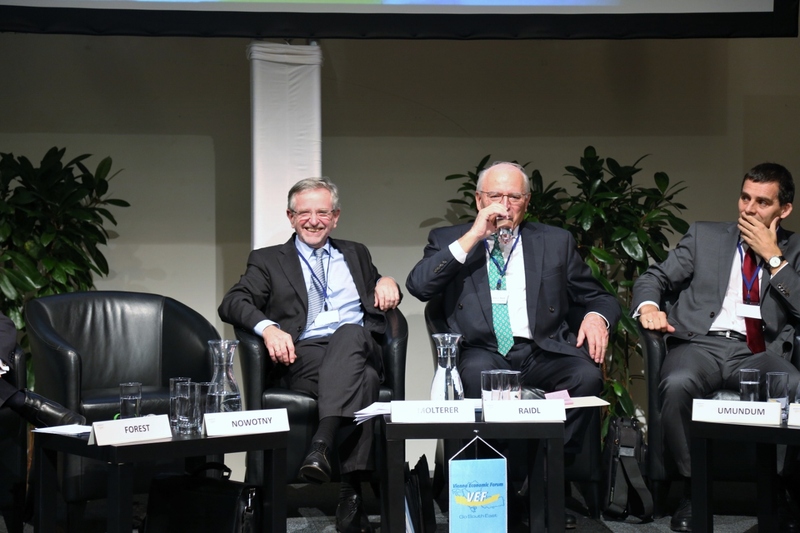 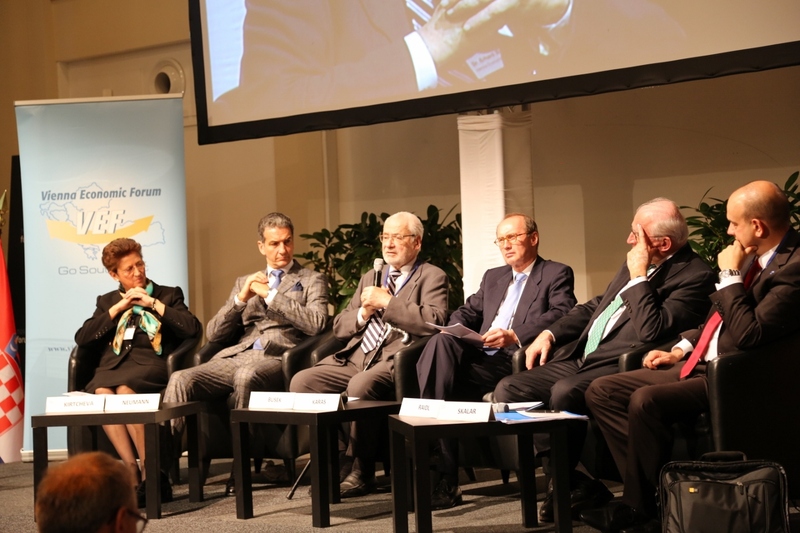 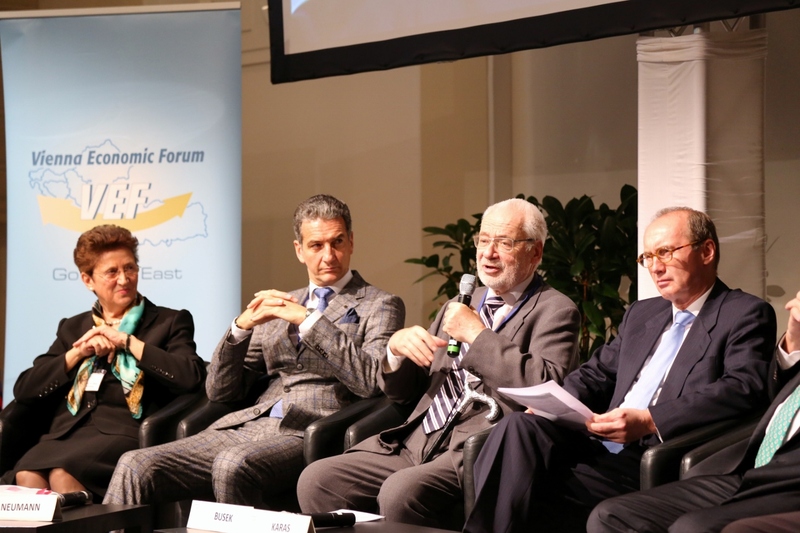 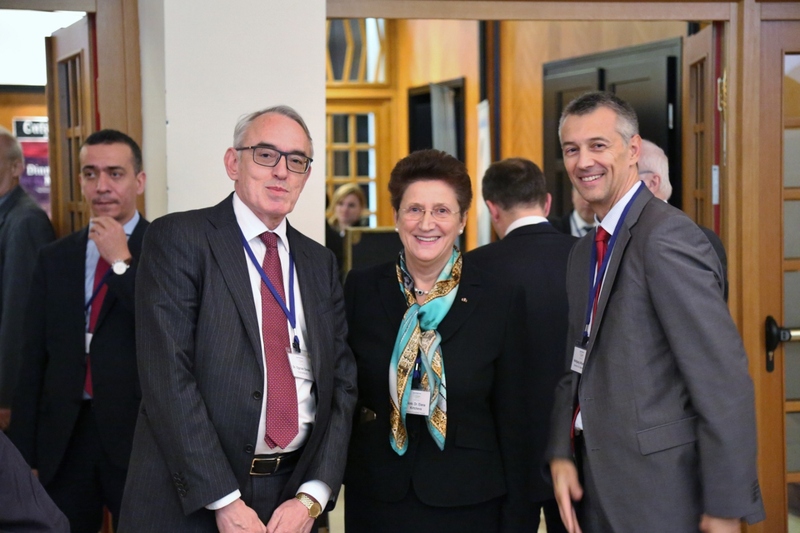 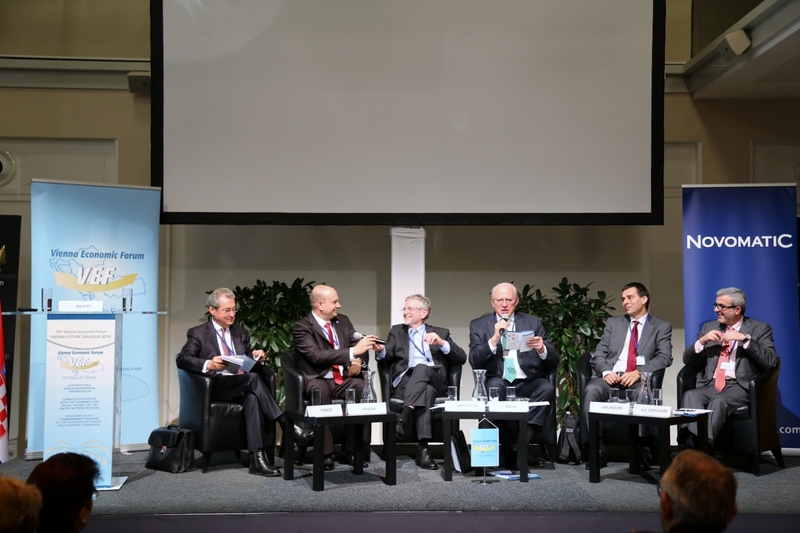 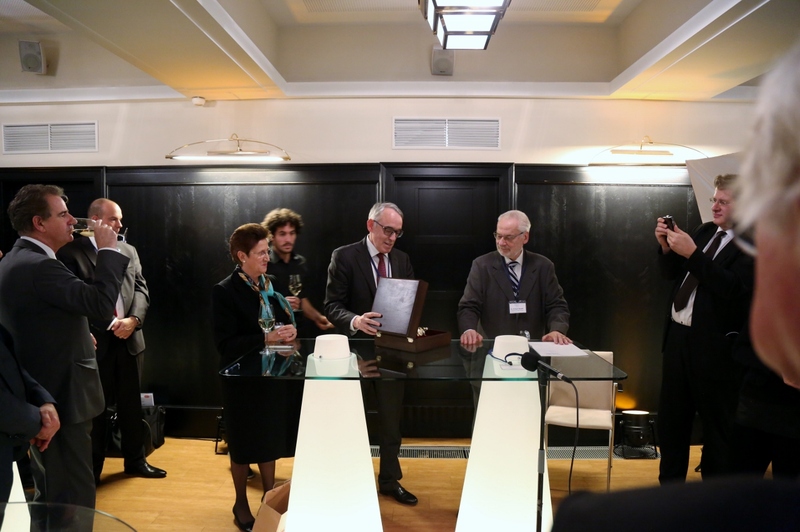 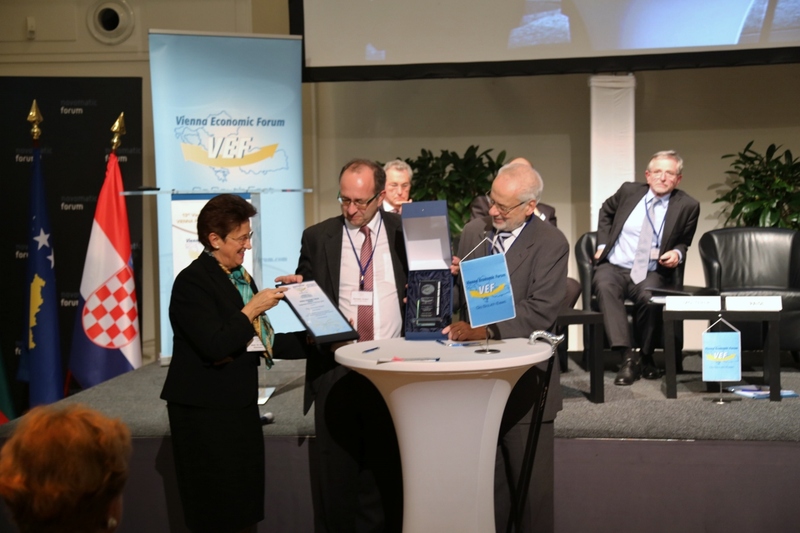 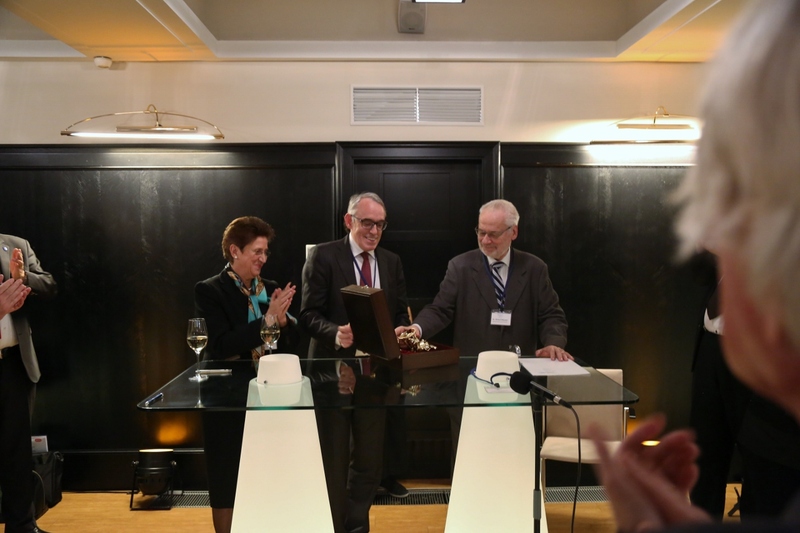 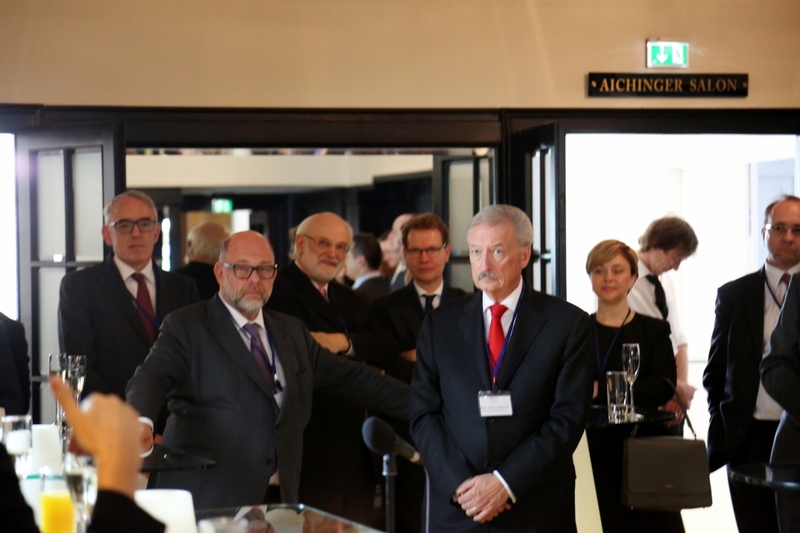 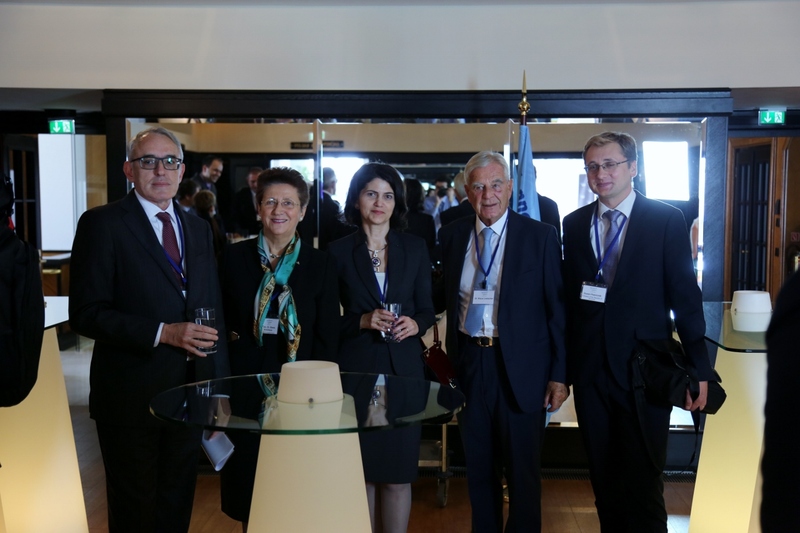 Harald Neumann and the Secretary General Ambassador Dr. Elena Kirtcheva, together with the President of Vienna Economic Forum, the former Vice-Chancellor Dr. Erhard Busek and with designated president Mag. 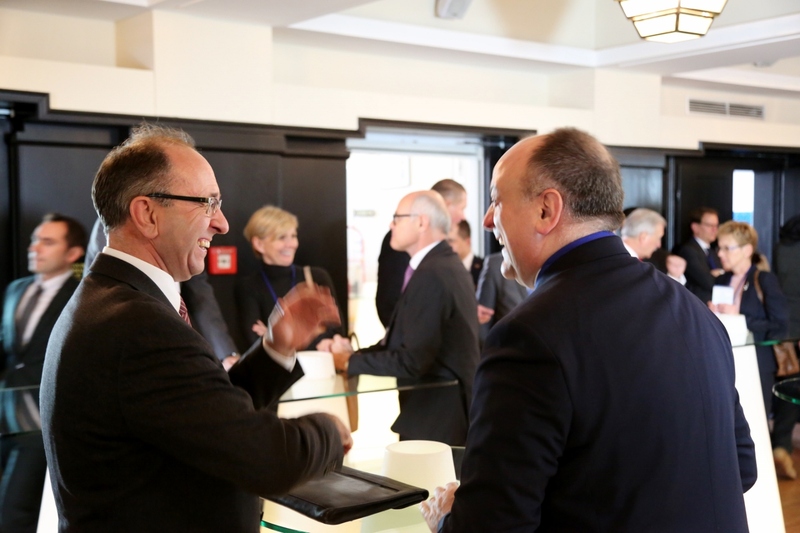 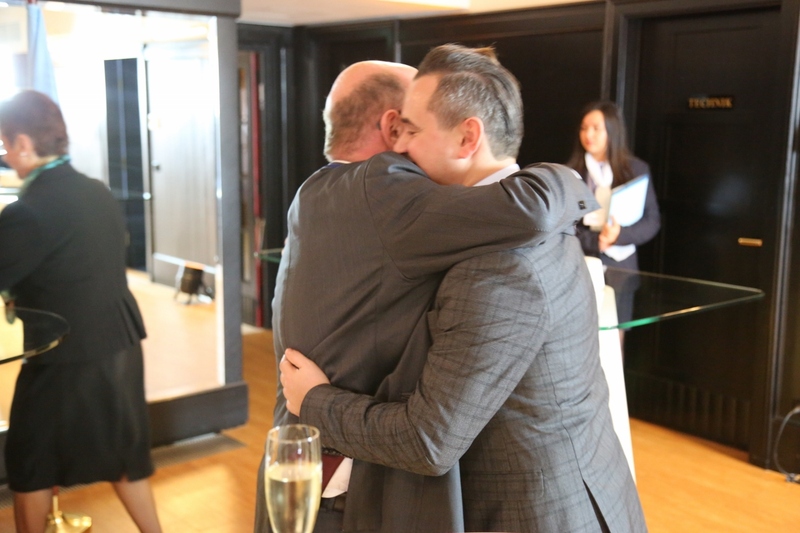 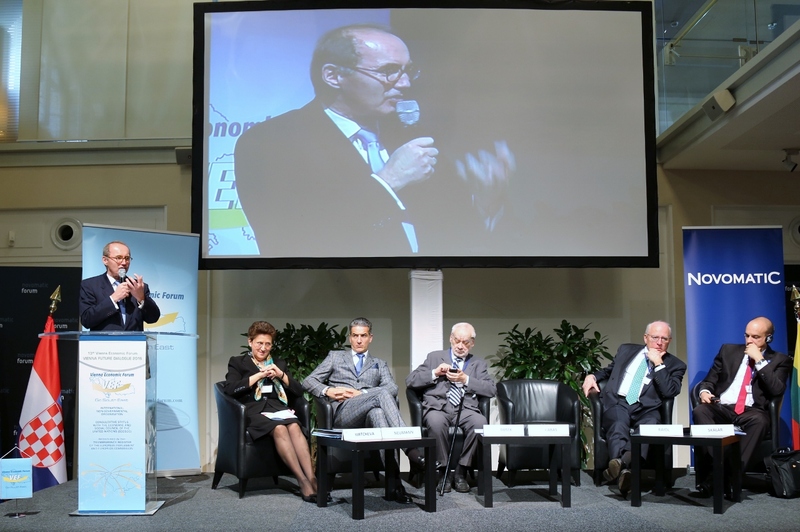 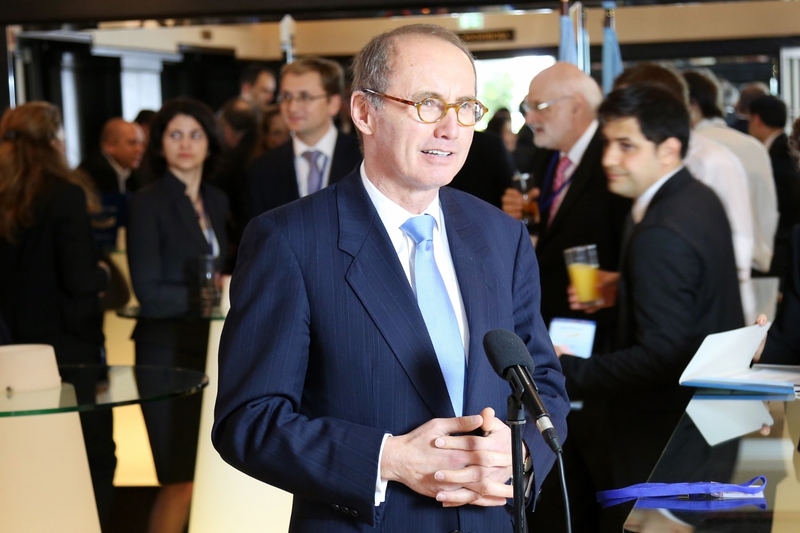 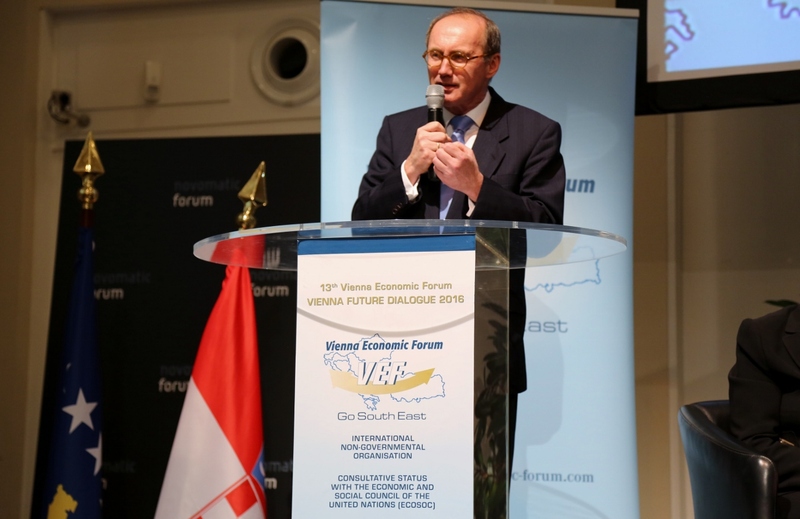 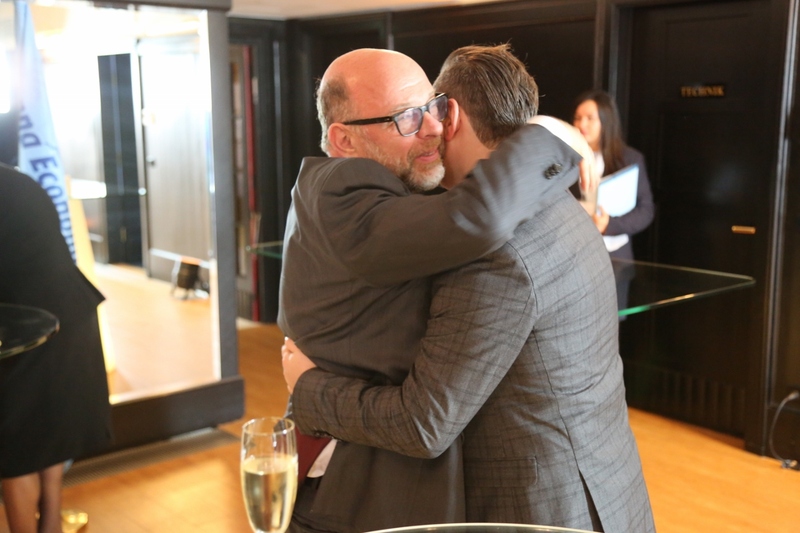 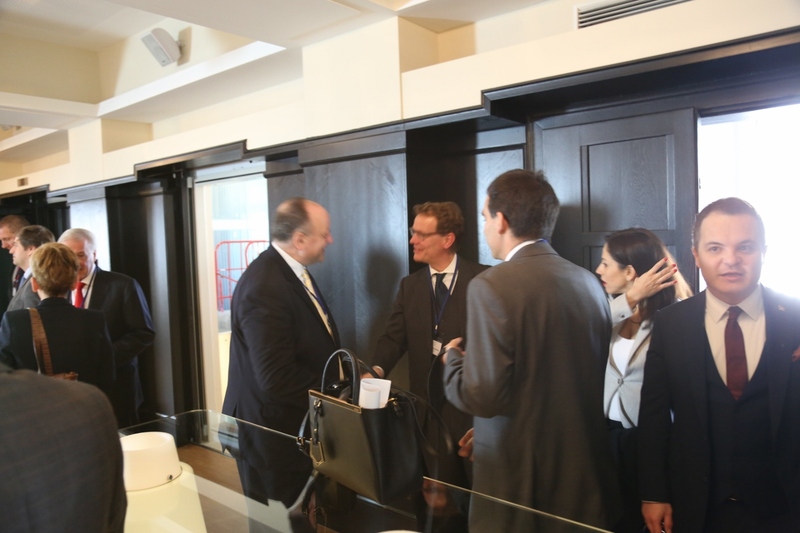 Othmar Karas, member of the European Parliament and former Vice-President of the European Parliament, greeted high-ranking participants of 37 Countries in the world. 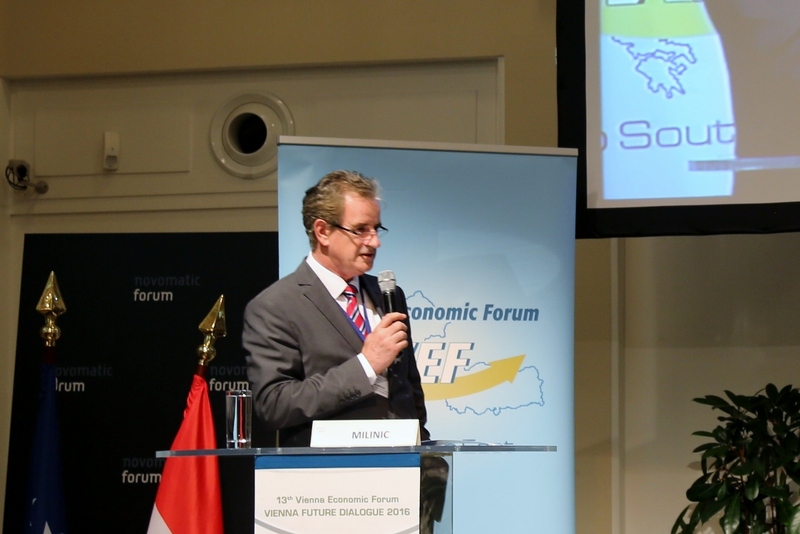 This year the focus of the 13. 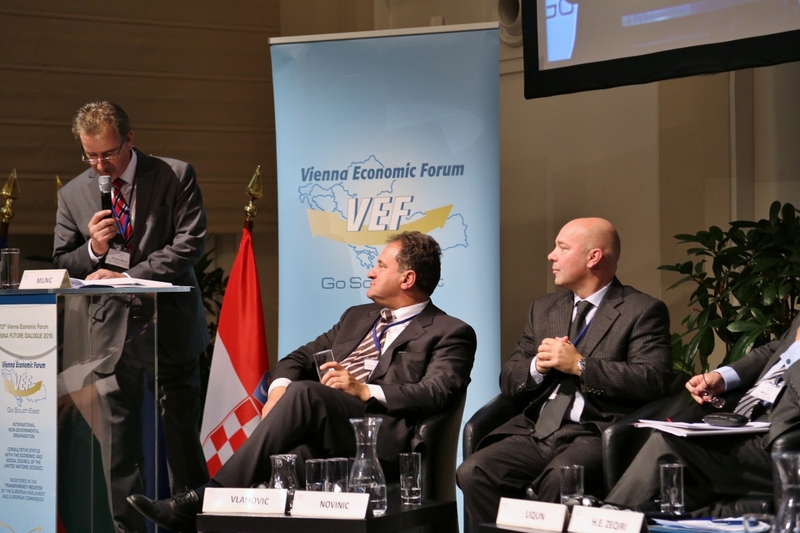 Vienna Economic Forum – Vienna Future Dialogue 2016 was dedicated on investment climate and the investment strategy in the region of the Vienna Economic Forum and beyond, with the persuasion that only by investment and demand of infrastructure projects could be ensured that the region develops and continues to play an important role. 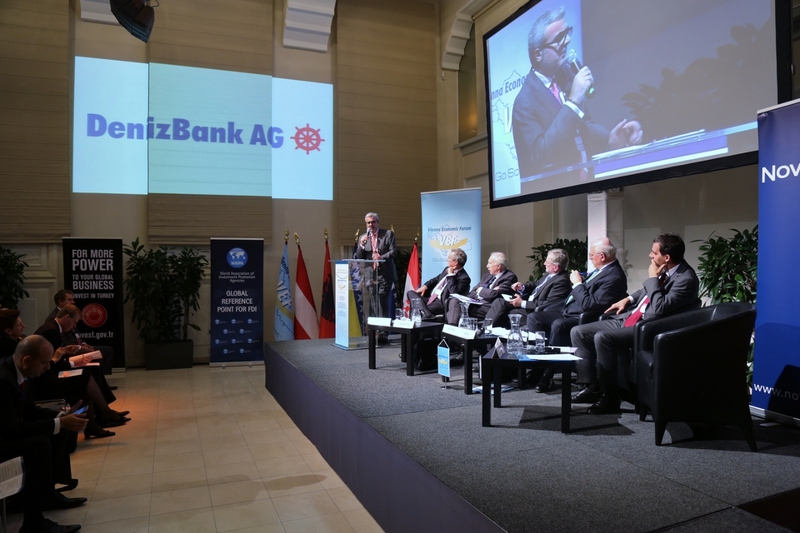 For that a lot of actors need to be mobilized as from the public sector to international financing institutions, investment and commercial banks, law offices as well as private investors. 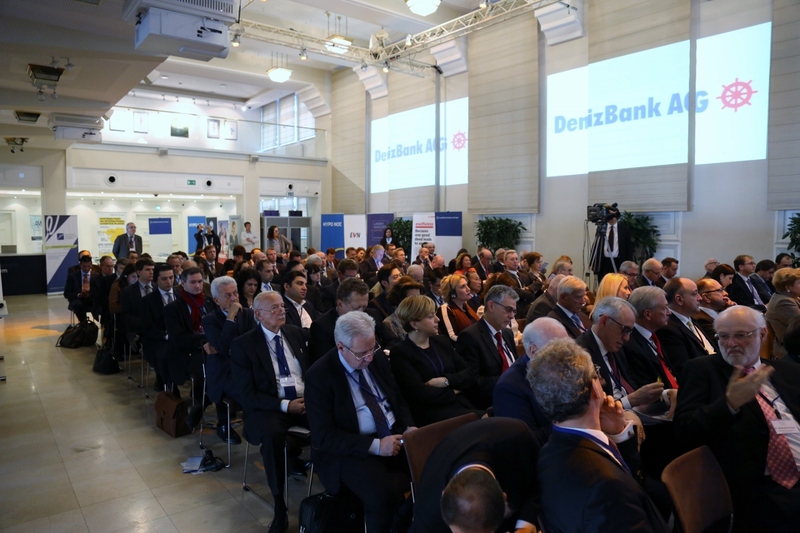 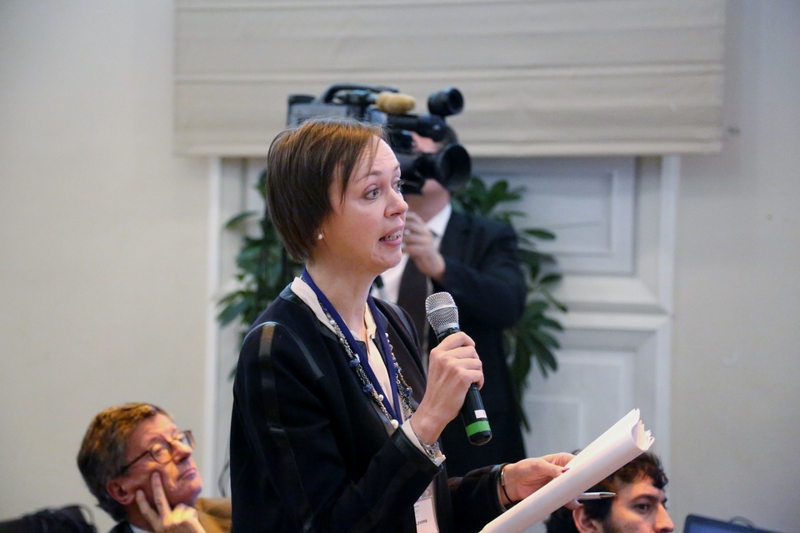 In her opening speech Secretary General Ambassador Dr. Elena Kirtcheva pointed out that these days the market conditions in a lot of countries in the world, in Europe and the region are influenced by political uncertainty. 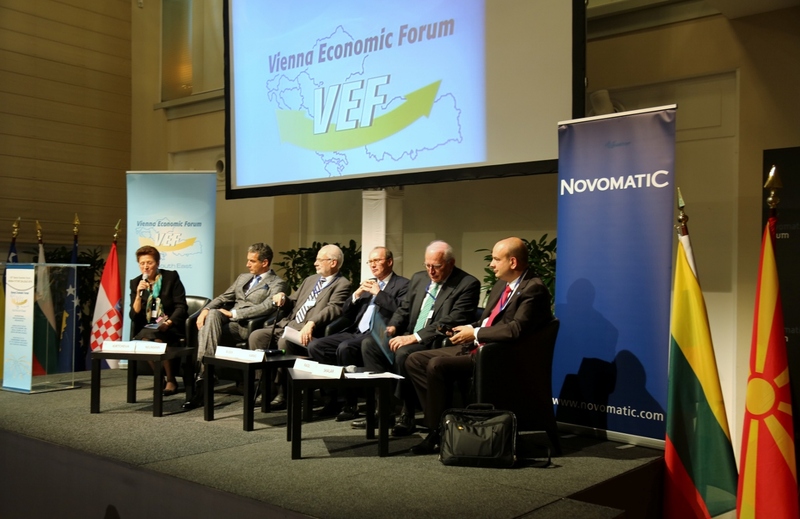 In a quite a few of the VEF-Countries elections are impending; in others- complicated government formations; somewhere government resigned, somewhere else there is talk of early elections. 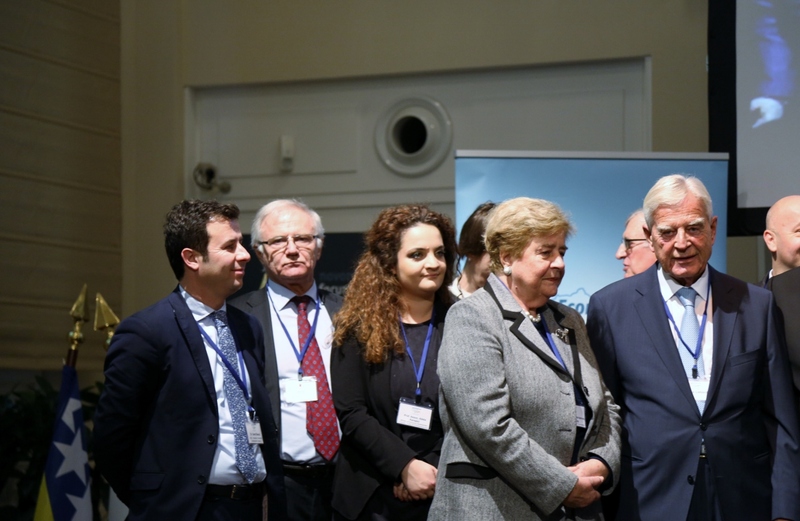 She stressed that after 25 years of constructing a peaceful and undivided Europe with good and intensive economic development, we today stand before actual efforts of political division of zones of influence, that we know from the times of the Cold War. 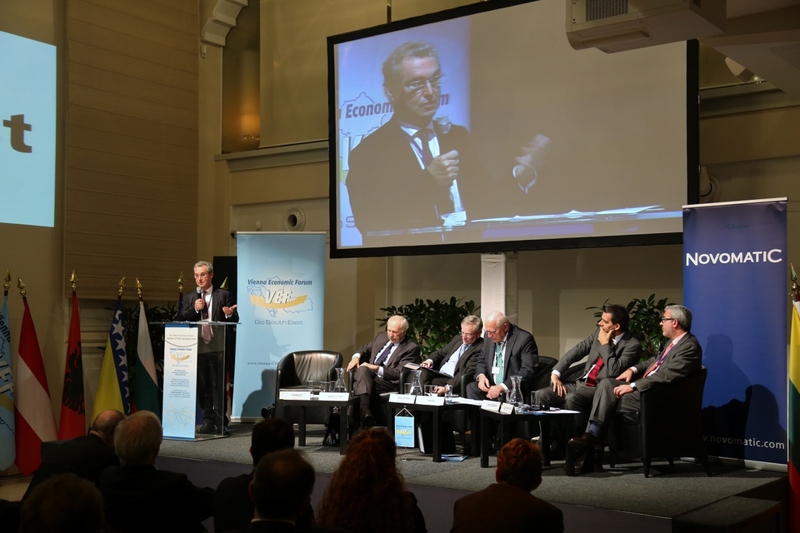 After a recent Europeanwide survey found that 72% of adolescents felt European, she appealed to the presidents of the investment agencies and the high-ranking respresentatives of the governments to be responsible in their work, this feeling – to be european – to also be mediated and facilitated in the regional economy. 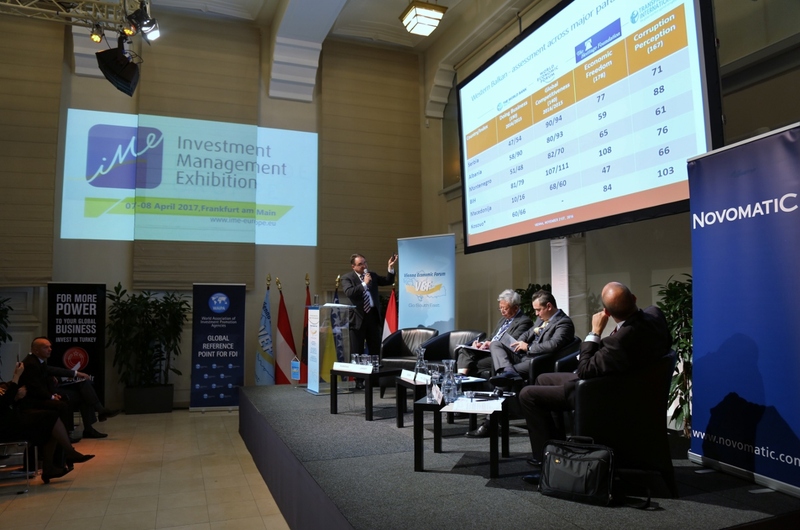 The first session, that was moderated by the Executive Director of World Association of Investment Promotion Agencies (WAIPA) Mr. Bostijan Skalar, focused on the topic „Investment Strategy in the region and worldwide – cooperation on demand“, where the perspective of investment agencies and other respresentatives of the public sectors was presented. 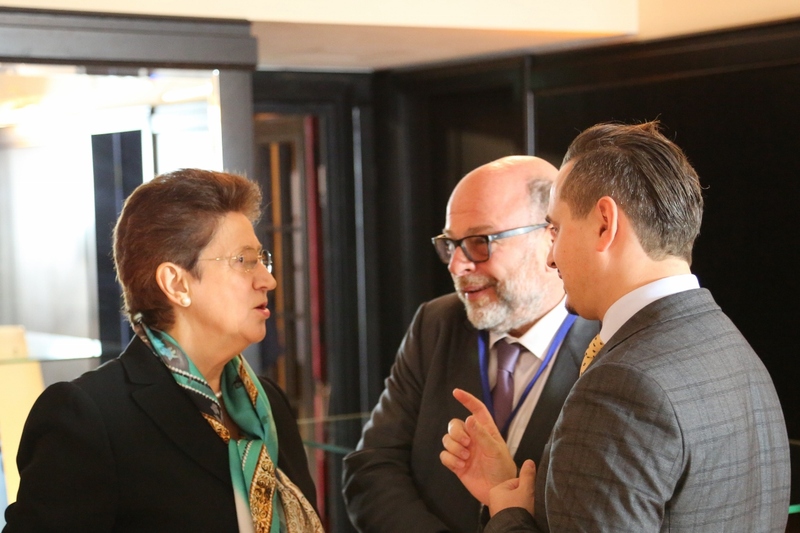 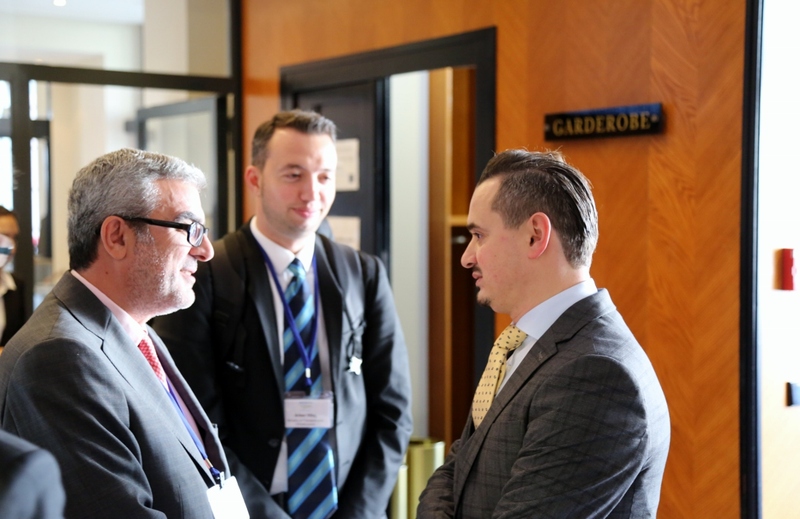 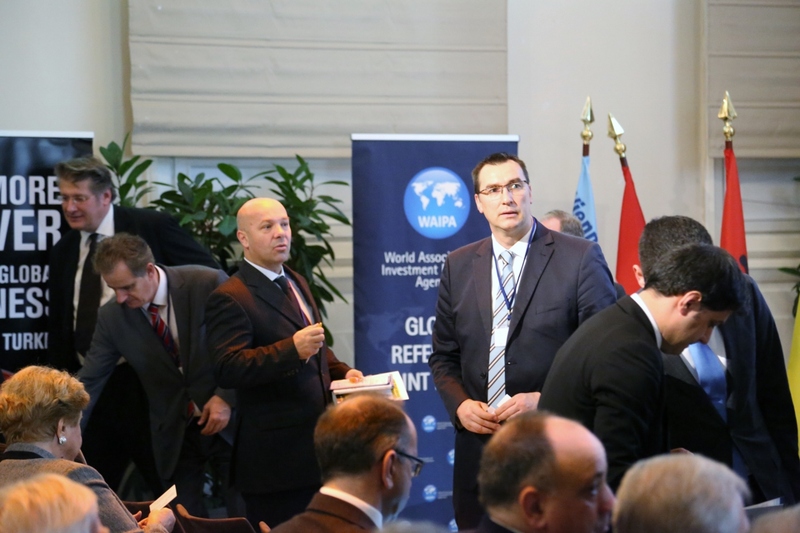 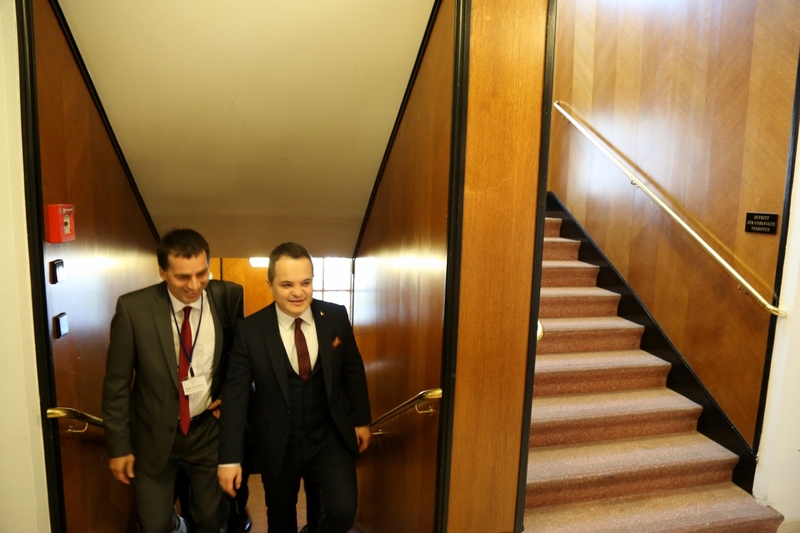 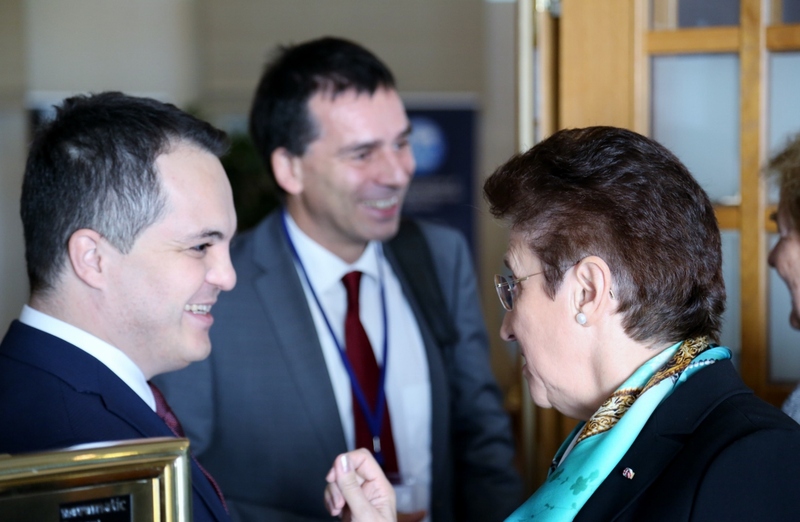 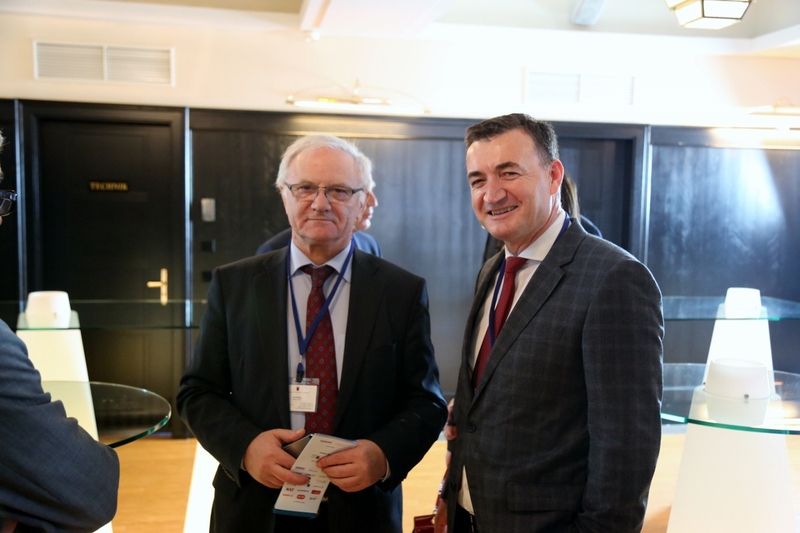 Pragmatically oriented depictions by the Secretary General of Regional Cooperation Council Mr. Gordan Svilanovic, the president of WAIPA Mr. Arda Ermut, H.E. 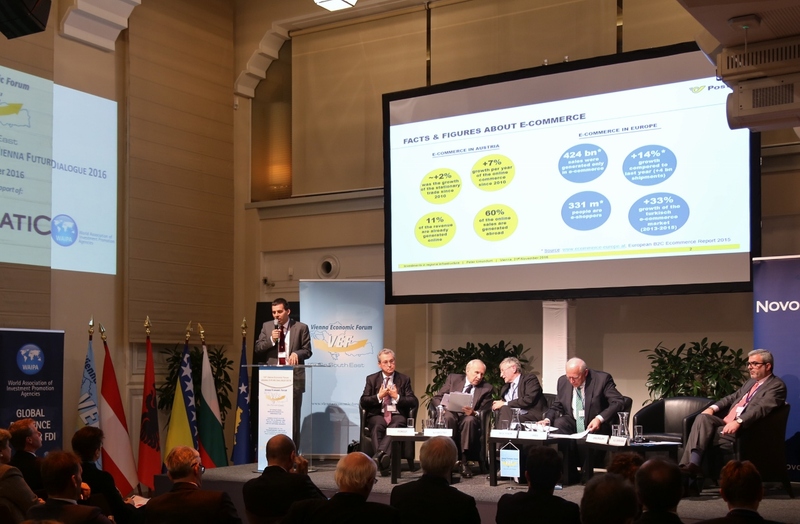 Arlind Zeqiri, Minister of Foreign Investments of Macedonia, the president of the Serbian Association of Economists Mr. Aleksandar Vlahovic, Dr. Gabriel Lansky, Partner at Lansky, Ganzger + Partner, Boardmember of the Vienna Economic Forum, Mr. Jin Liqun President of the Asian Investment Infrastructure Investment Bank (AIIB) with based in China, Mr. Damir Novinic, Managing Director of the Agency for Investments and Competitiveness of Croatia and member of the Vienna Economic Forum Investment Agency Committee and Mr. Gordan Milinic, Director Foreign Investment Promotion Agency of Bosnia and Herzegowina (FIPA) and member of the Vienna Economic Forum Investment Agency Committee, were followed by lively discussions. 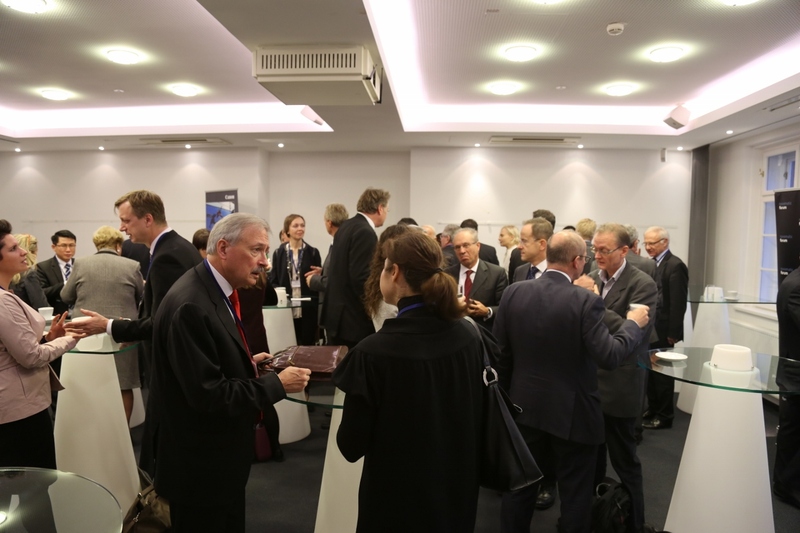 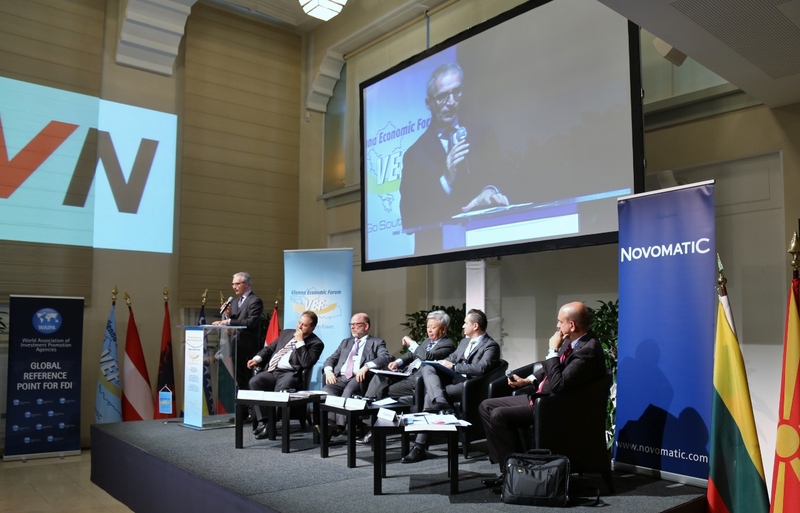 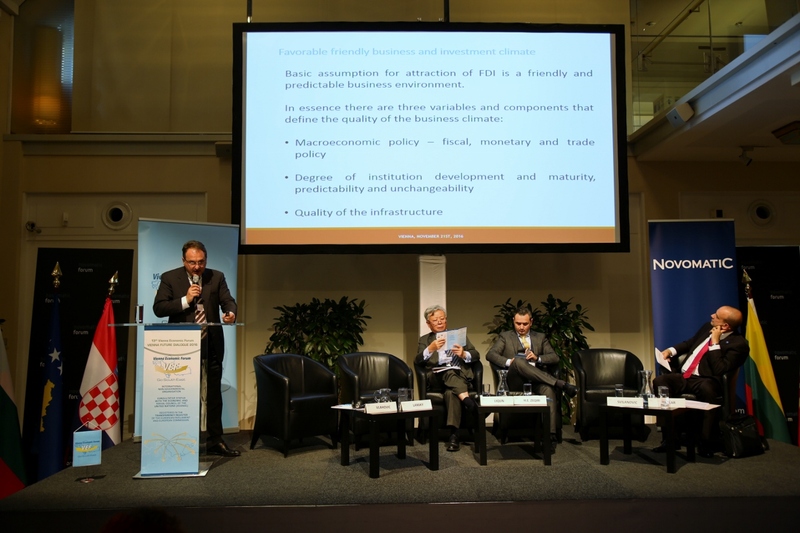 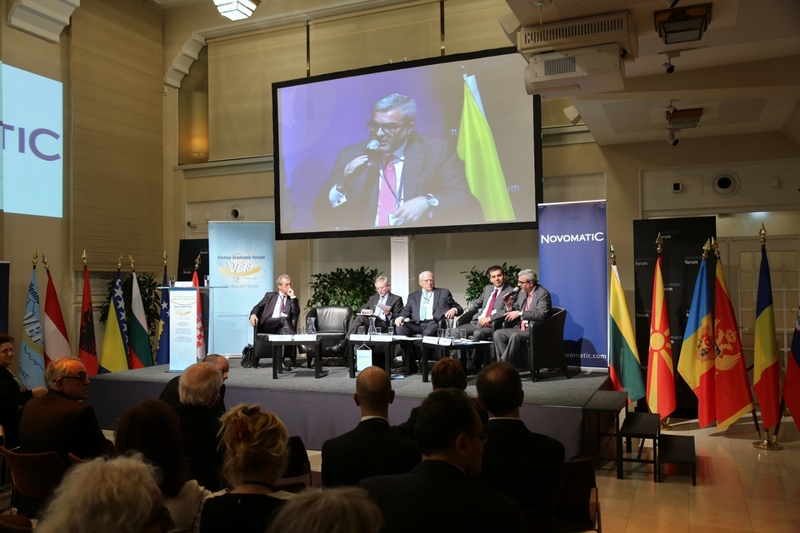 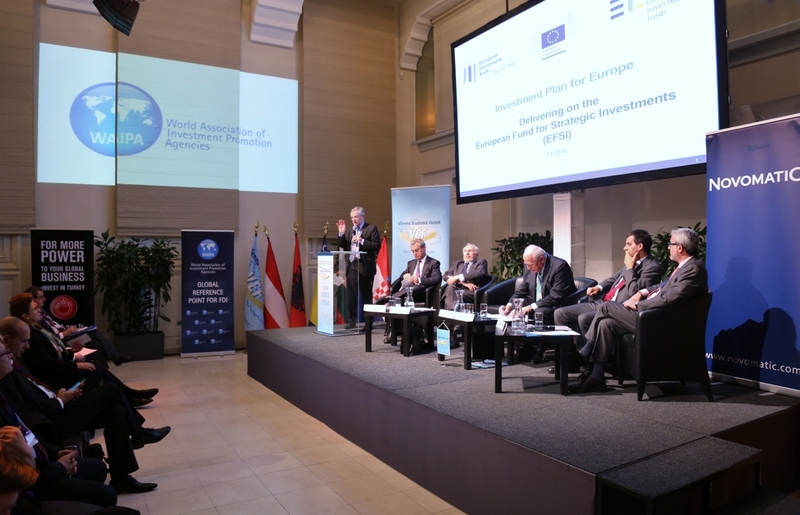 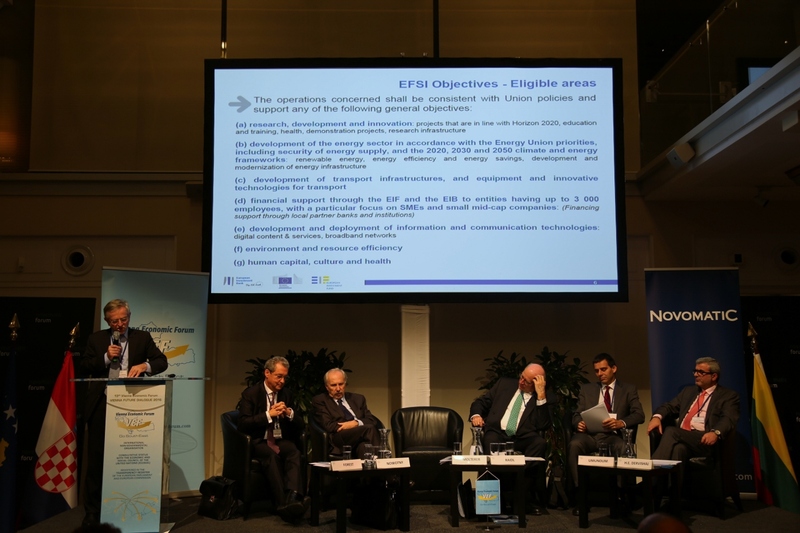 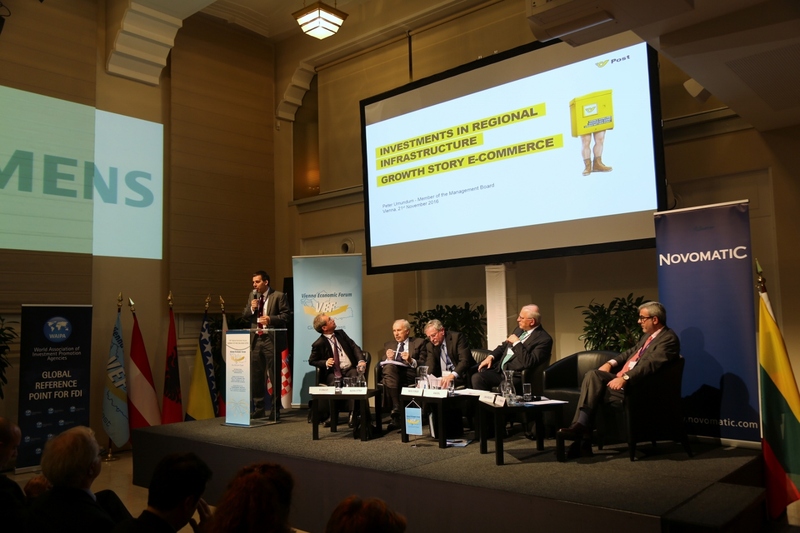 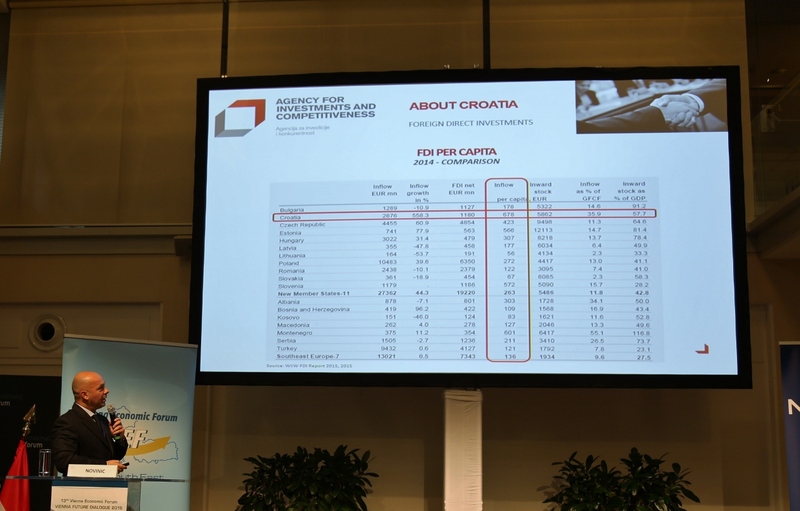 In the Second Plenary Sessions, investments in regional infrastrcture in present, turbulent times were discussed, that are also focus of the European Fond for Strategic Investments (EFSI) and of the „Juncker Plan“. 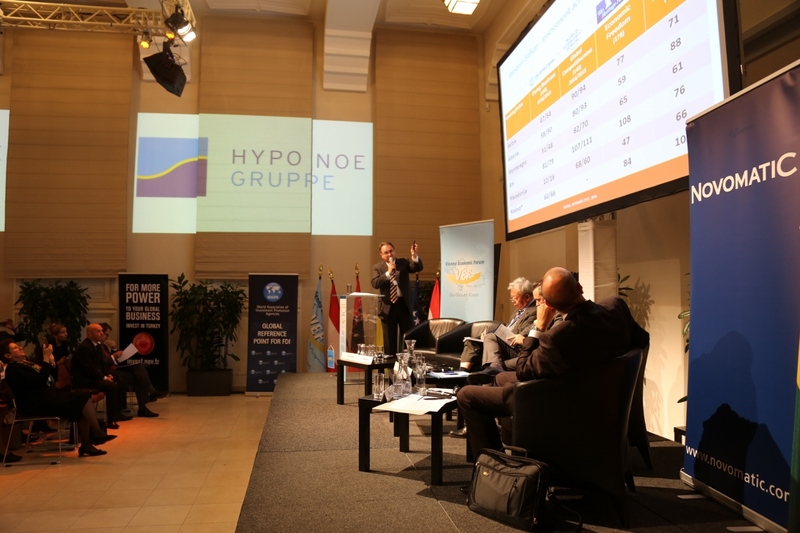 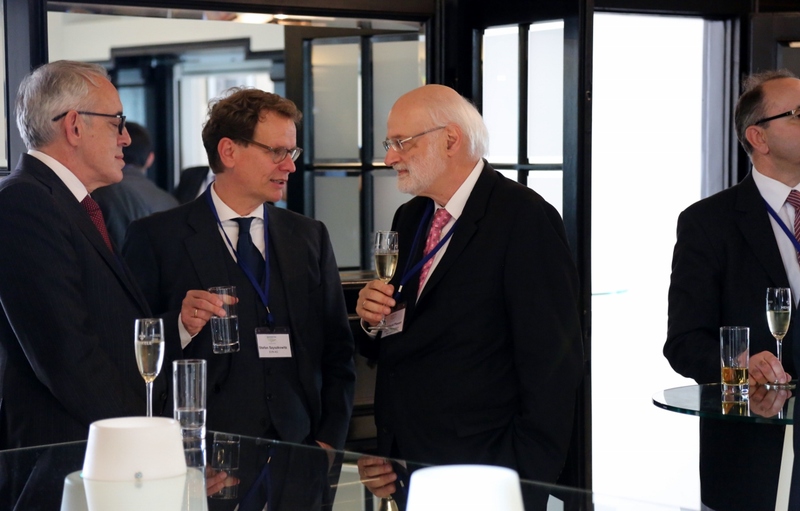 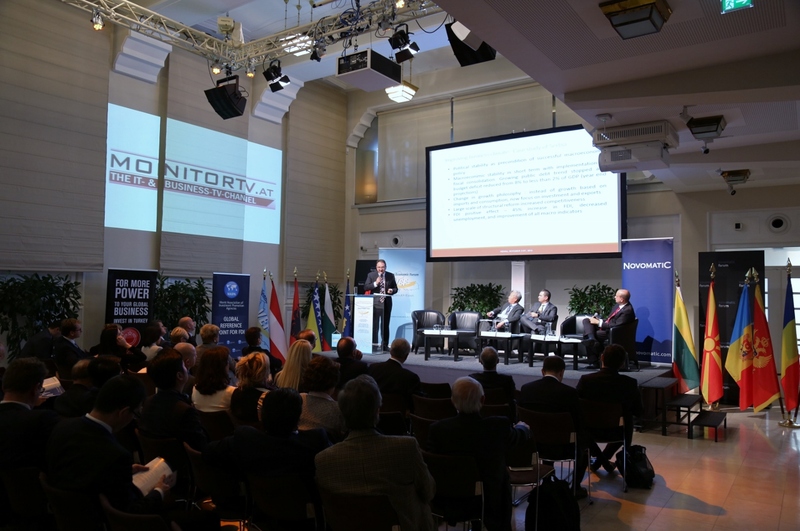 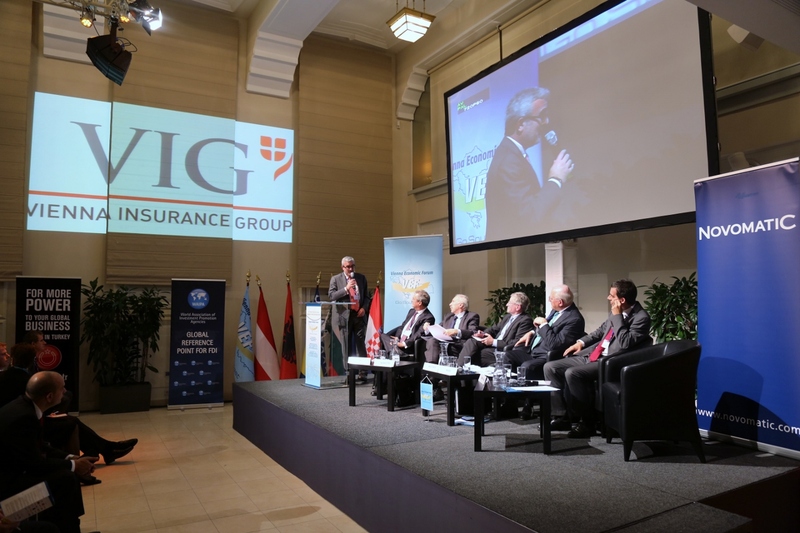 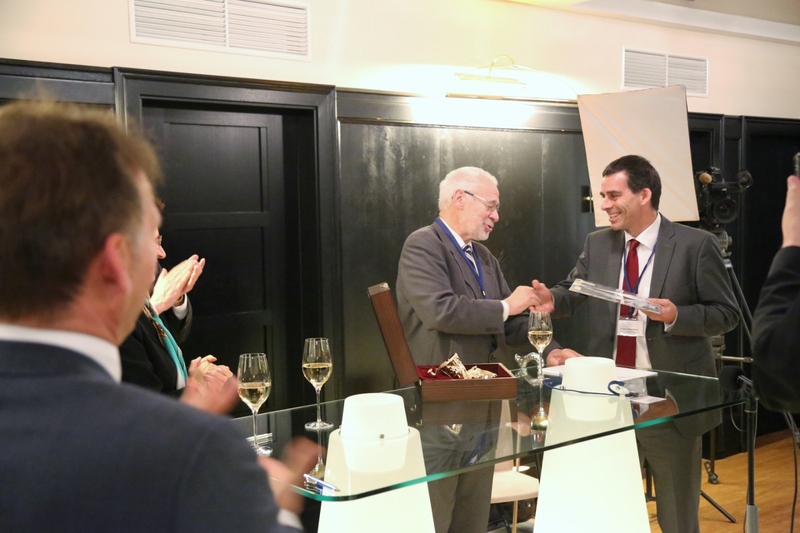 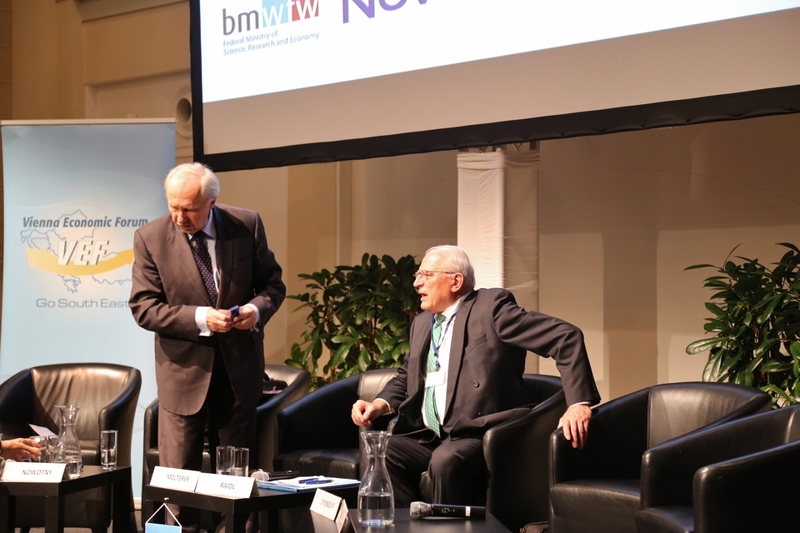 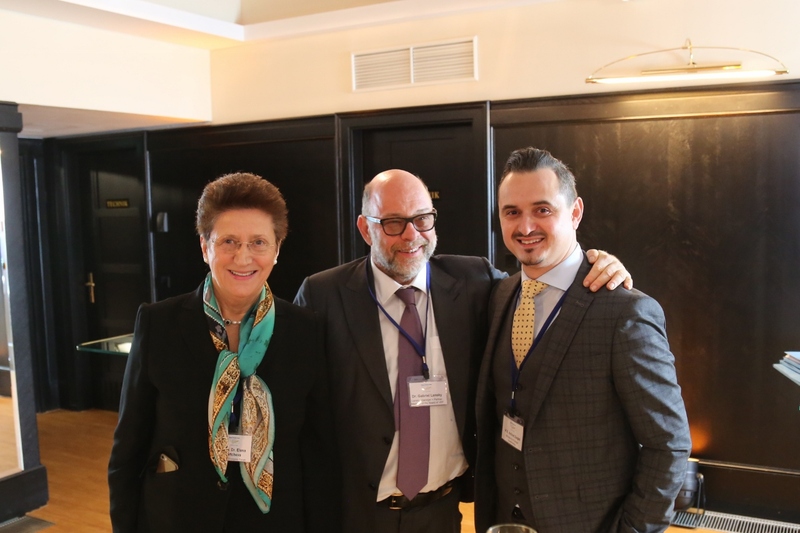 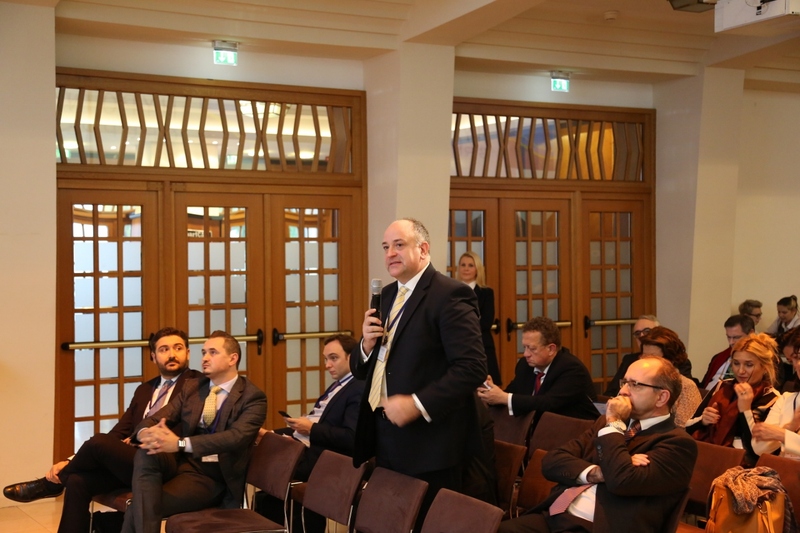 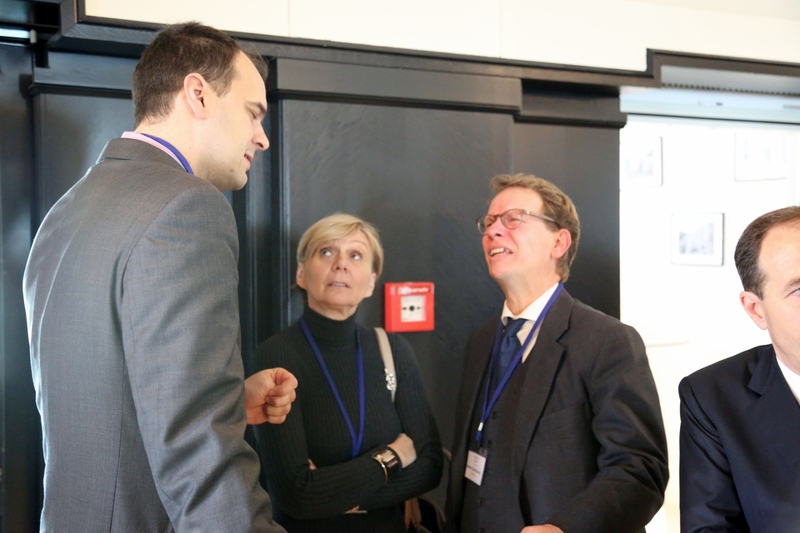 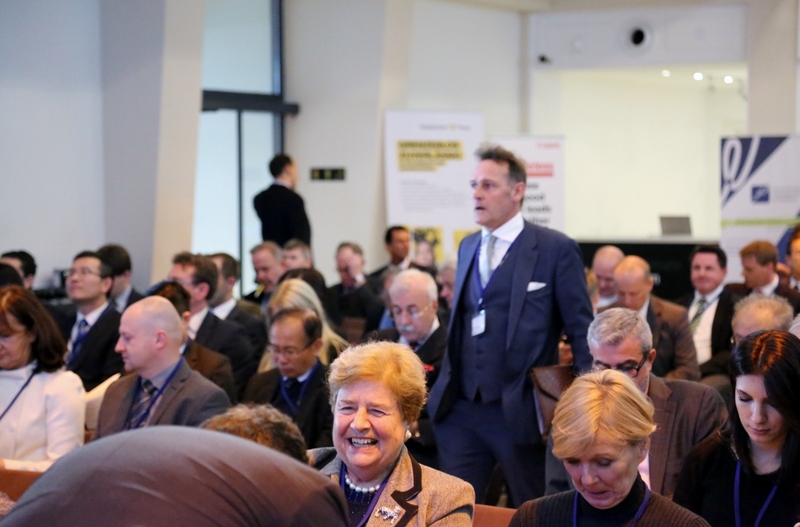 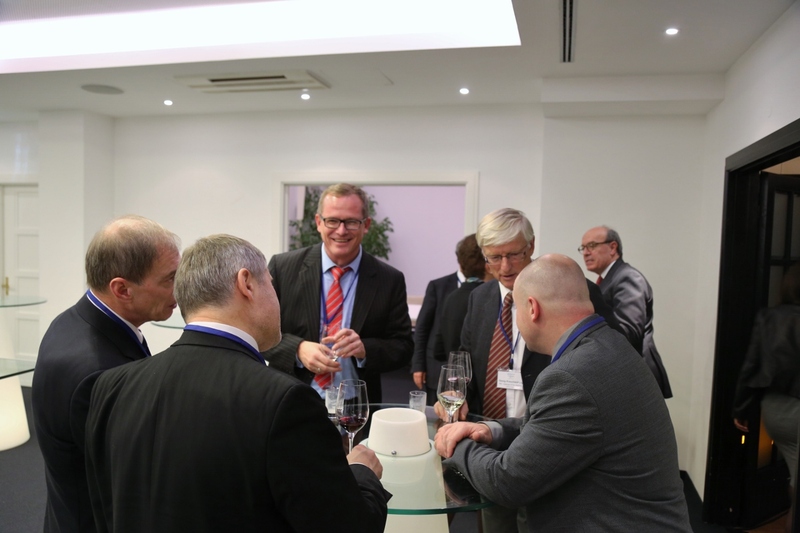 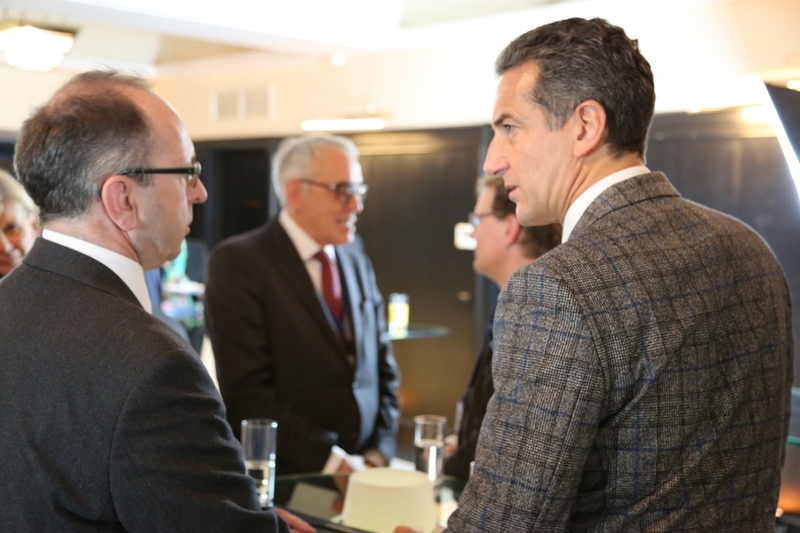 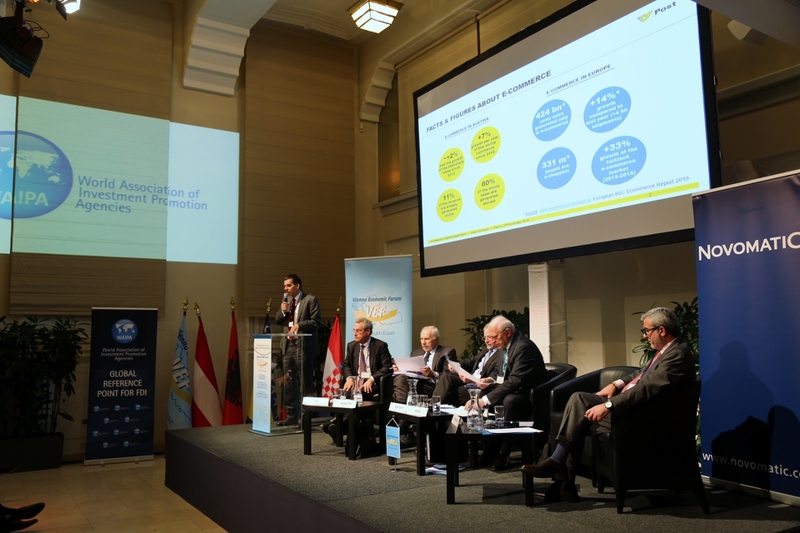 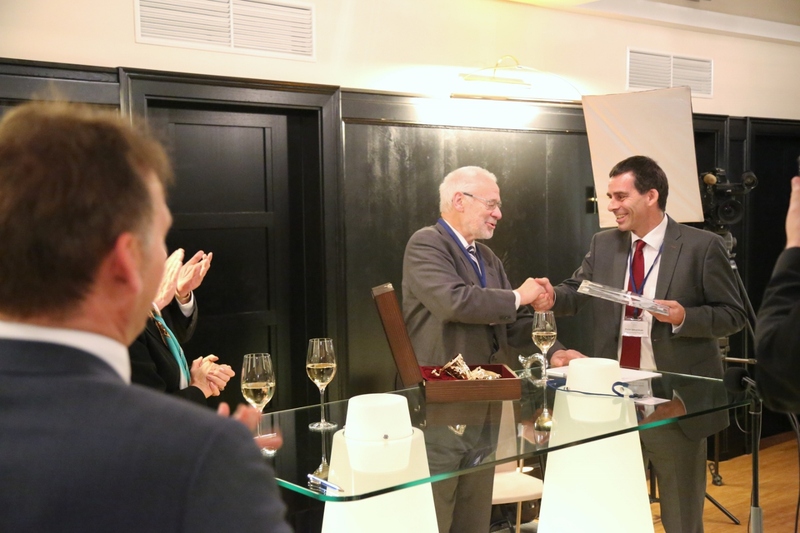 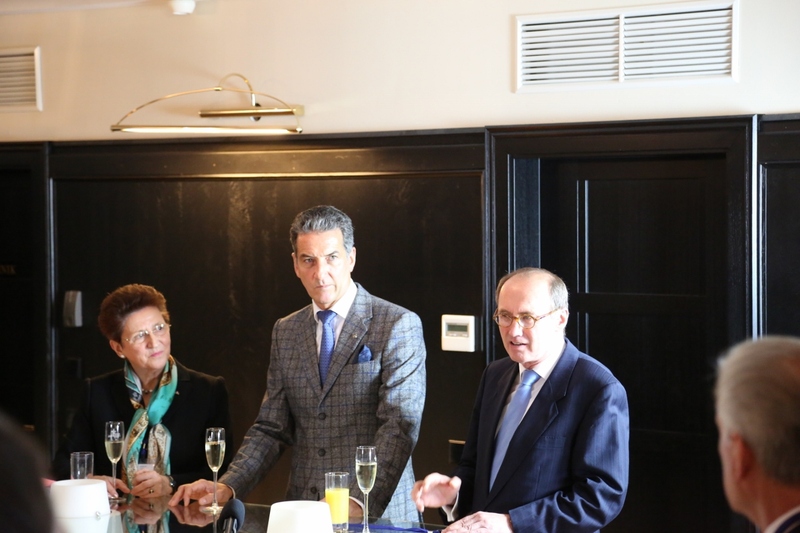 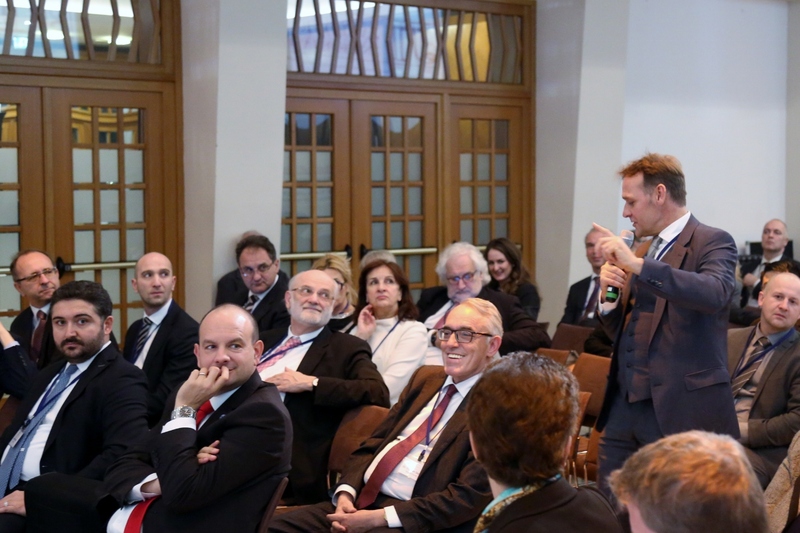 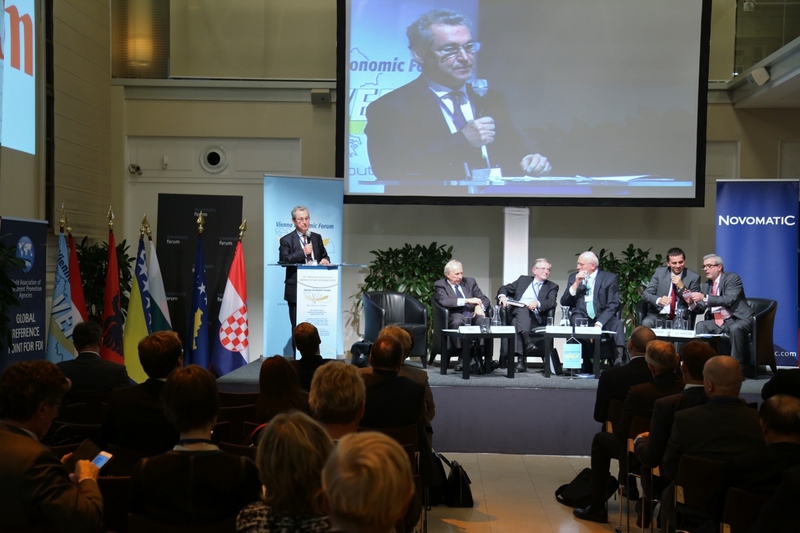 By moderation of Dr. Claus Raidl, President of the Austrian National Bank, with Introductory Statement of the Gouvernor Prof. Dr. Ewald Nowotny and Main Statement of the Director of EFSI Mag. 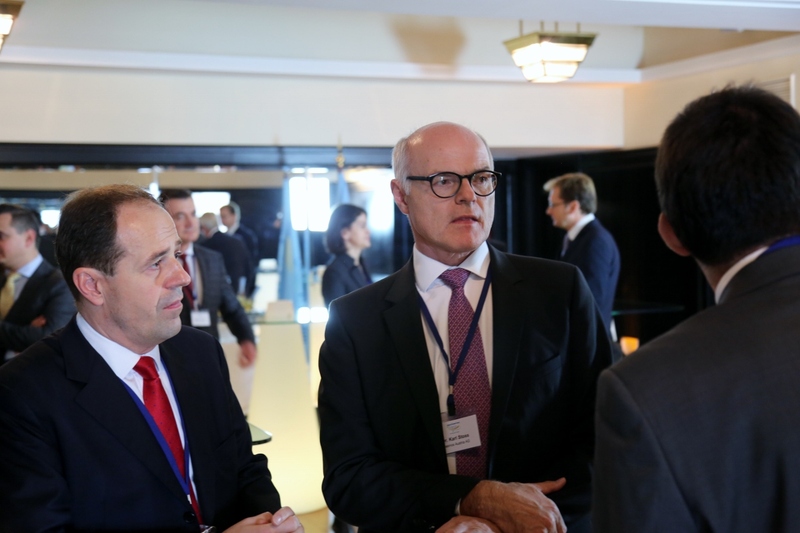 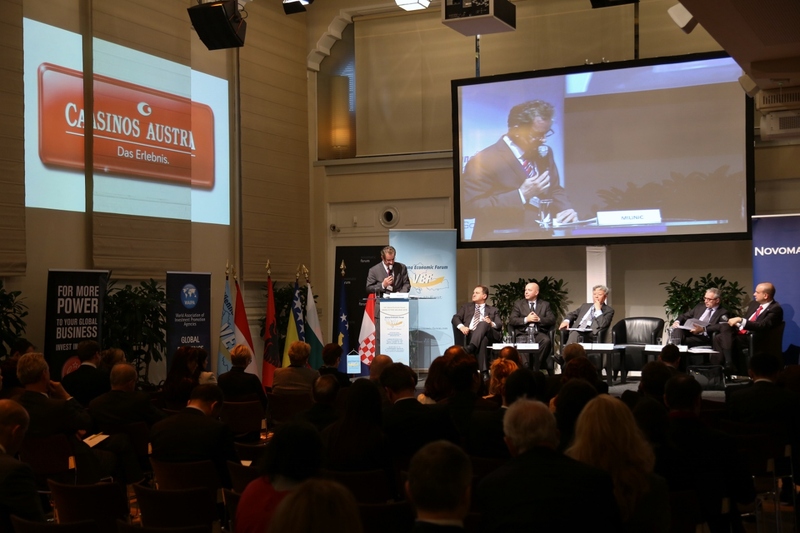 Wilhelm Molterer, the speakers, among them DI Peter Umundum, member of the Board of the Oesterreichische Post AG and Vienna Economic Forum, H.E. 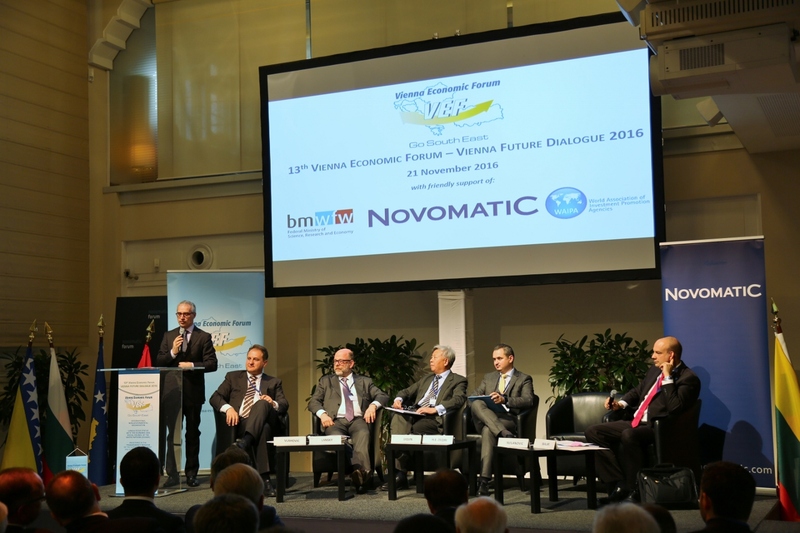 Sokol Dervishaj, Minister of Transport and Infrastrcutre of Albania, Mr. Emmanuel Forest, CEO of BOUYGUES Europe SA, Belgium and Vienna Economic Forum Boardmember, Mr. Ingo Bleier, Head of Group Corporates, Erste Group Bank AG, Austria and Mr. Holger Muent, Director, Western Balkans, European Bank for Reconstruction and Development (EBRD) based in London, UK, targeted the search for pragmatic solutions, for the Balcans, as well as other countries of the Vienna Economic Region, that are far behind in the demand of provided resources. 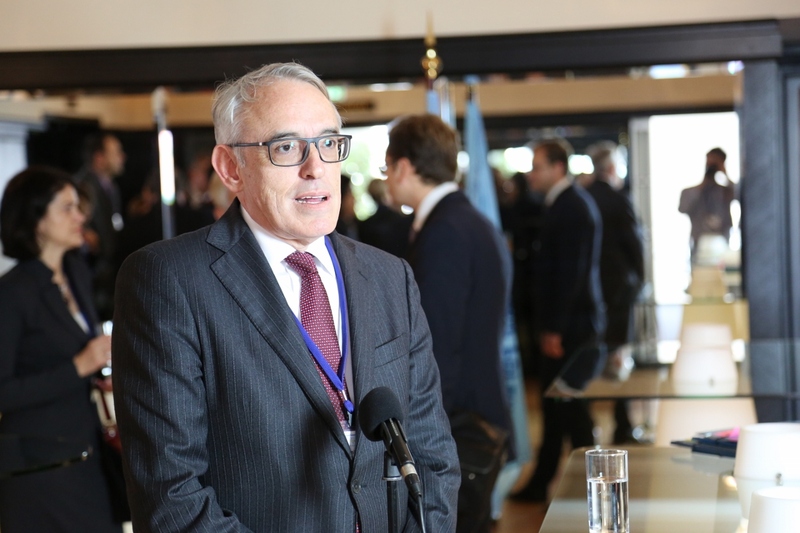 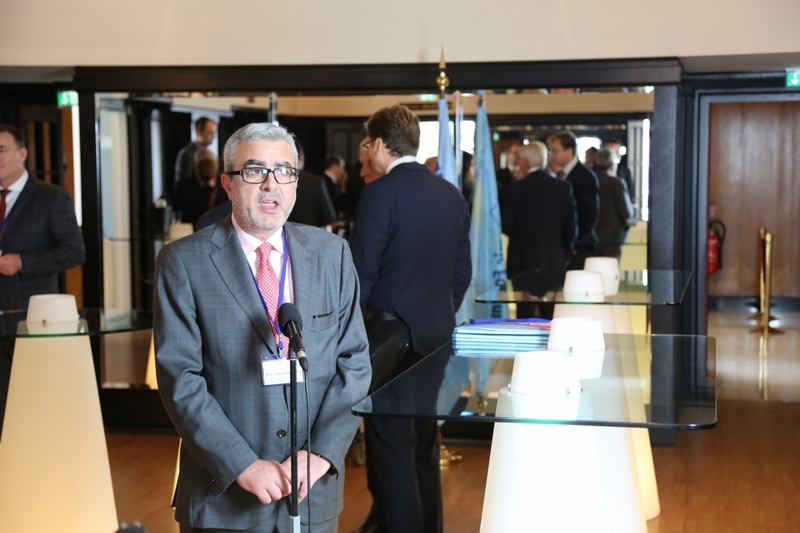 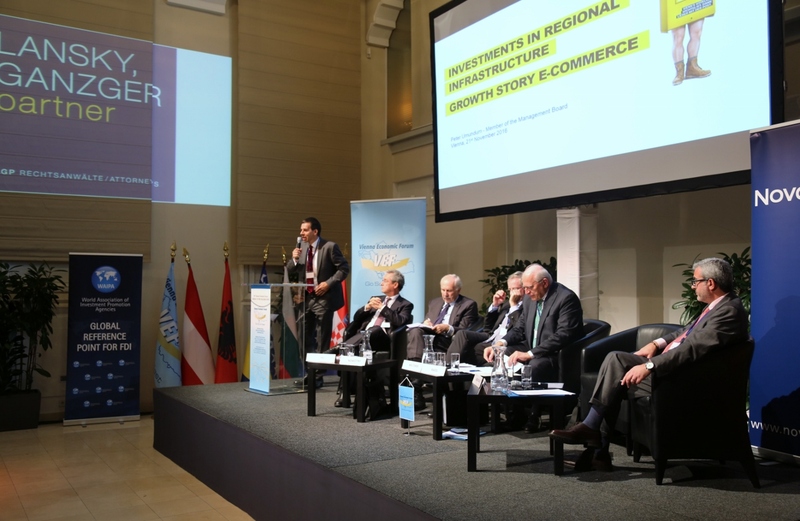 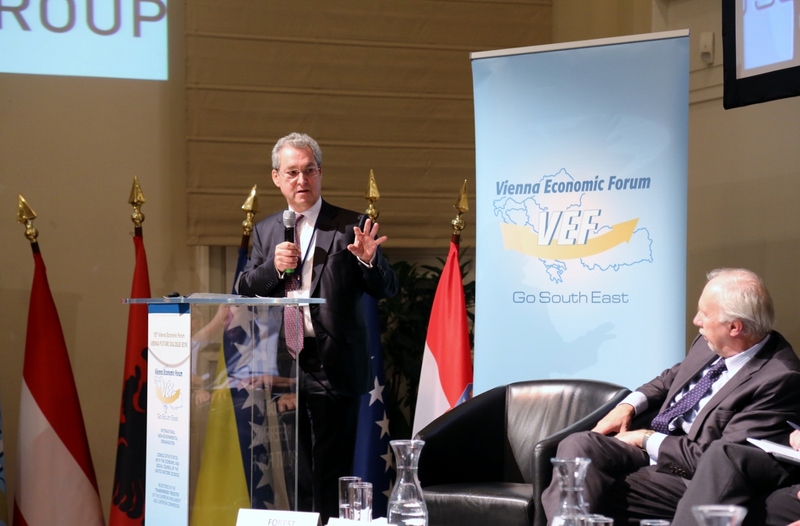 Further critical points, for the region unavoidable, were emphasized and in a lively discussion determined that located in Vienna a genuine, relevant and big impulse for the further development of the regional economic cooperation could be given. 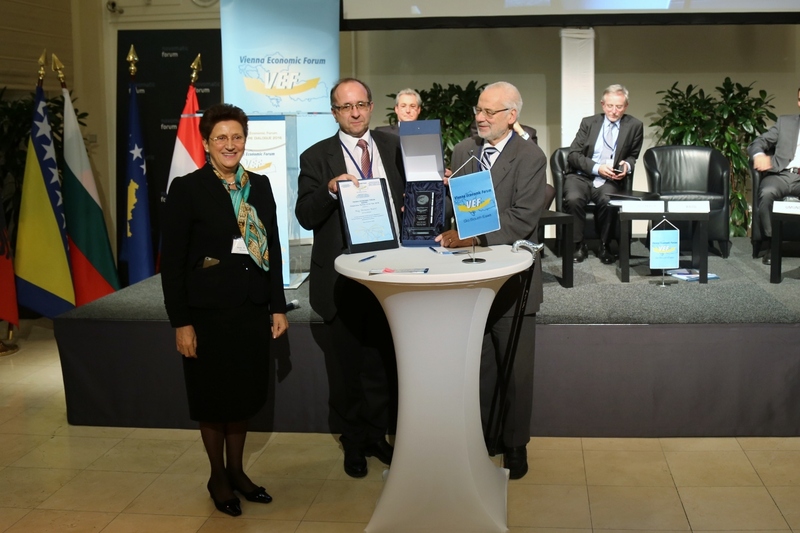 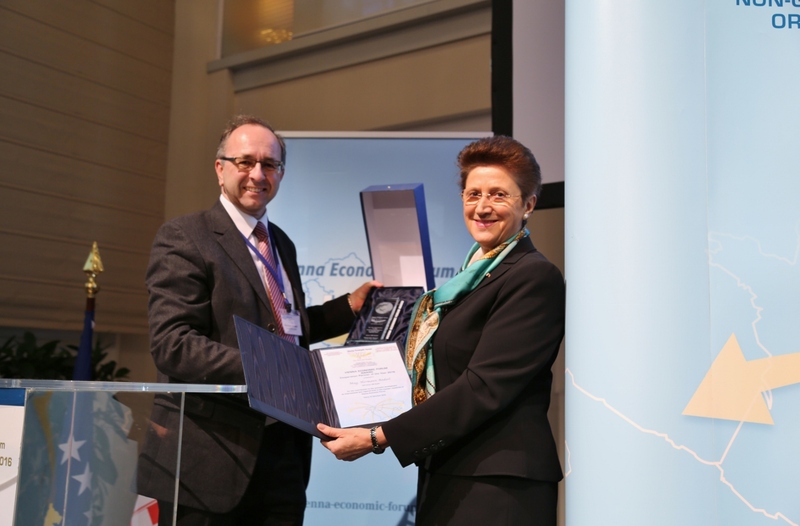 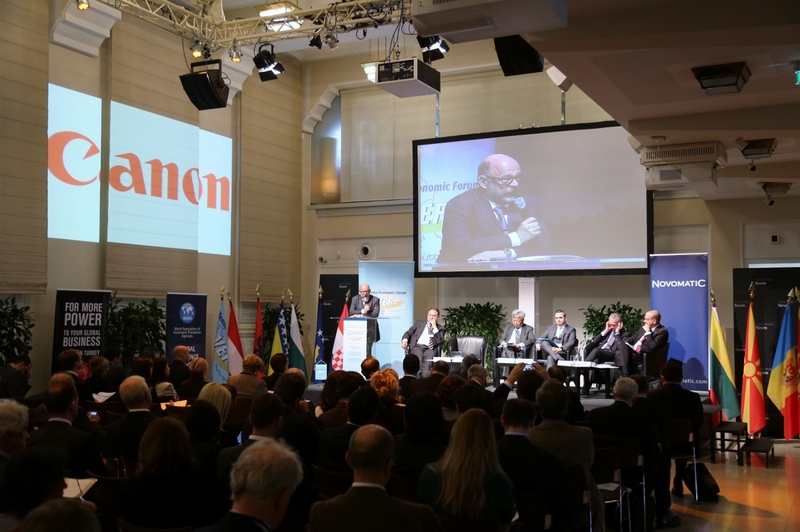 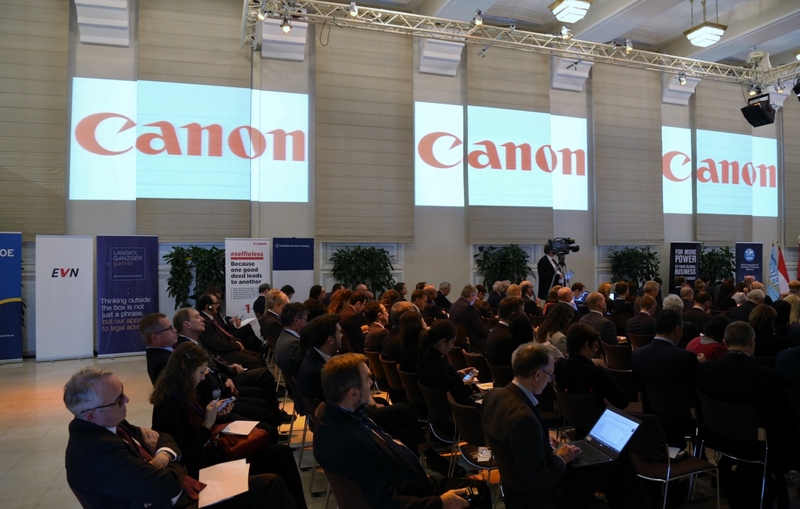 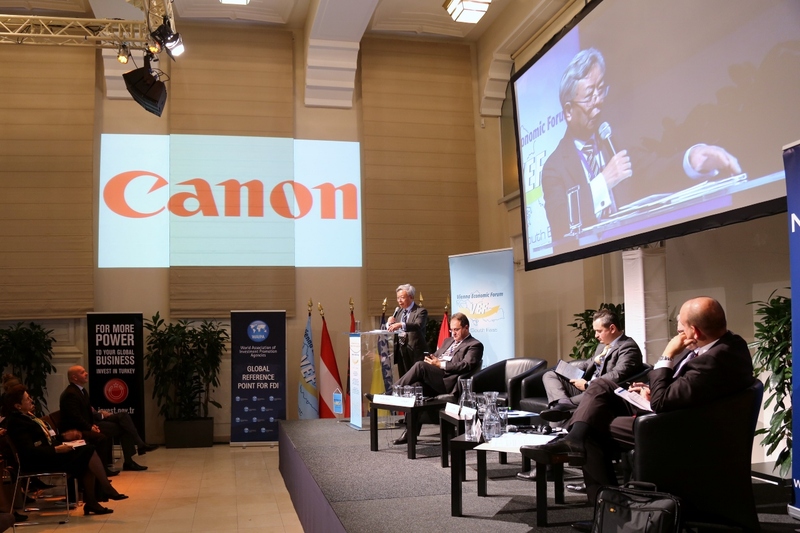 At the end of the panel discussions, at the traditional VEF-Award Ceremony, the nomination of Canon CEE GmbH as Cooperation Partner of the Year 2016 was announced, the Vienna Economic Forum – Award 2016 was received by the Canon CEO Mag. 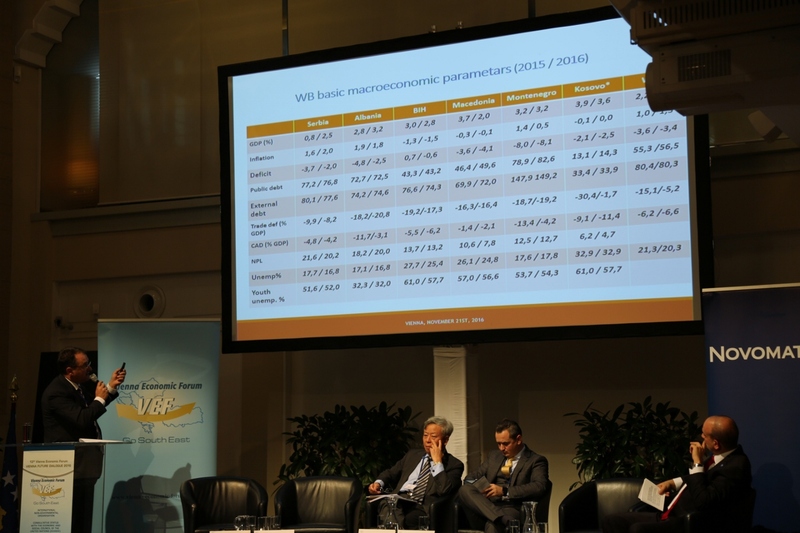 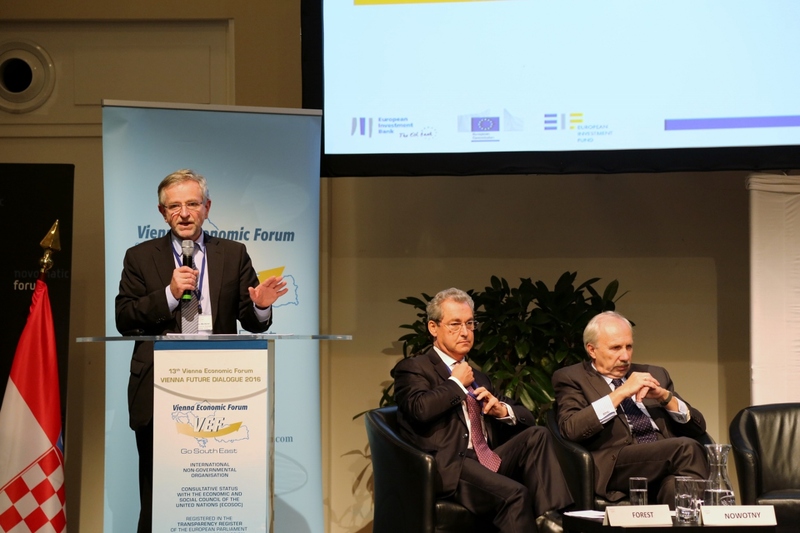 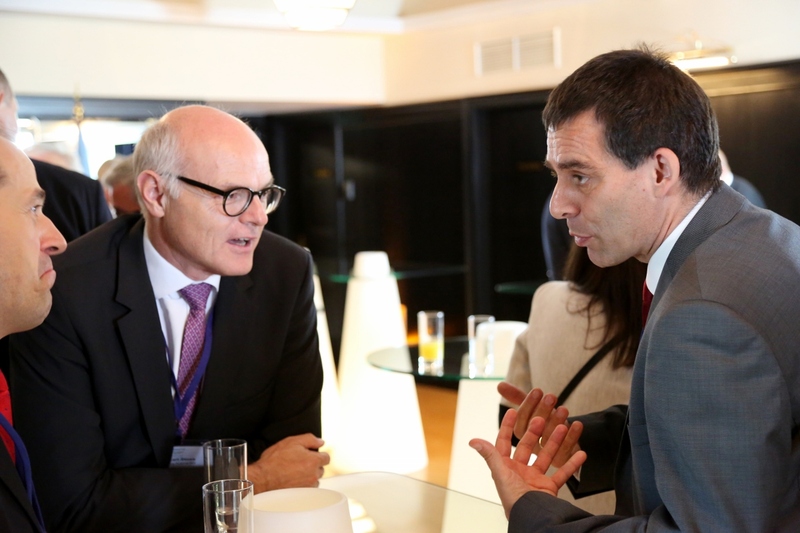 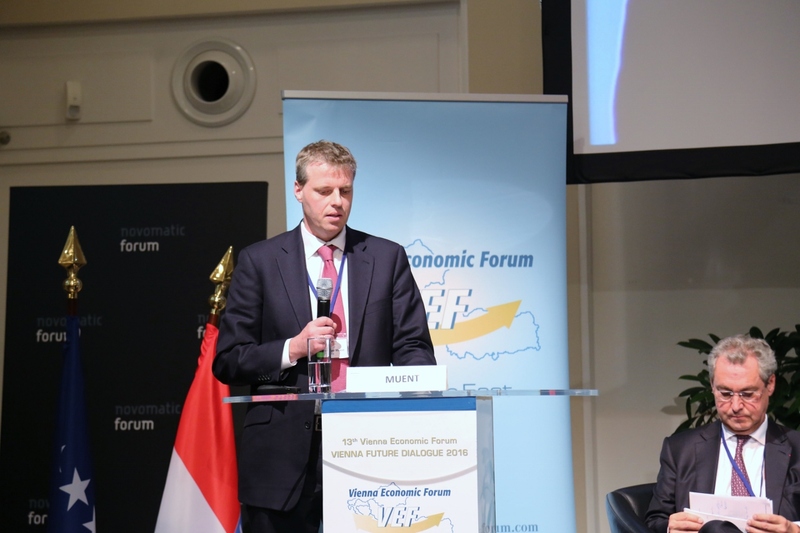 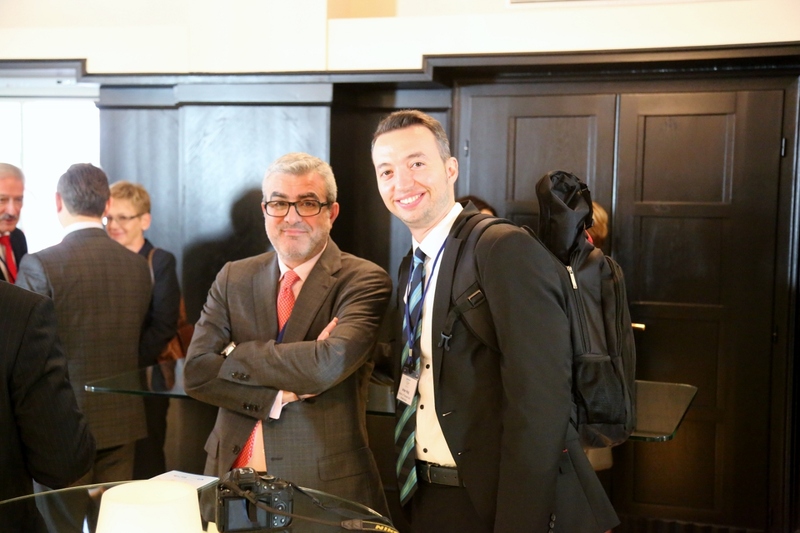 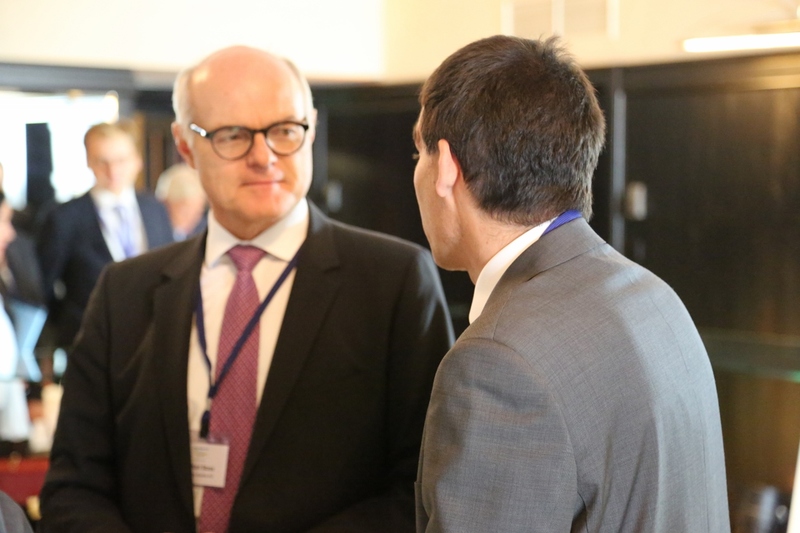 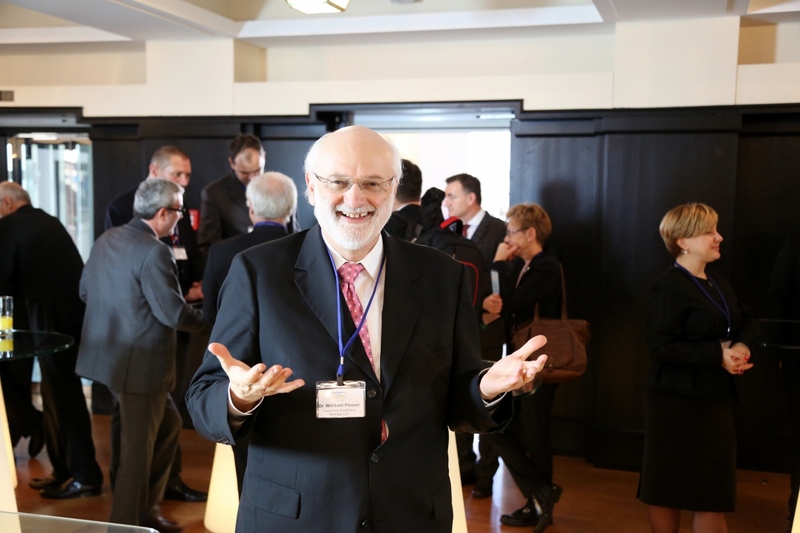 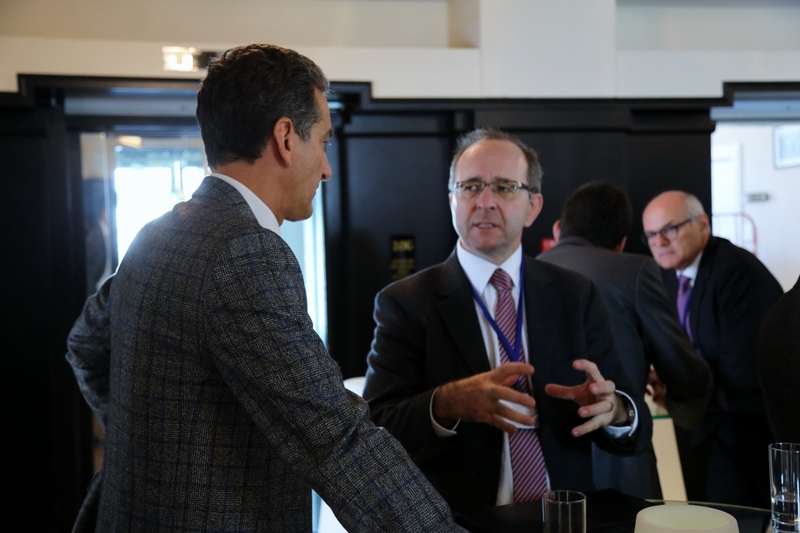 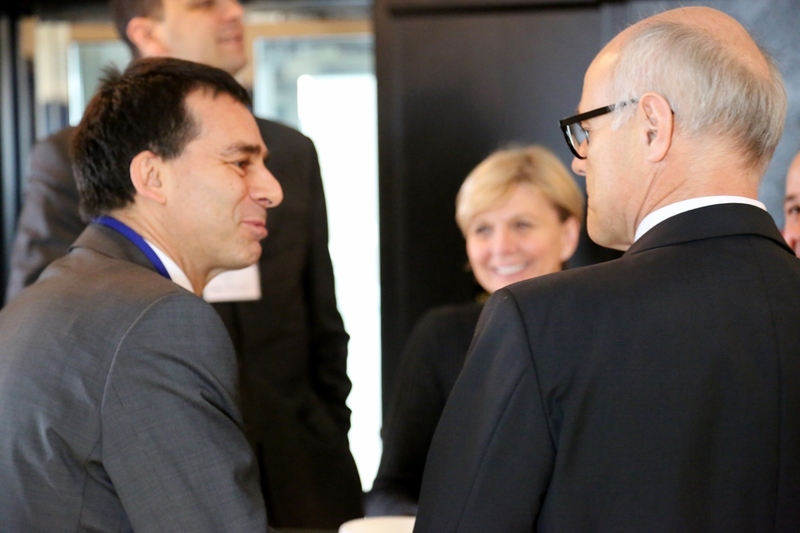 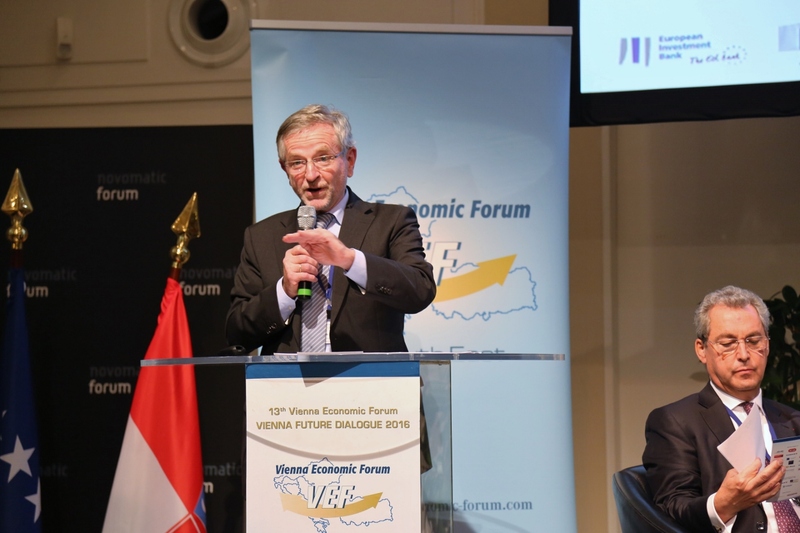 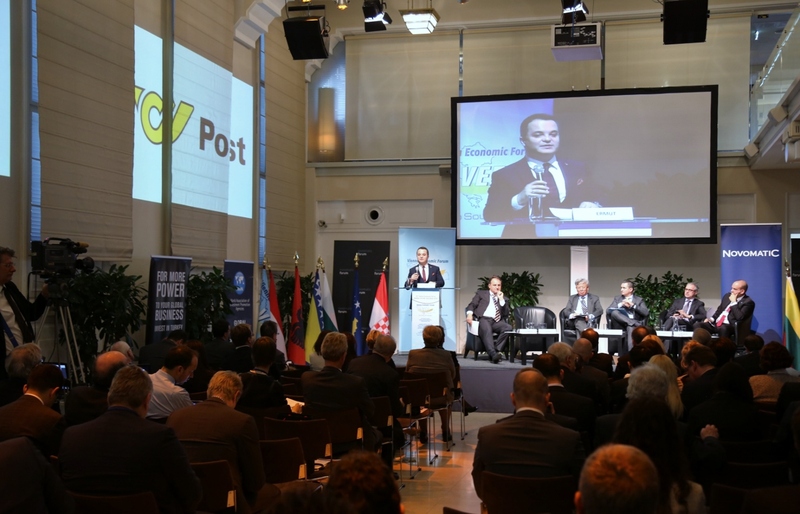 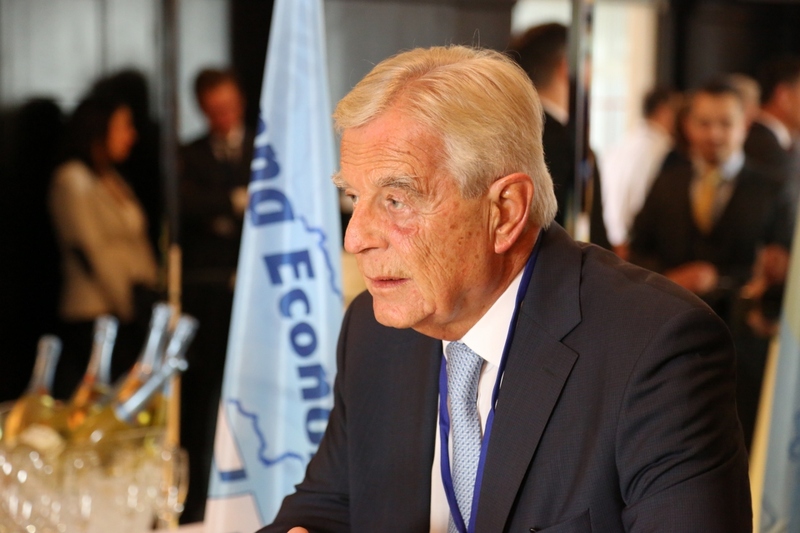 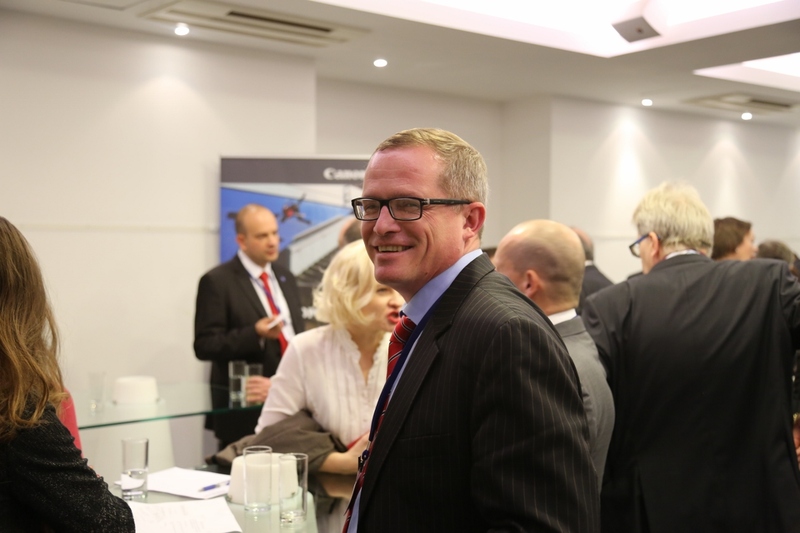 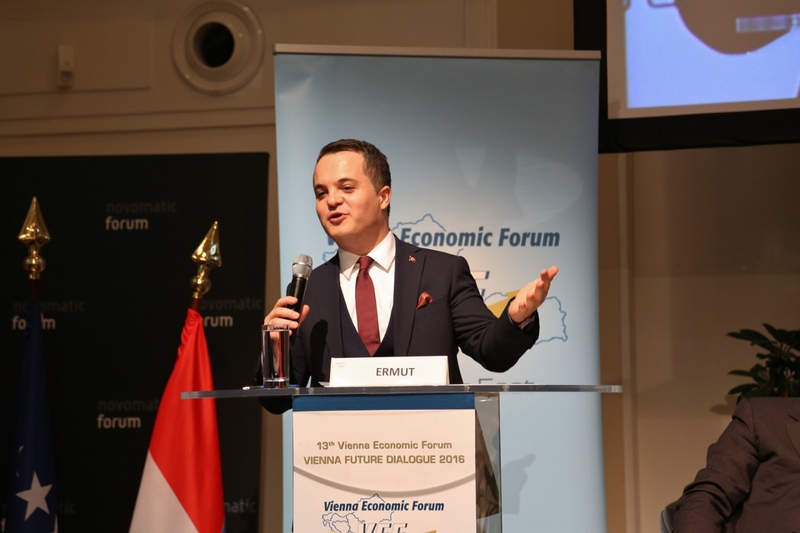 Hermann Anderl, Board Member of the Vienna Economic Forum. 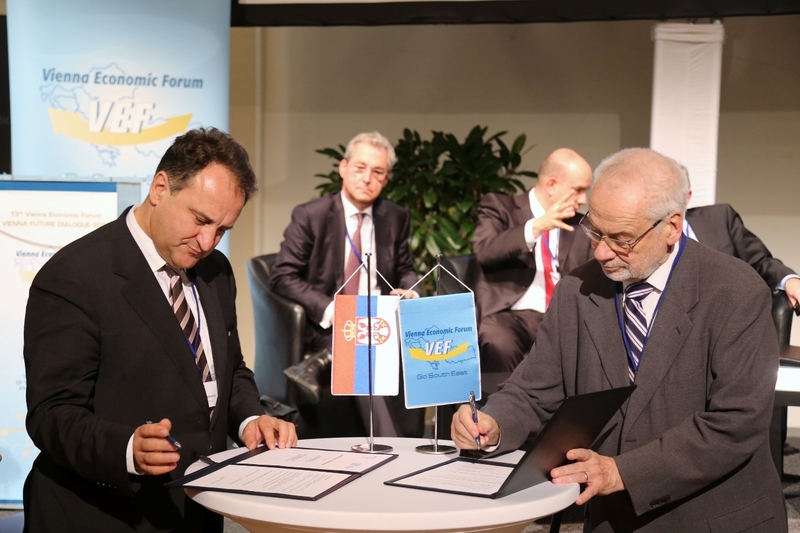 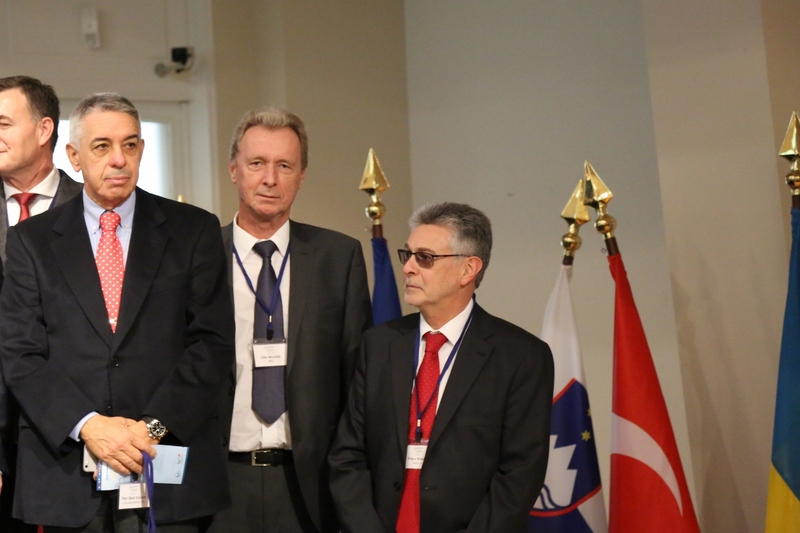 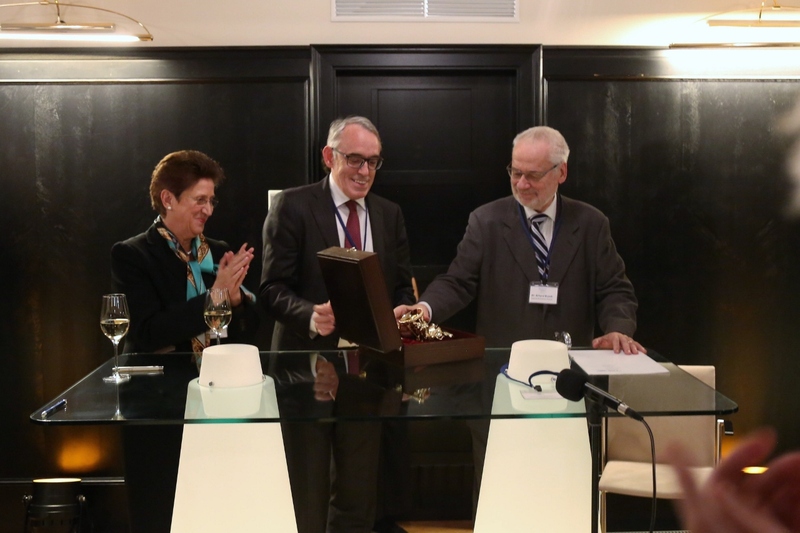 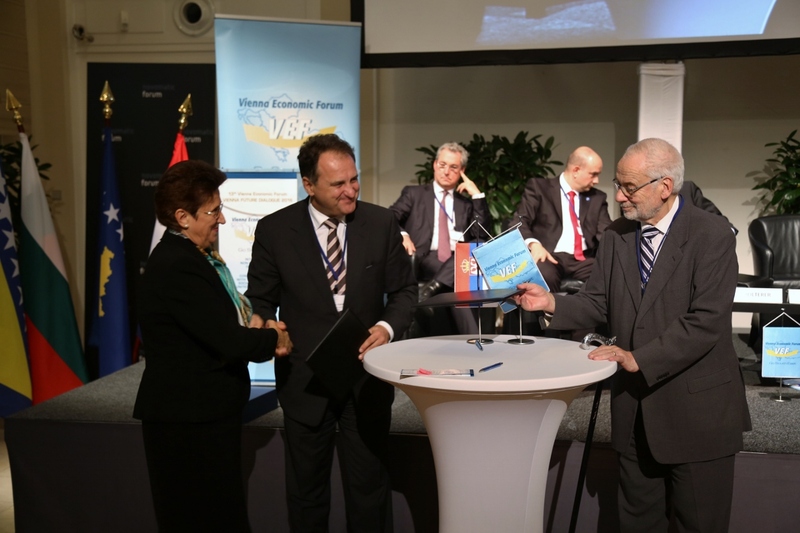 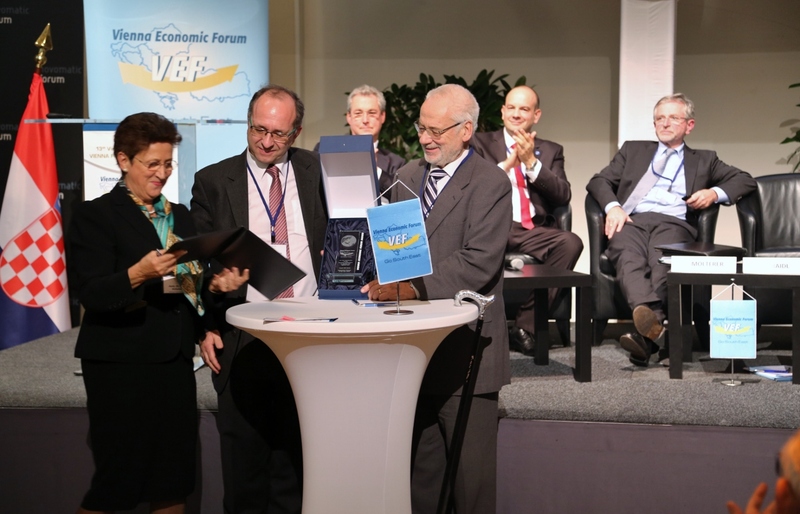 The President of the Serbian Association of Economists Mr. Aleksandar Vlahovic, the VEF president Dr. Erhard Busek and the Secretary General Ambassador Dr. Elena Kirtcheva signed a Memorandum of Understanding (MoU) for the collaboration and organisation of Vienna Economic Forum – Belgrad Meeting 2017. 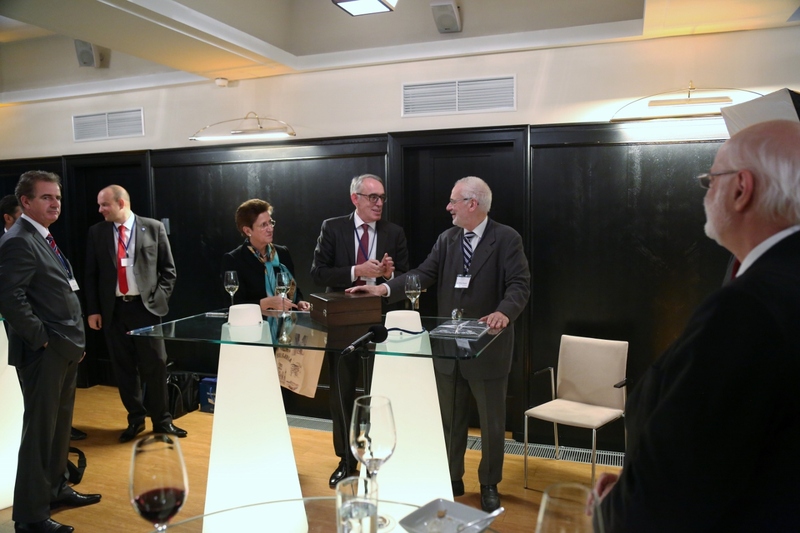 At the following VIP-Reception at Salon Aichinger & Salon Lugmayr on the second floor of Novomatic Forum all invited high-ranking guests payed their thanks in celebatory atmosphere to longtime president of Vienna Economic Forum Dr. Erhard Busek, who is leaving his position as president but will be remaining honorary president of the Vienna Economic Forum and thus connected. 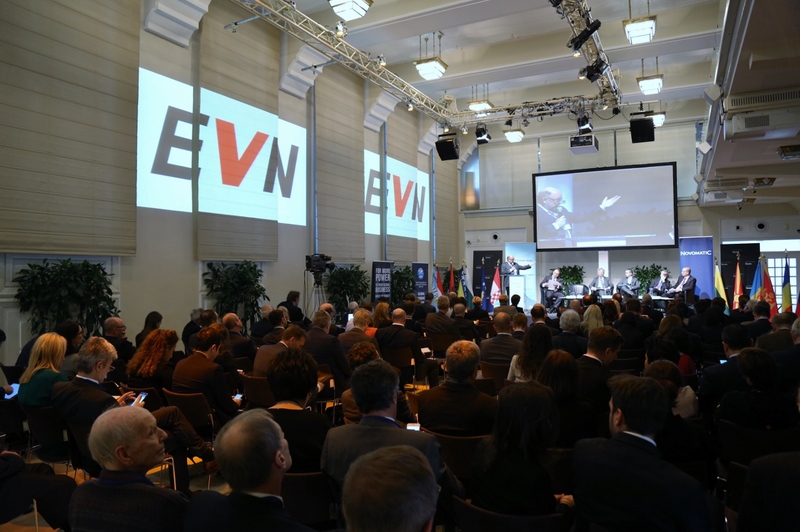 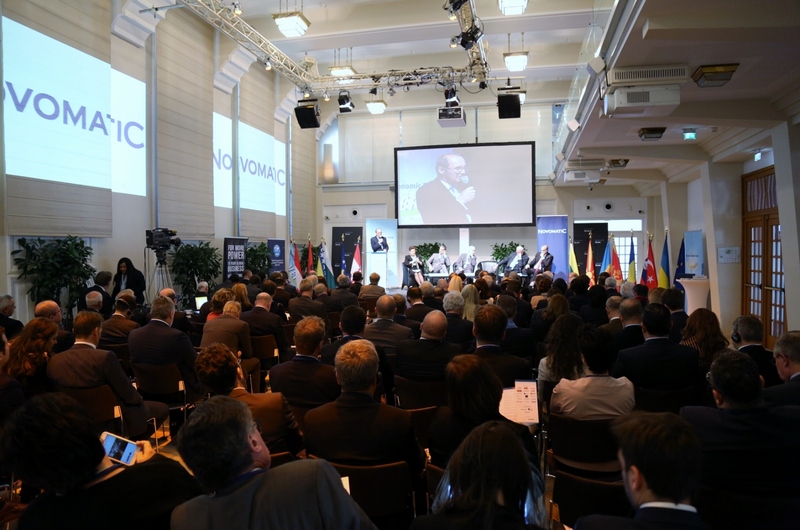 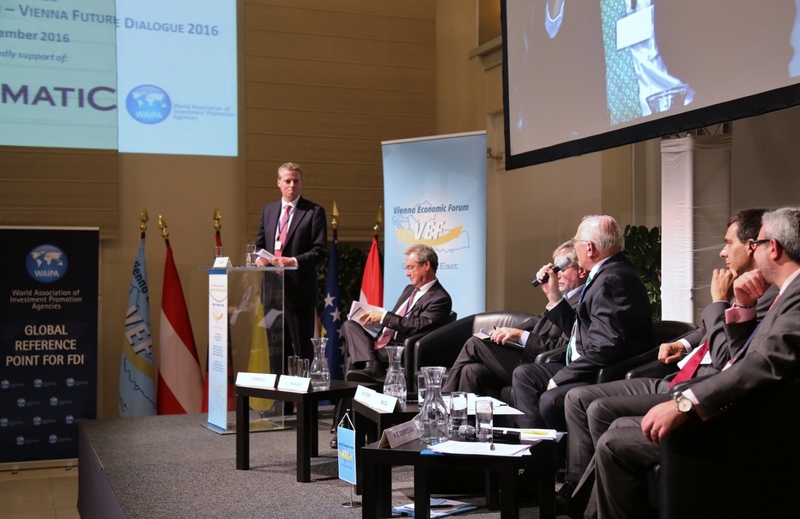 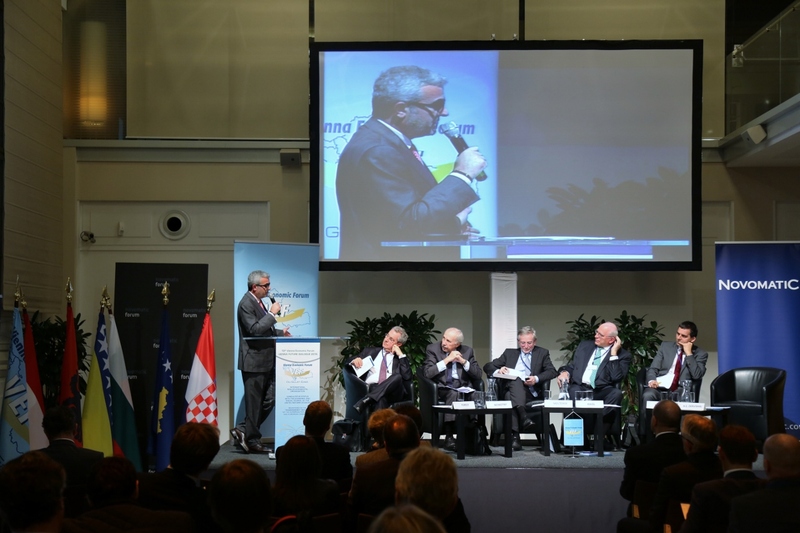 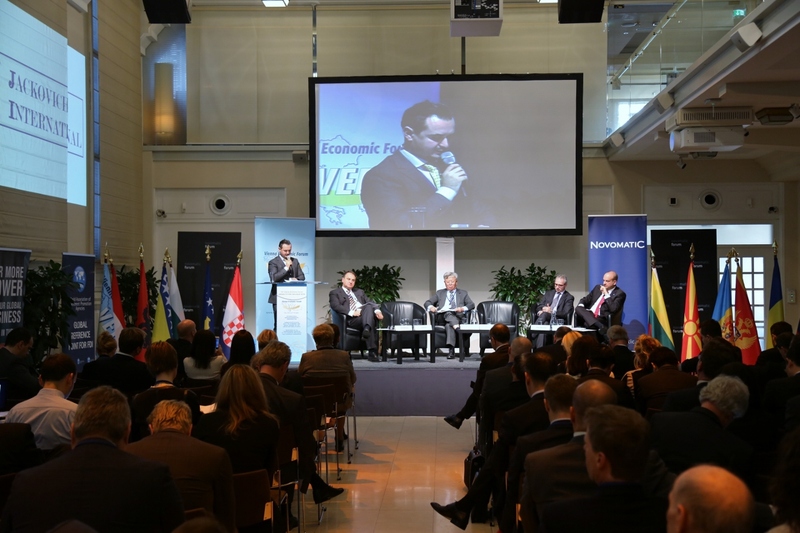 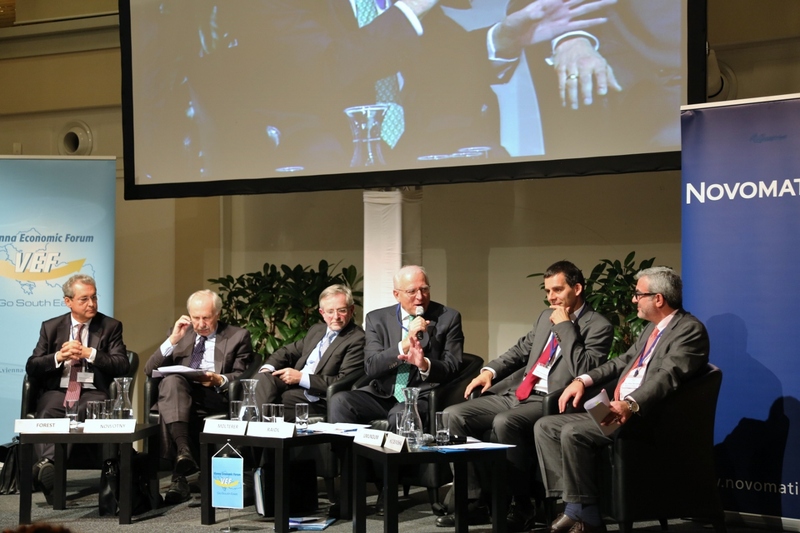 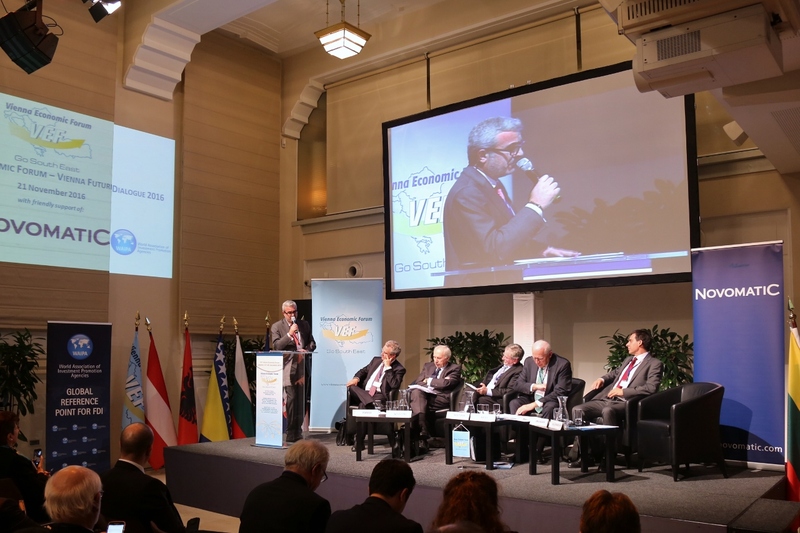 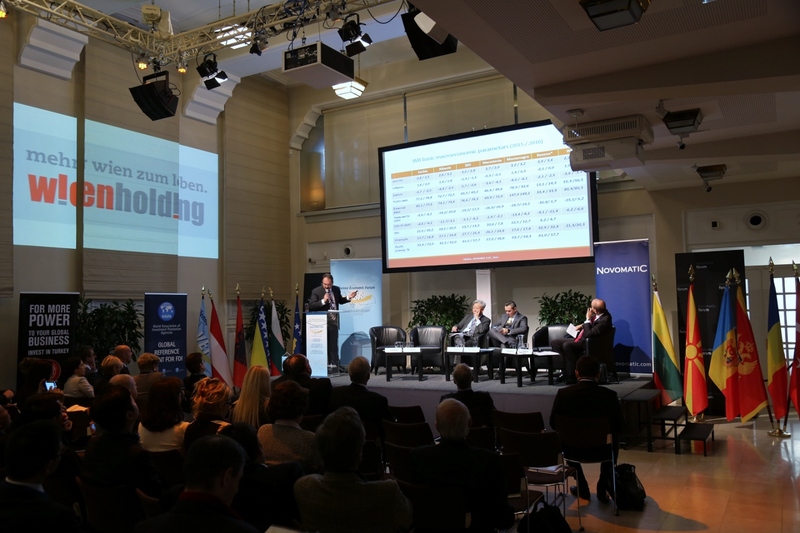 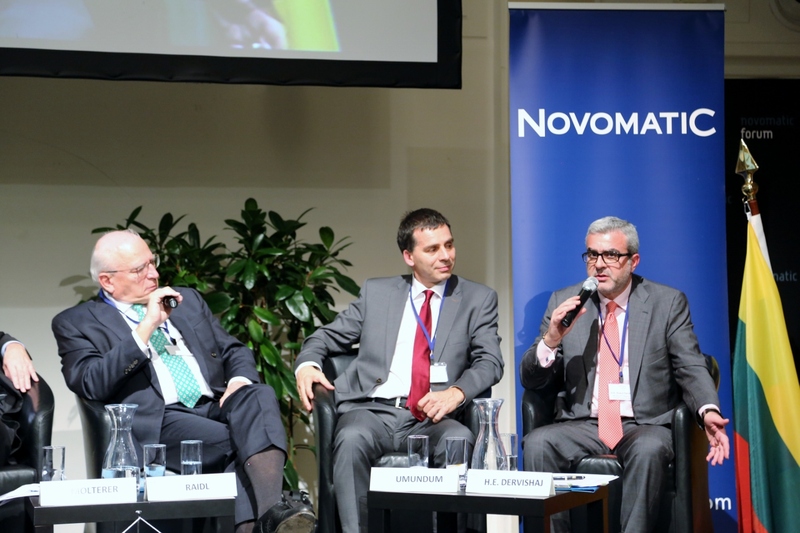 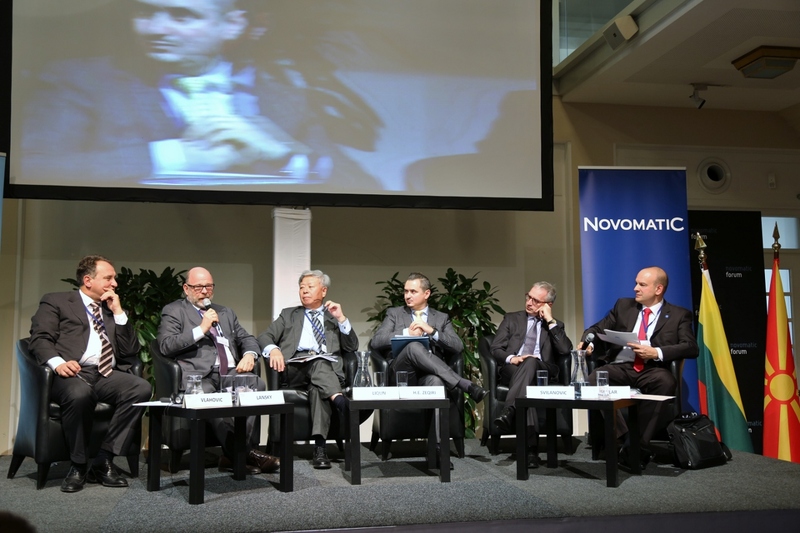 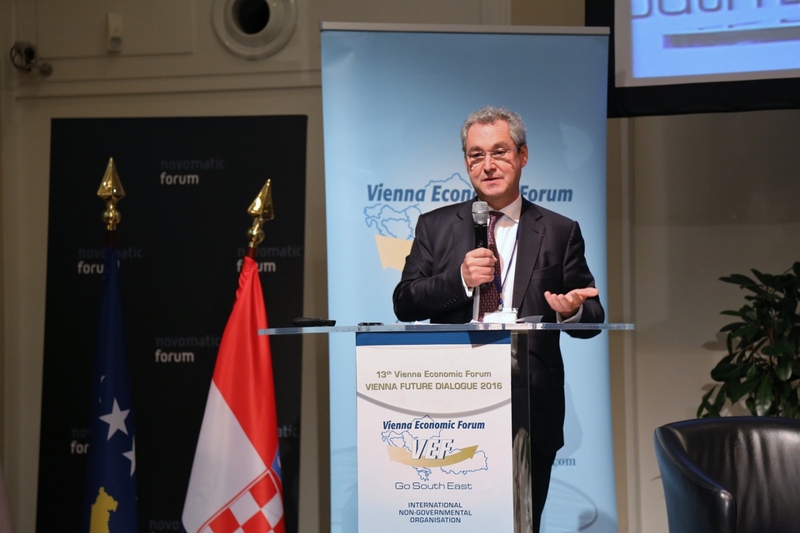 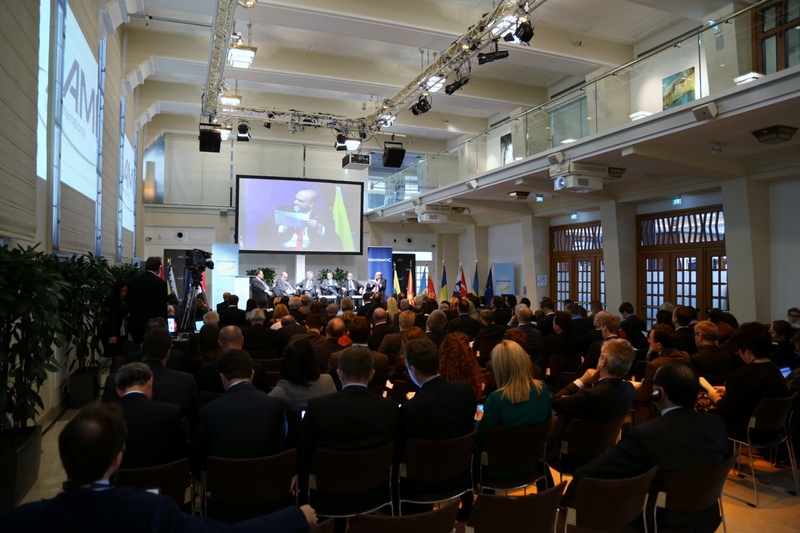 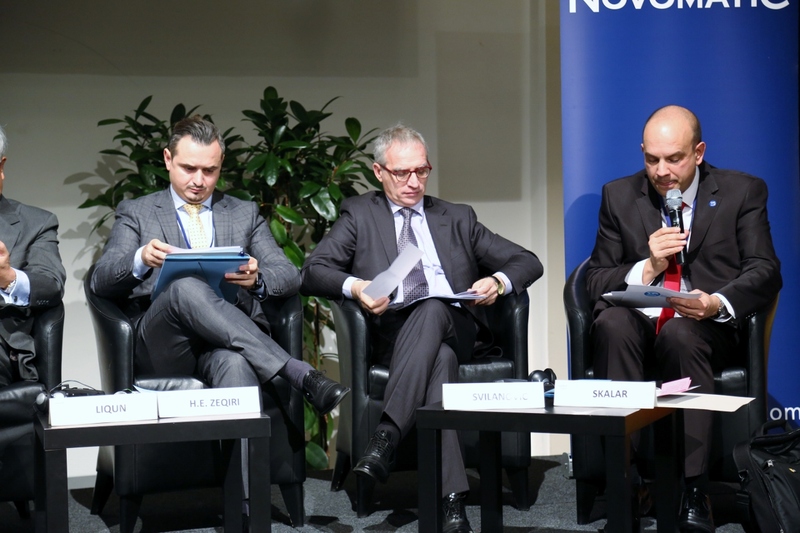 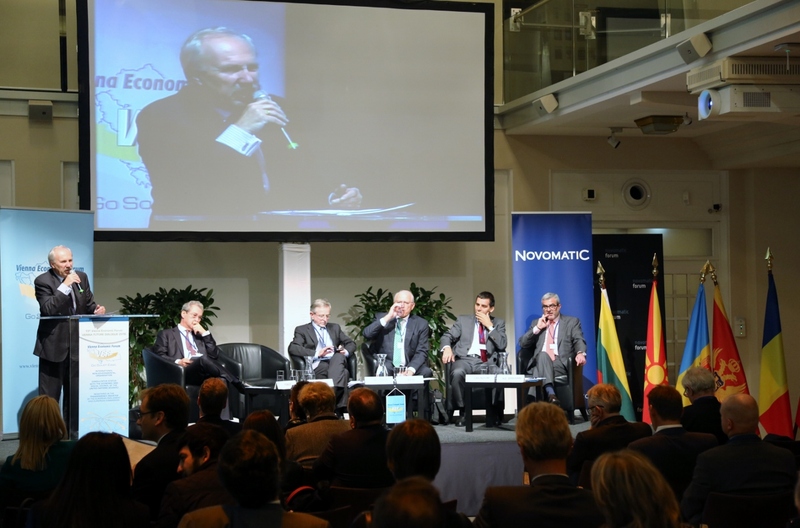 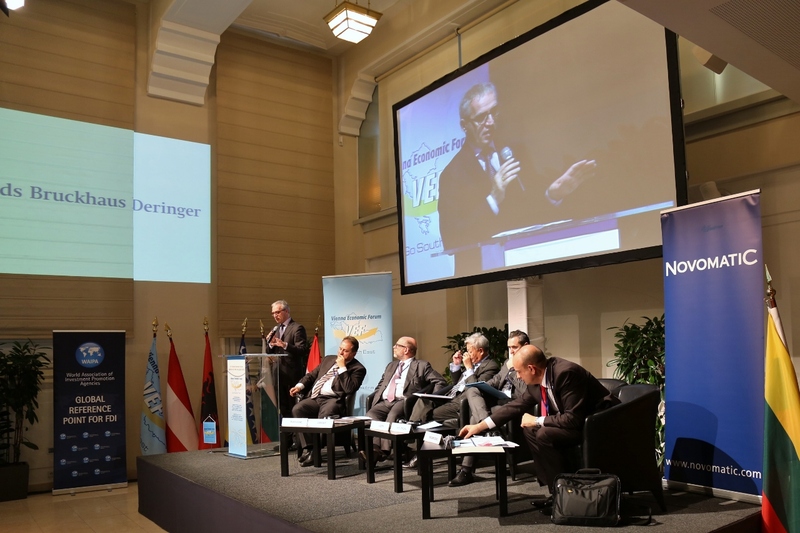 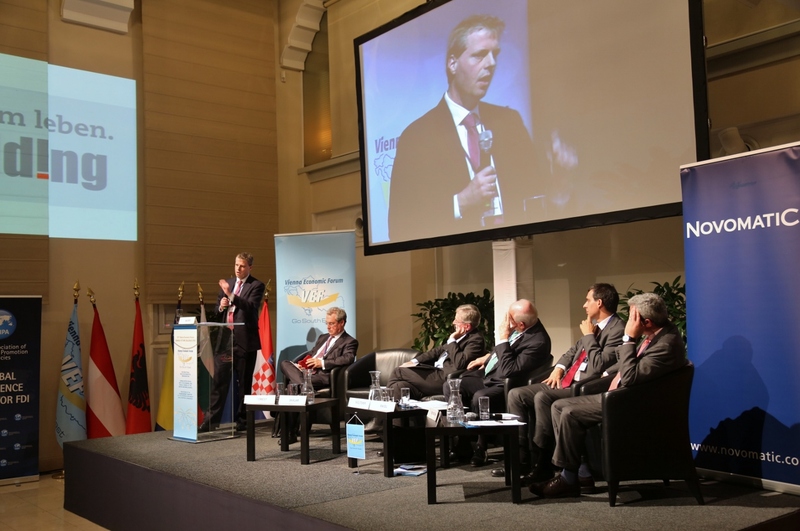 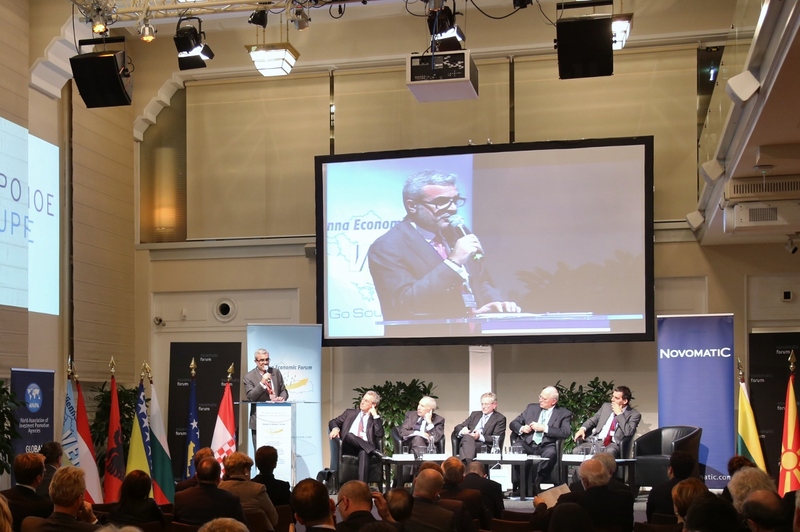 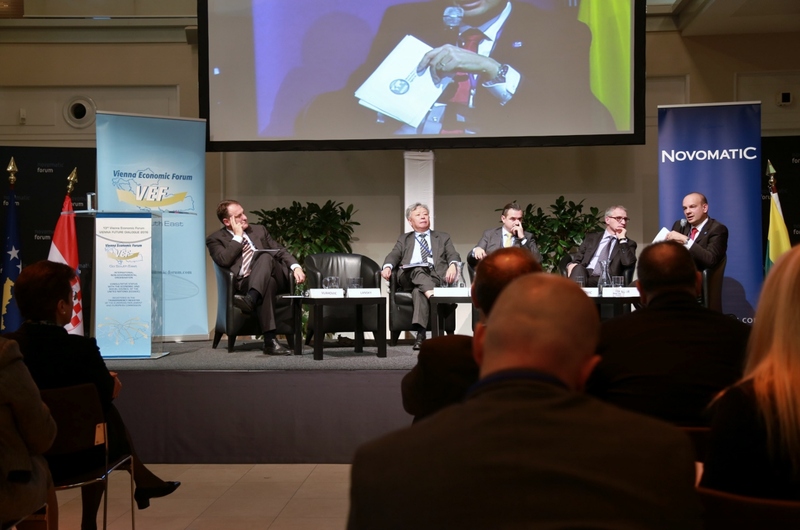 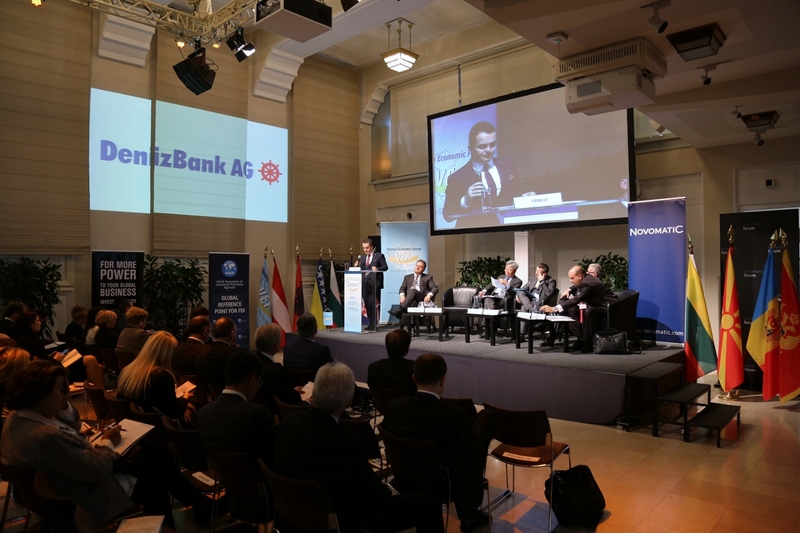 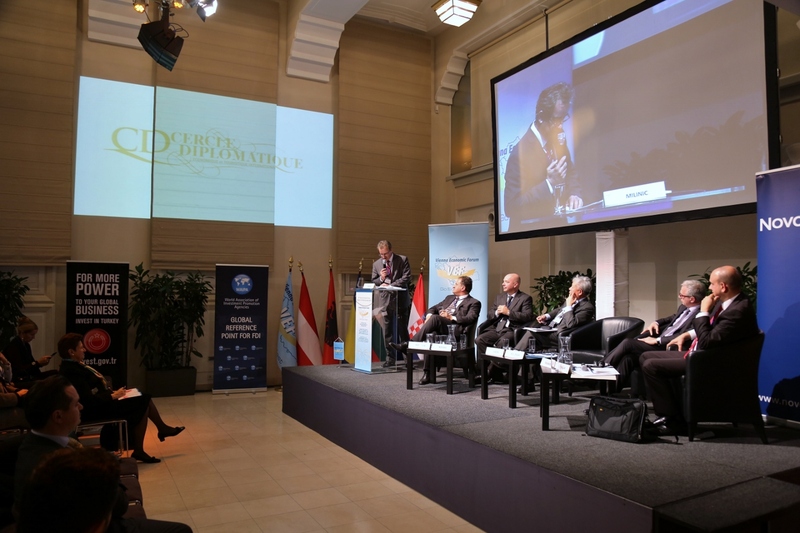 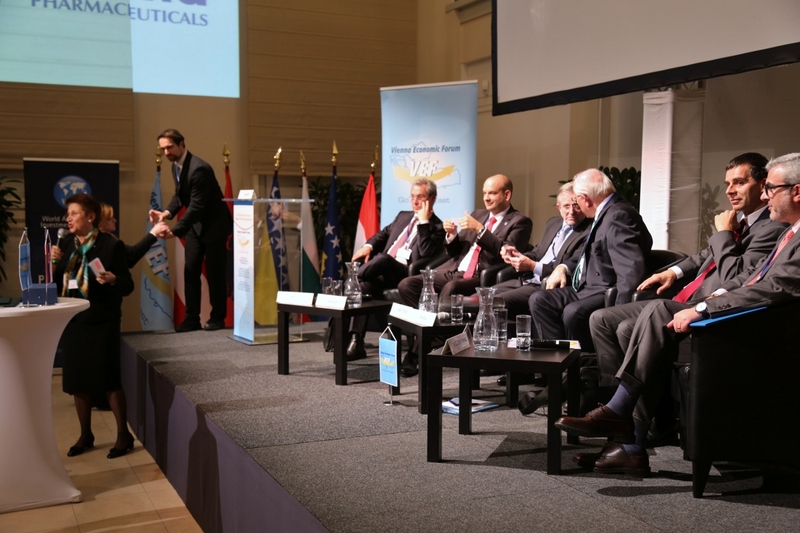 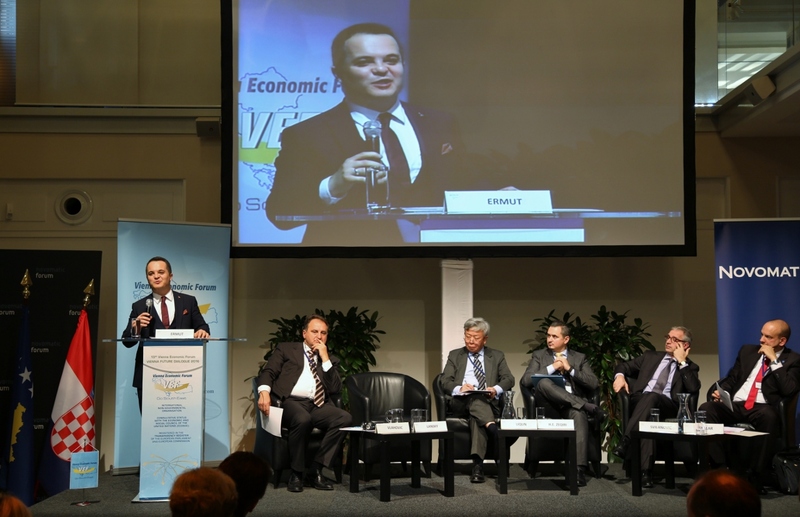 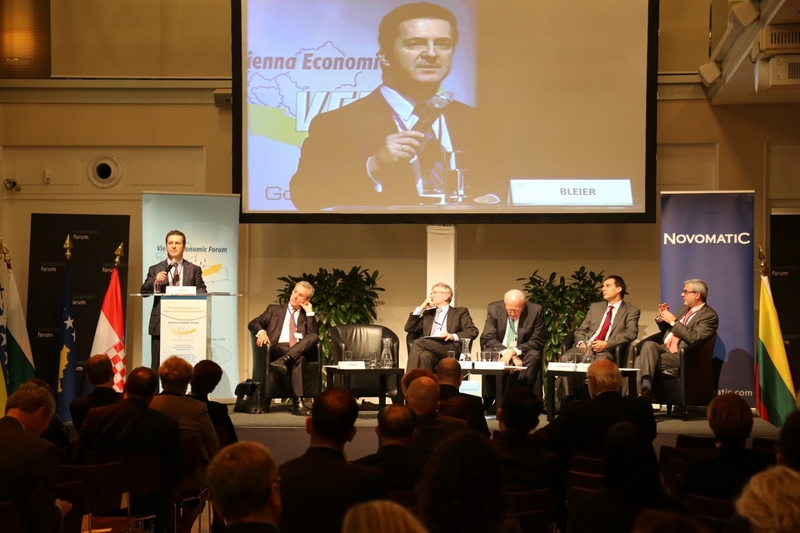 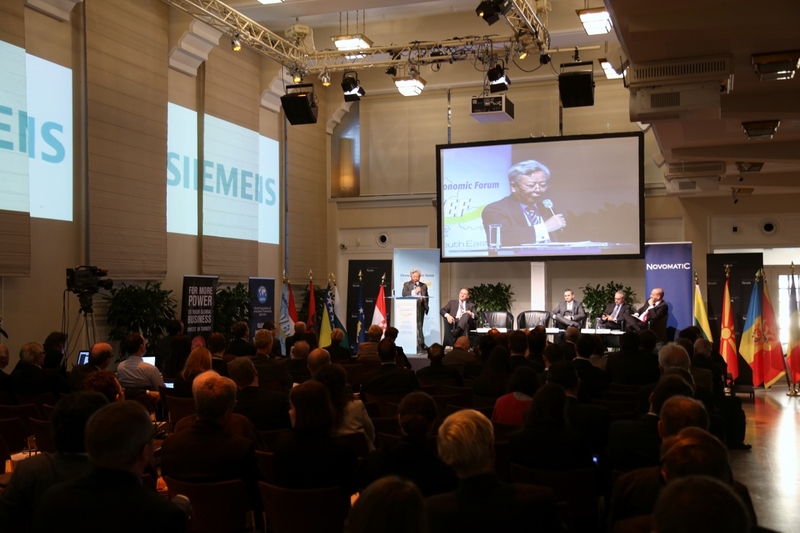 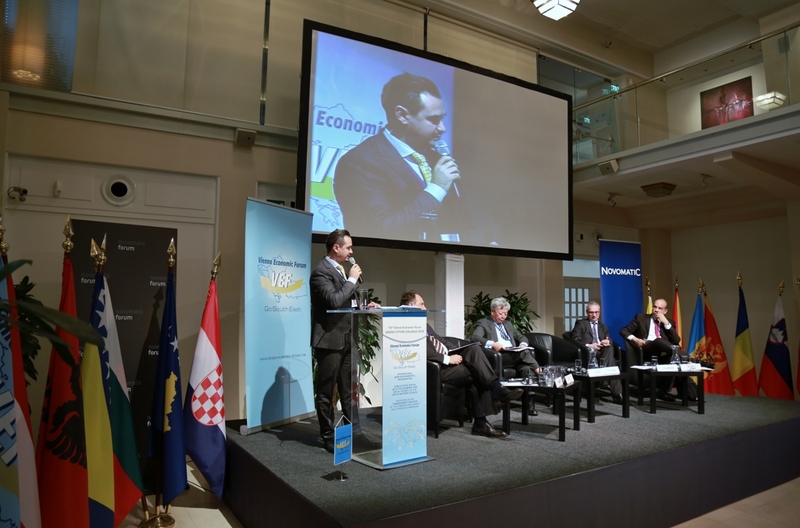 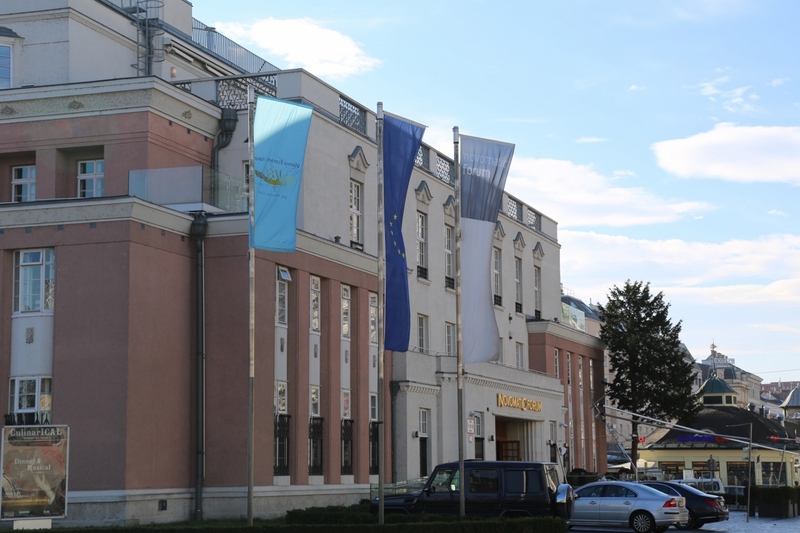 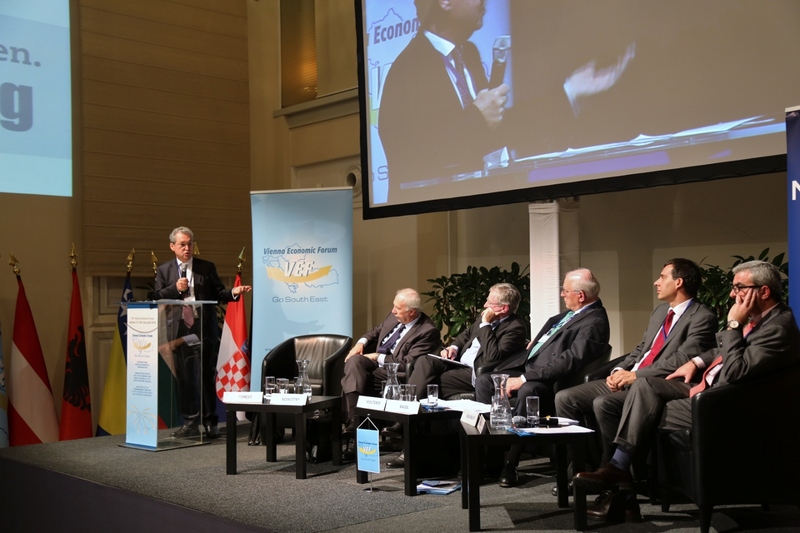 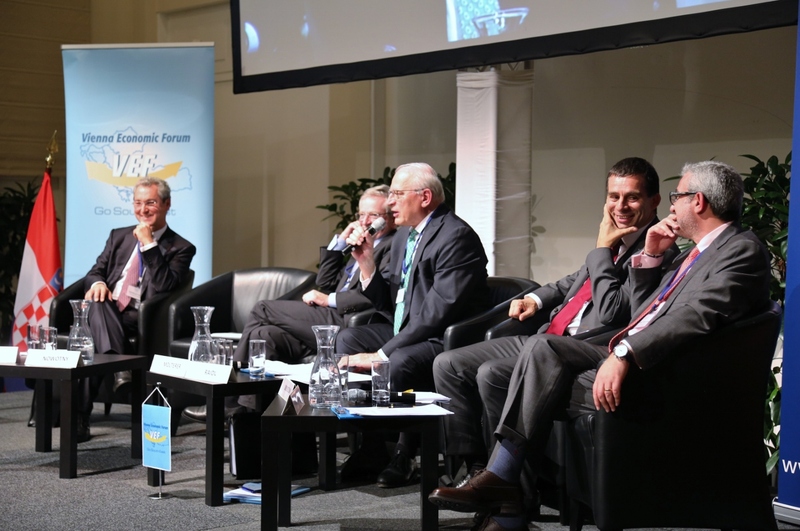 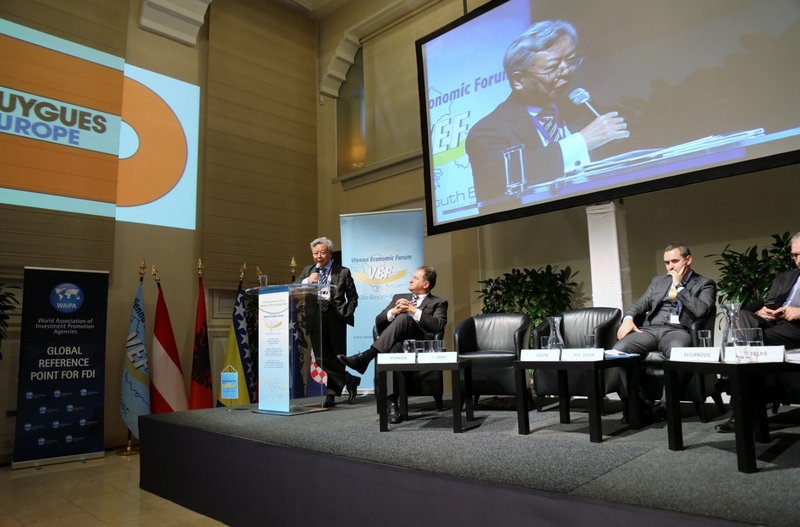 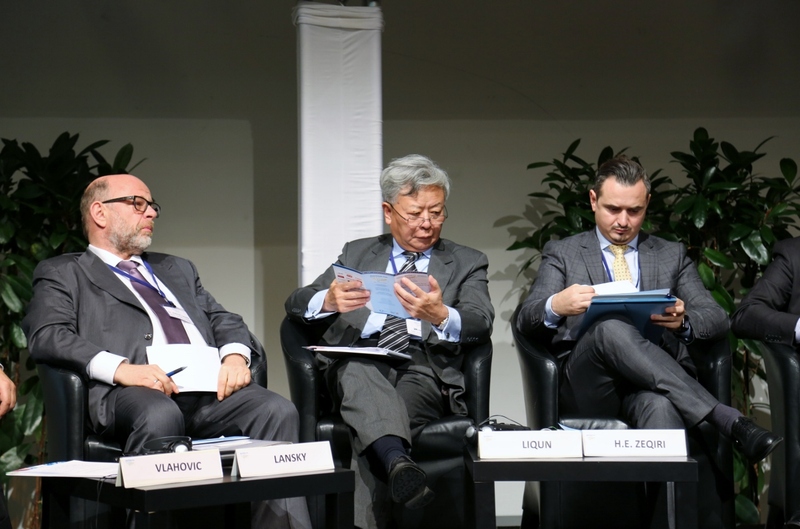 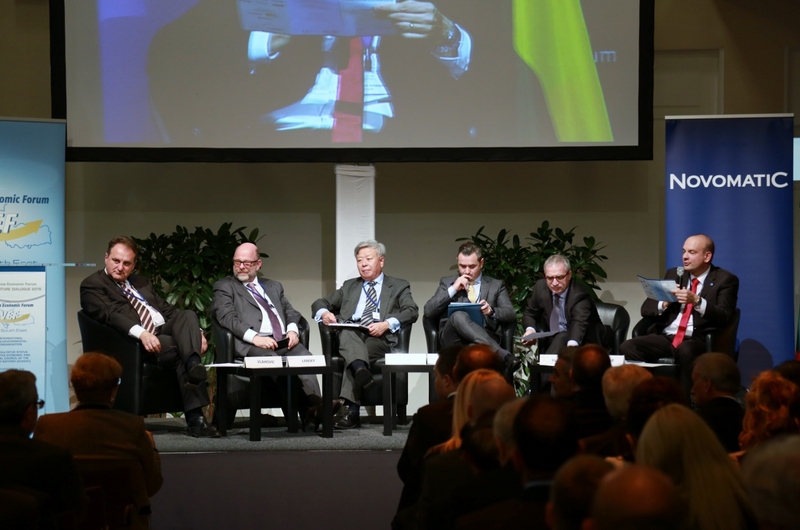 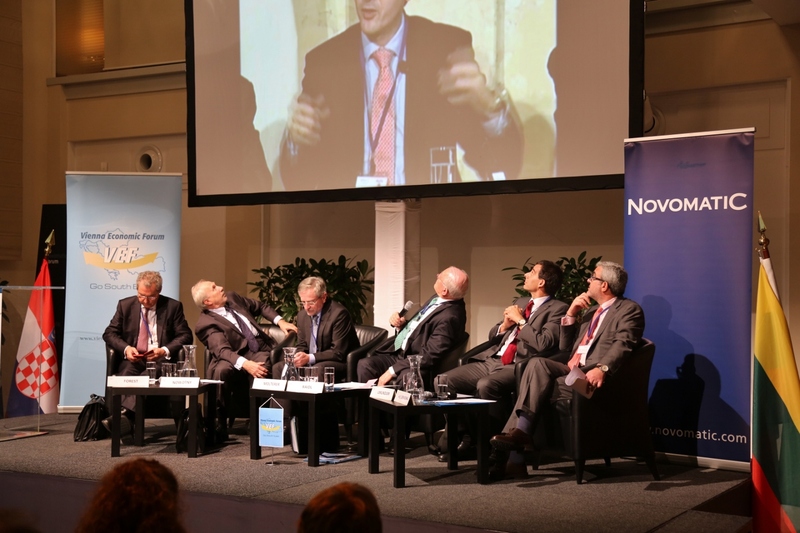 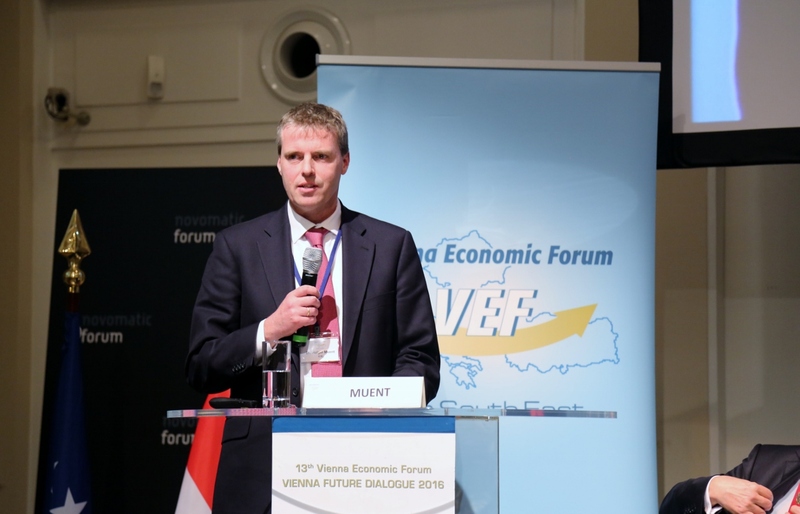 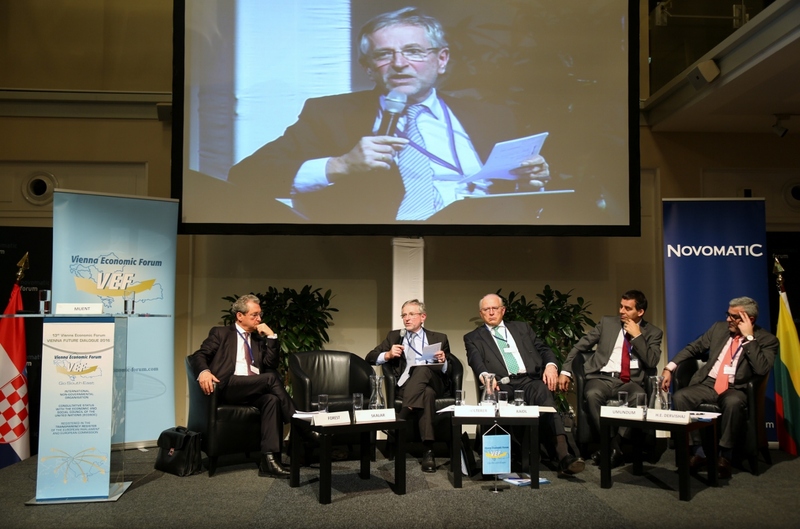 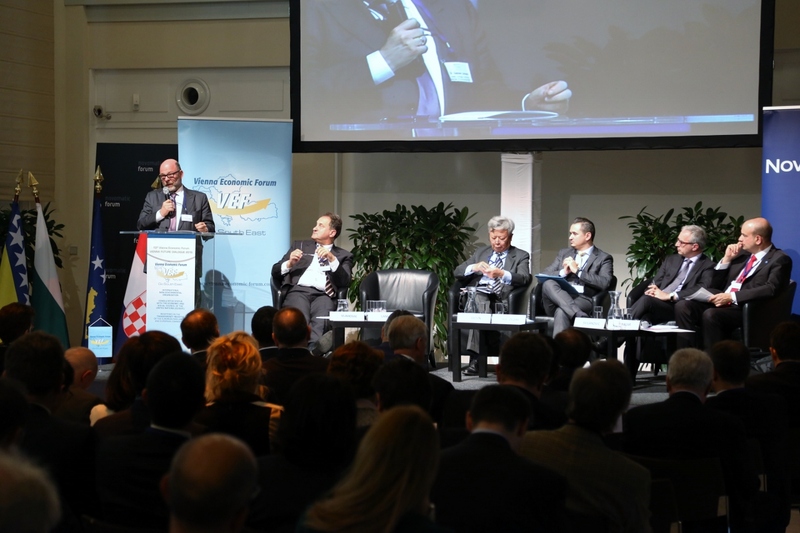 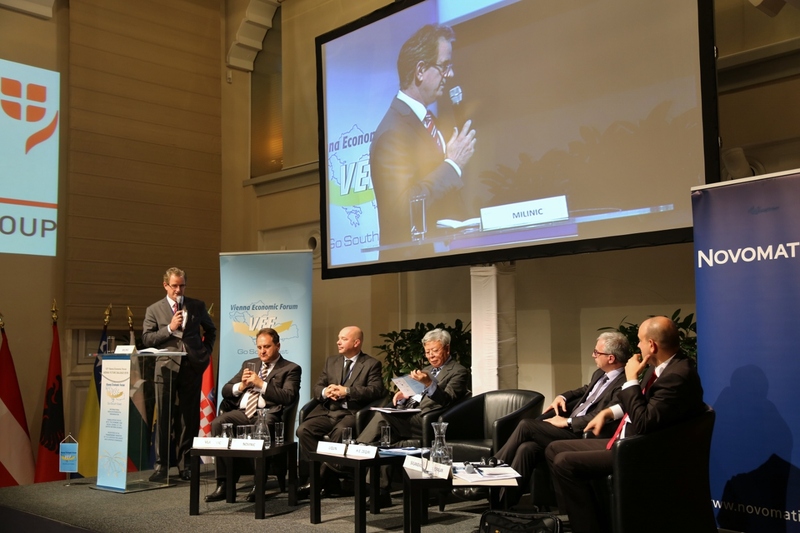 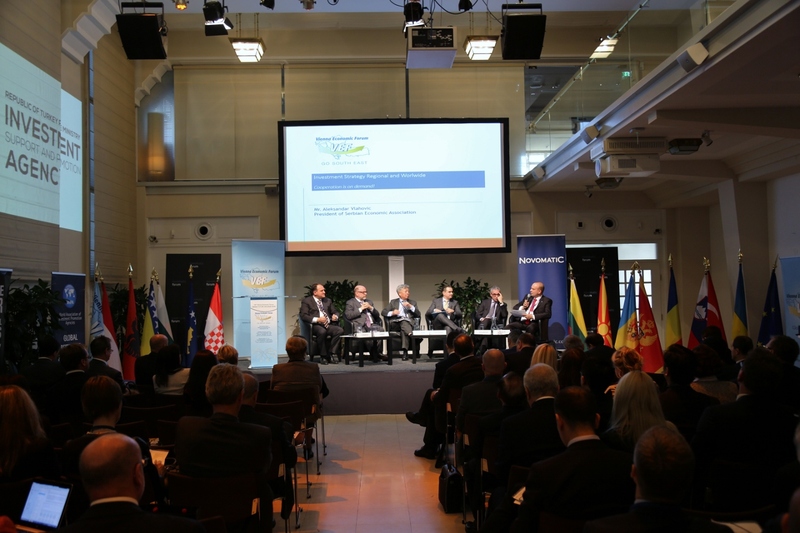 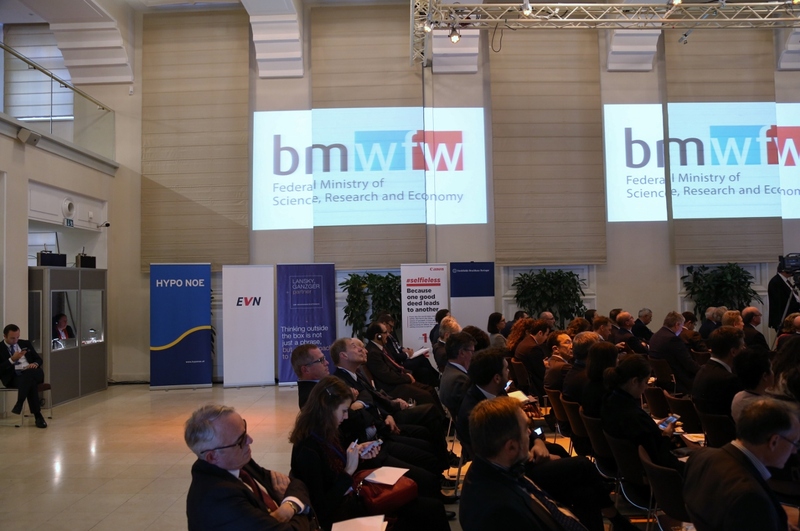 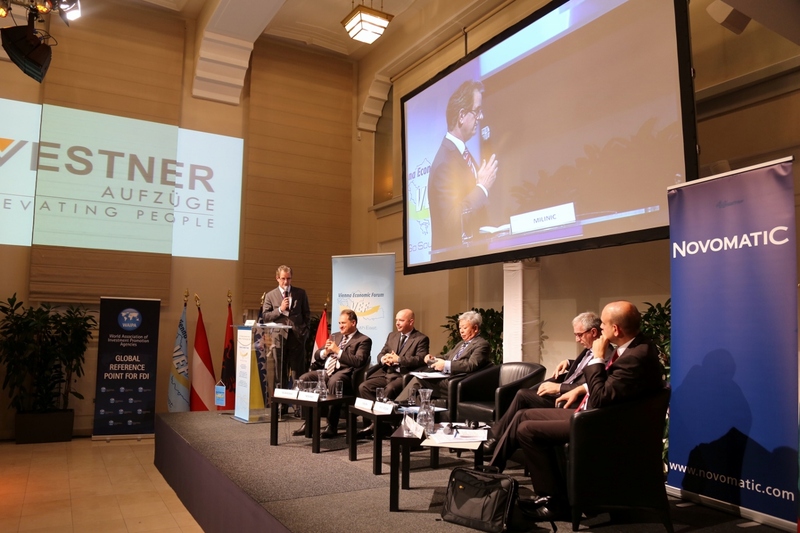 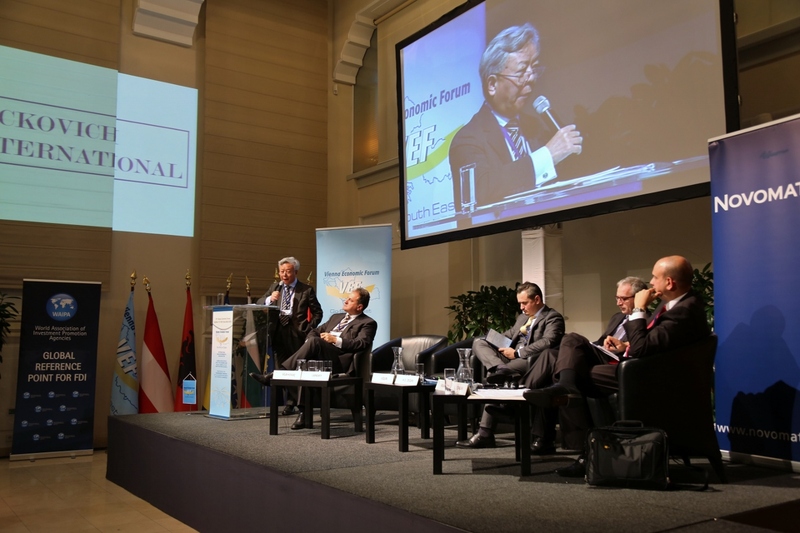 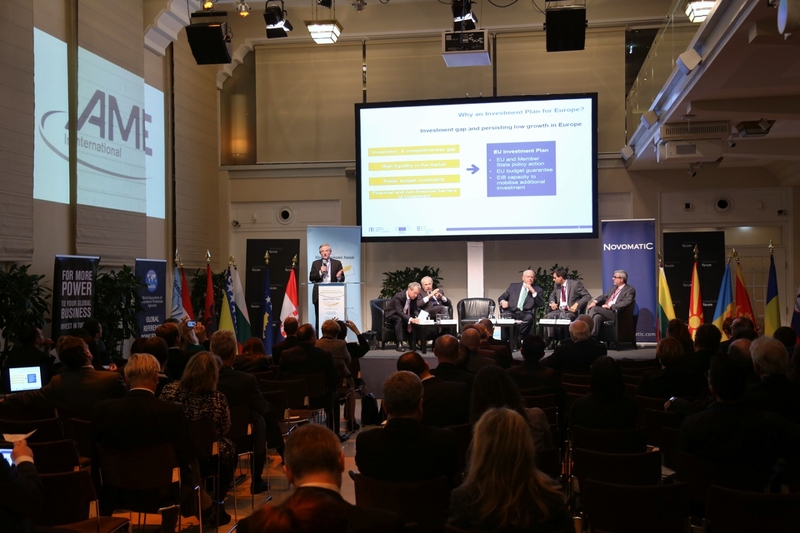 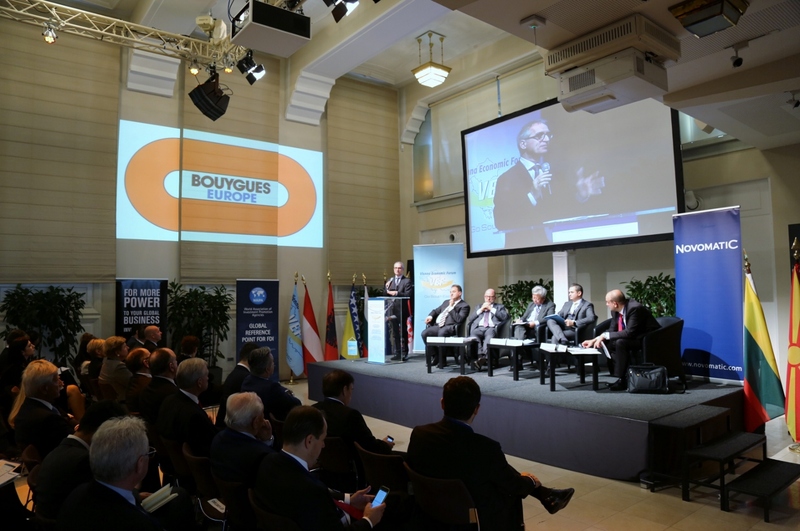 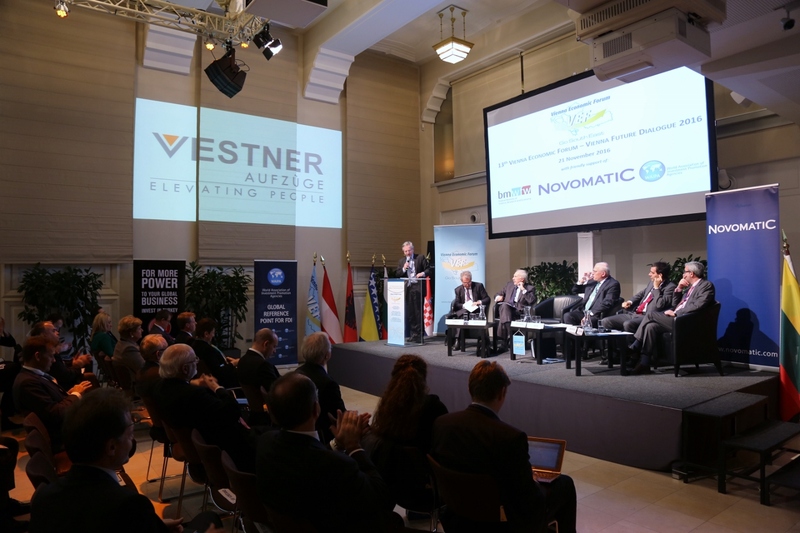 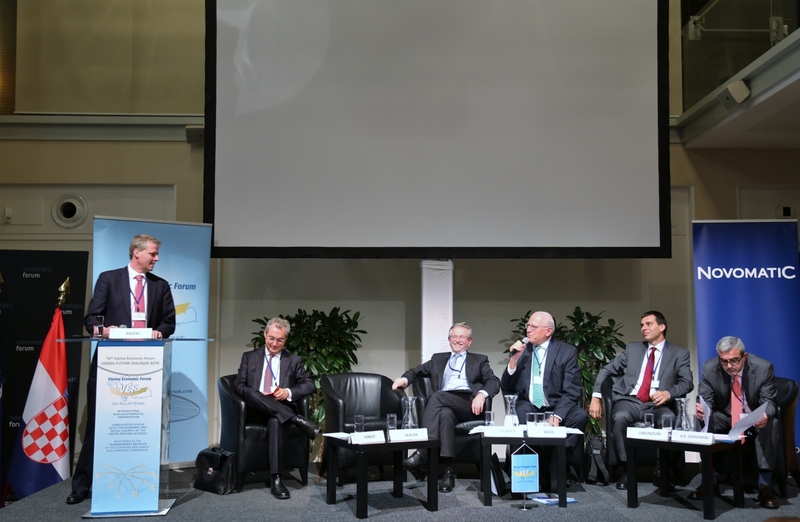 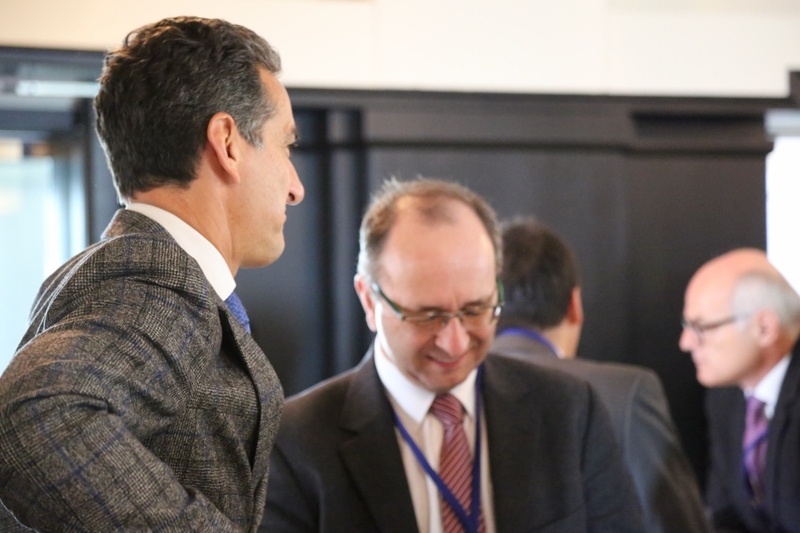 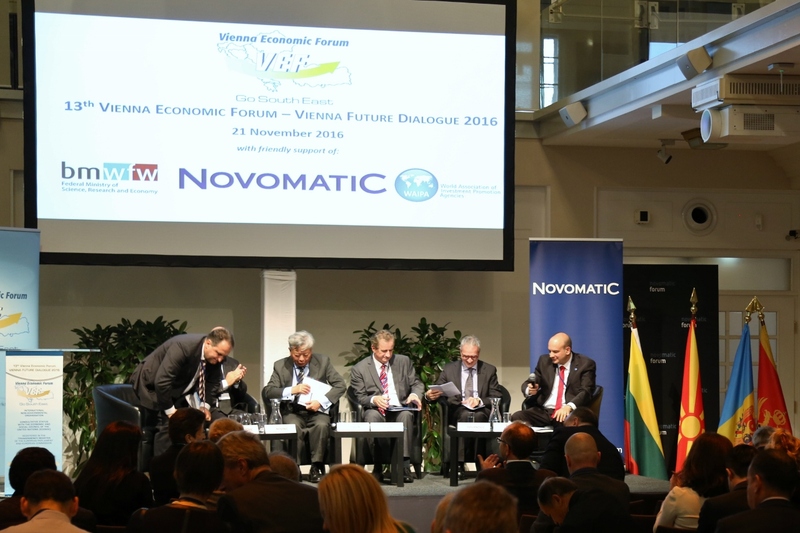 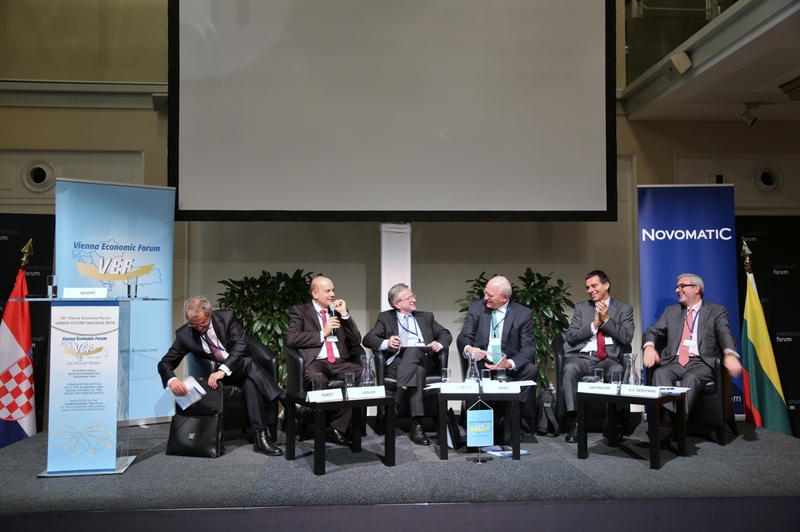 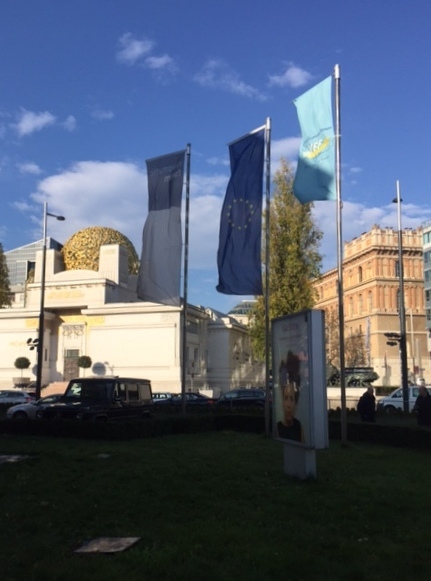 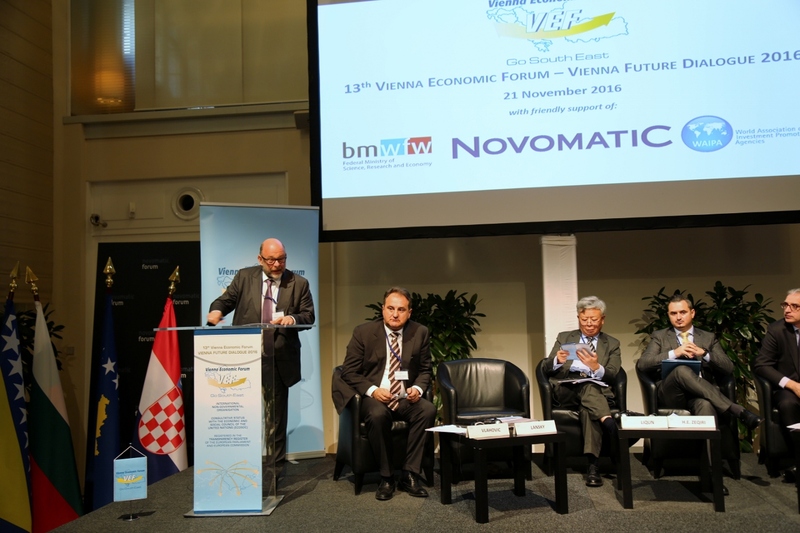 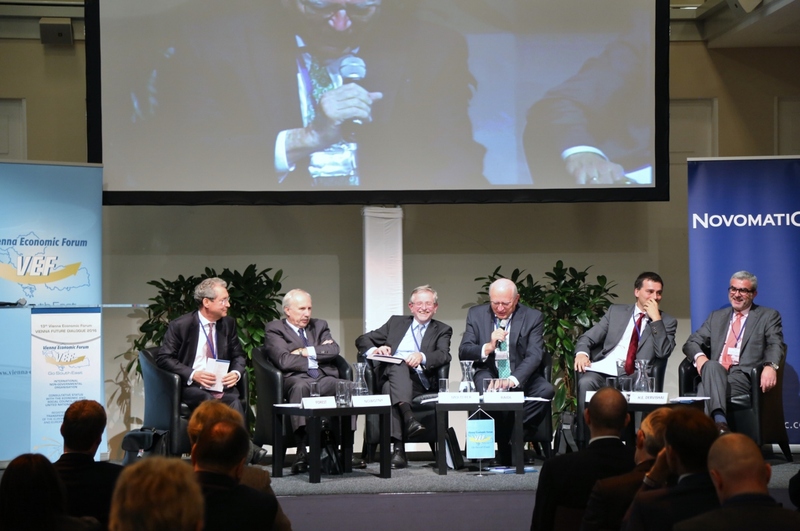 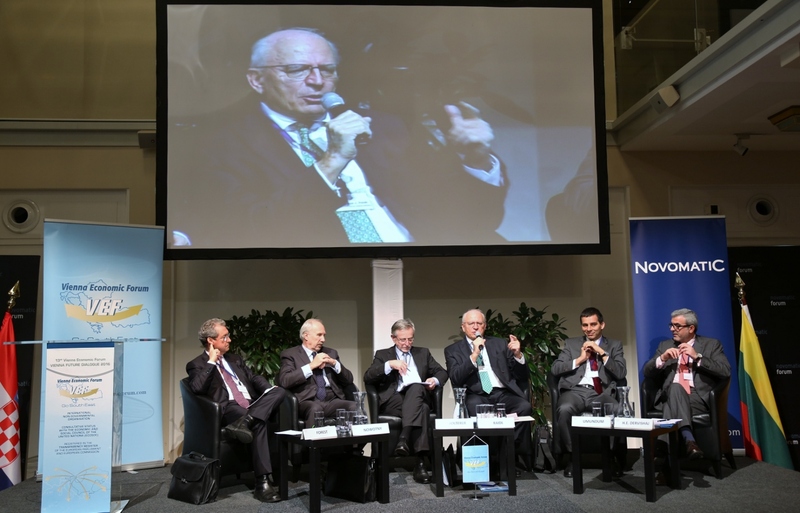 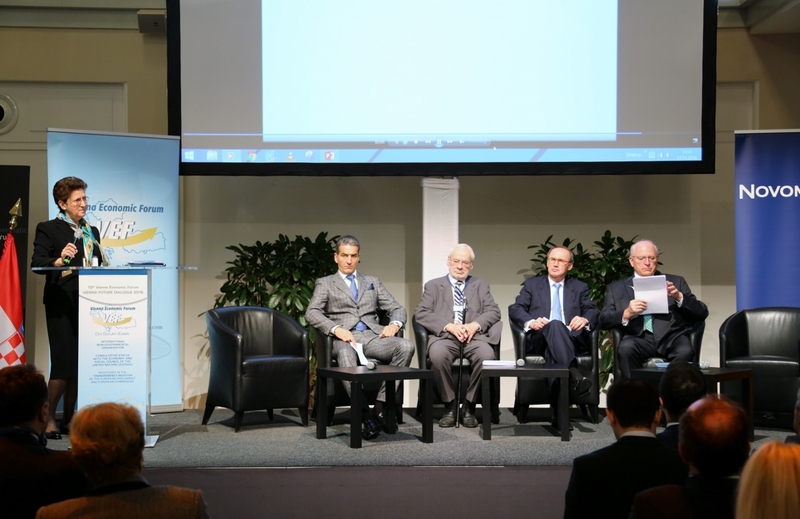 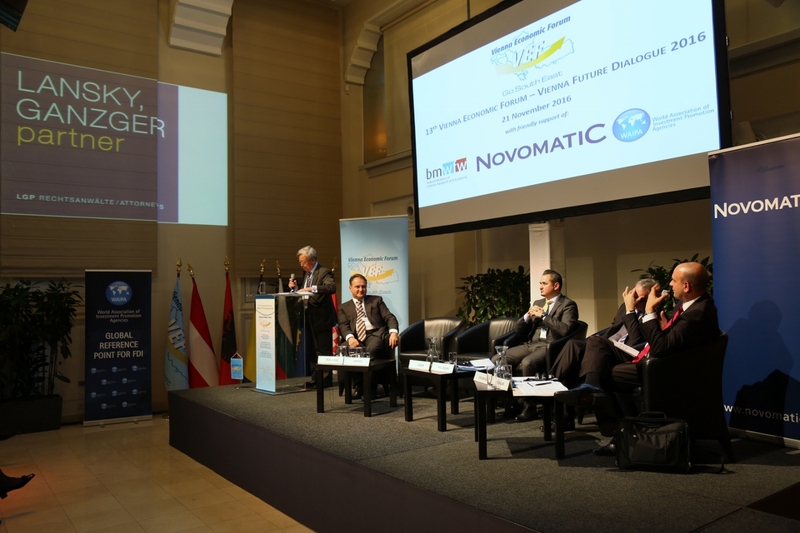 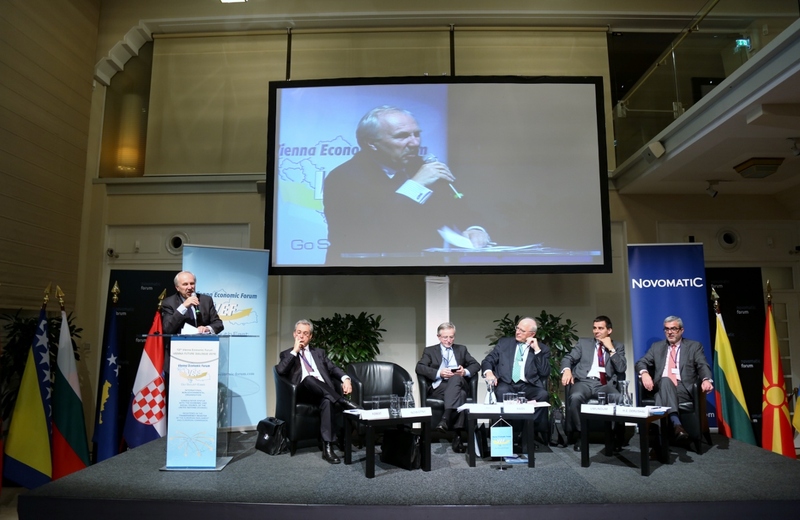 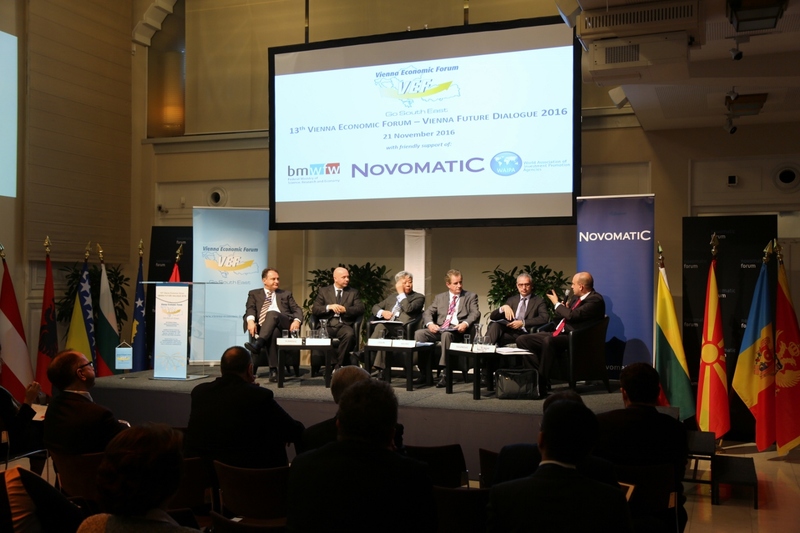 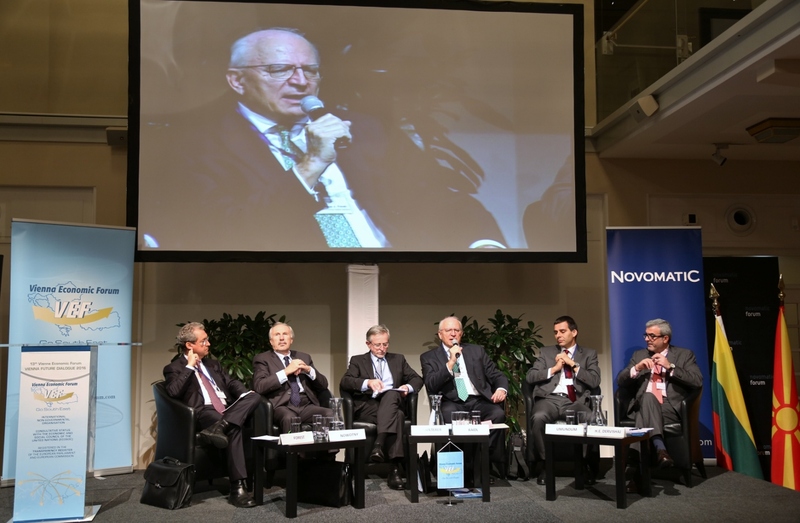 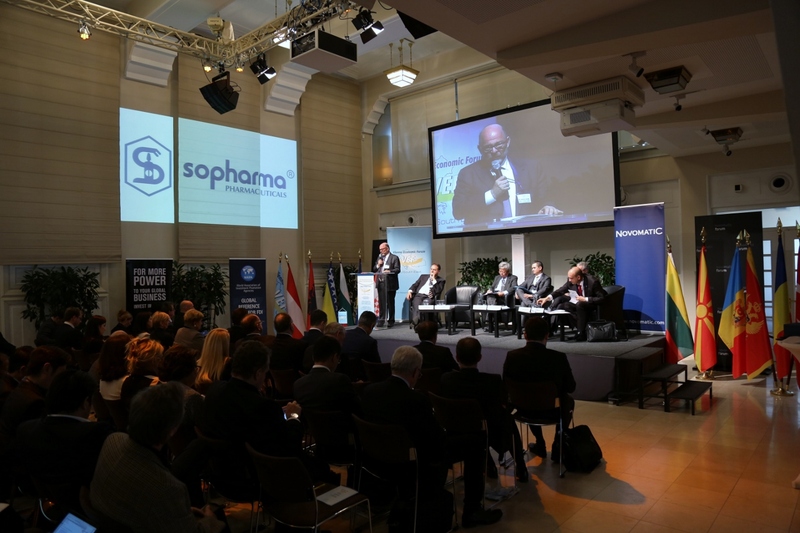 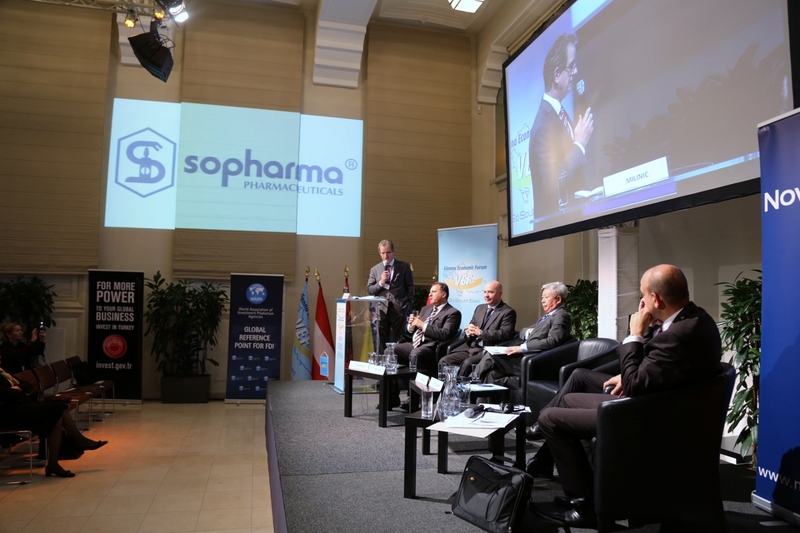 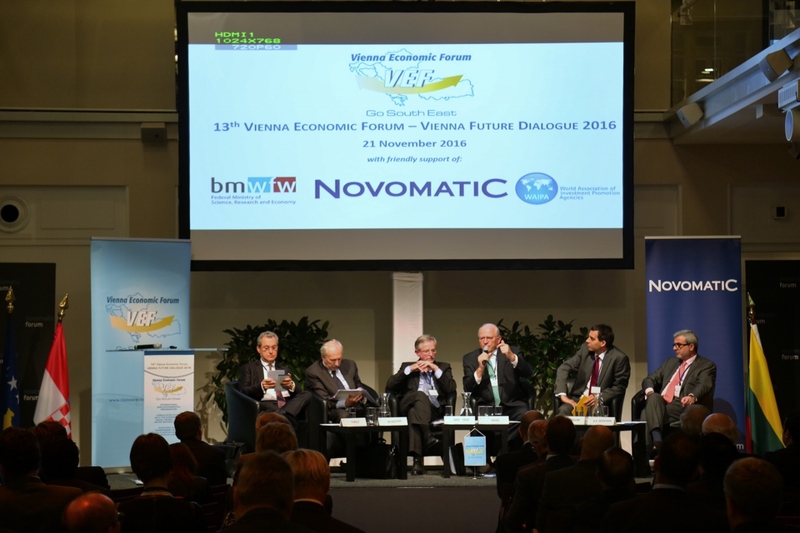 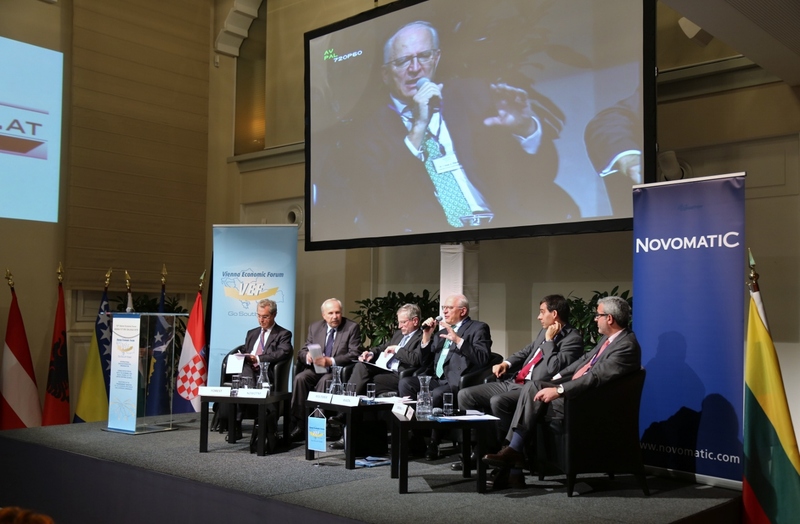 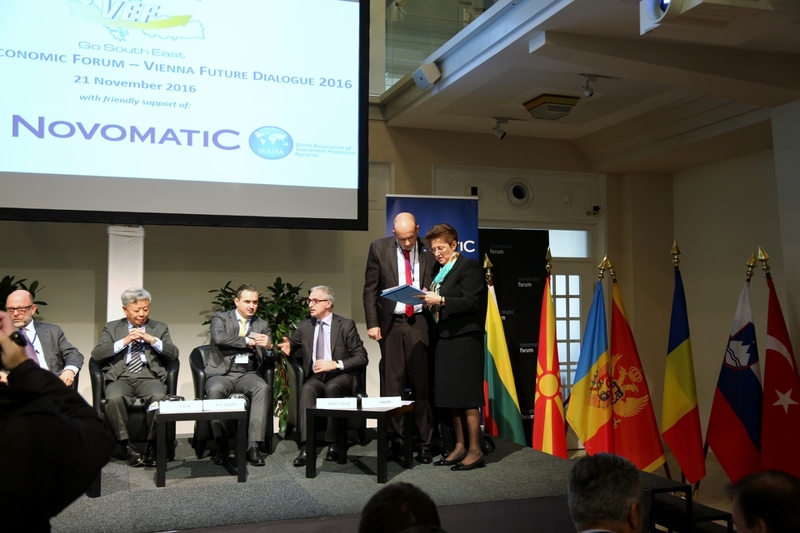 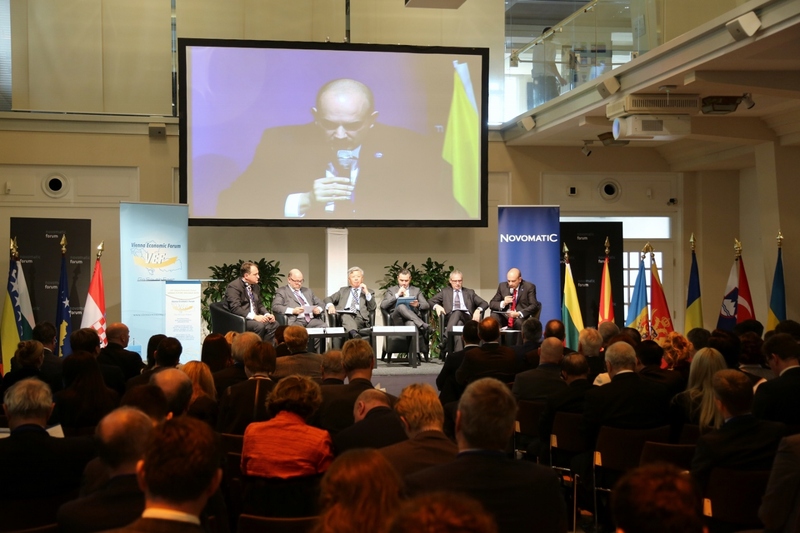 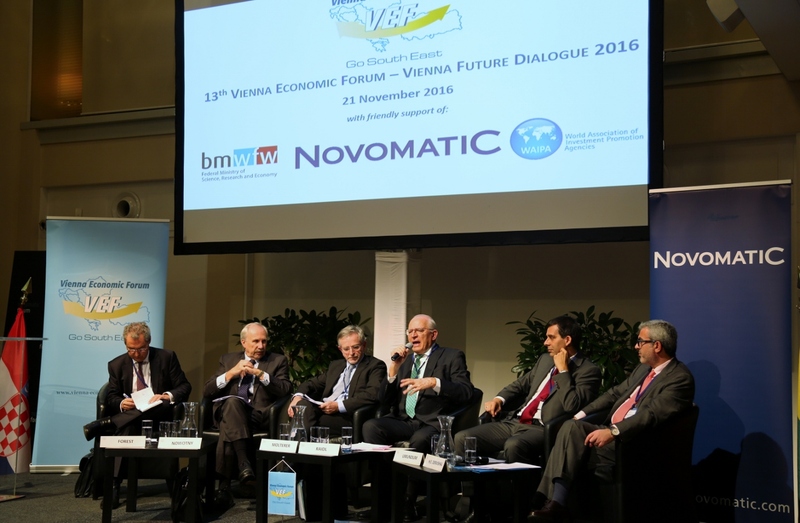 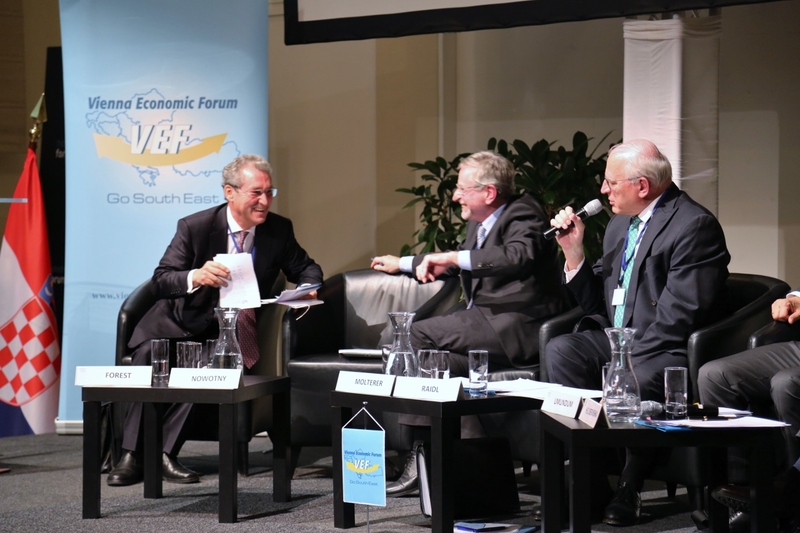 The 13th Vienna Economic Forum - Vienna Future Dialogue 2016 will be held on November 21st 2016 at the Novomatic Forum in Vienna. 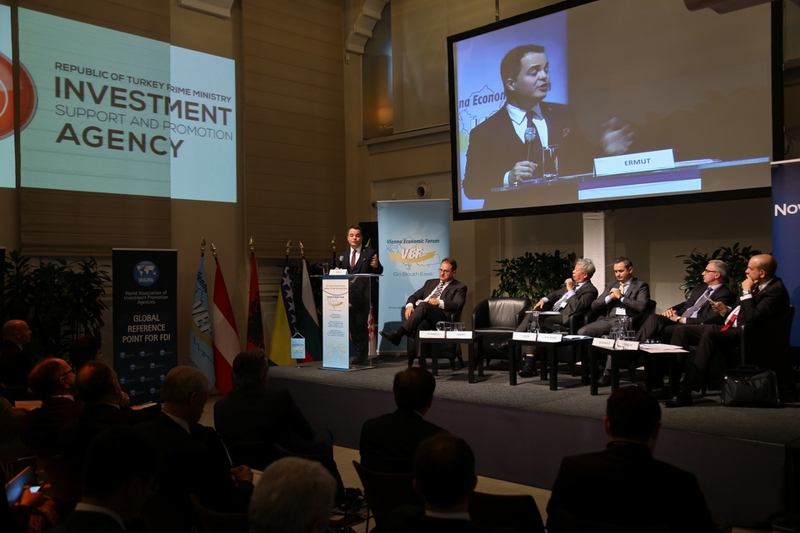 The First Session “Investment Strategy – Regional and worldwide” from 2-4 p.m. will focus particularly on the experiences of the Investment Agencies and their role for a better investment climate not only in the region of Vienna Economic Forum but worldwide. With this aim we organise the 13th Vienna Economic Forum - Vienna Future Dialogue 2016 together with our partner the World Association of Investment Promotion Agencies (WAIPA), whose President is also President of the Investment Support and Promotion Agency of Turkey (ISPAT). 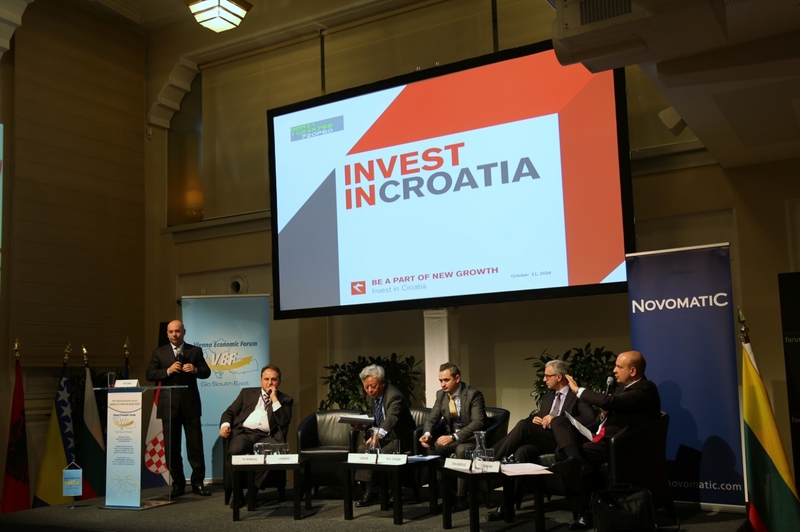 The Second Session from 4.30-6.30 p.m. is dedicated to “Investments in infrastructure – how to be more pragmatic” with the aim to deepen the regional dialogues regarding the focus on strategic projects in the Balkans and to discuss about the programme of the European Fund for Strategic Investments (EFSI) and about the ideas and visions of decision makers and high representatives from investors side and the business world of the region. 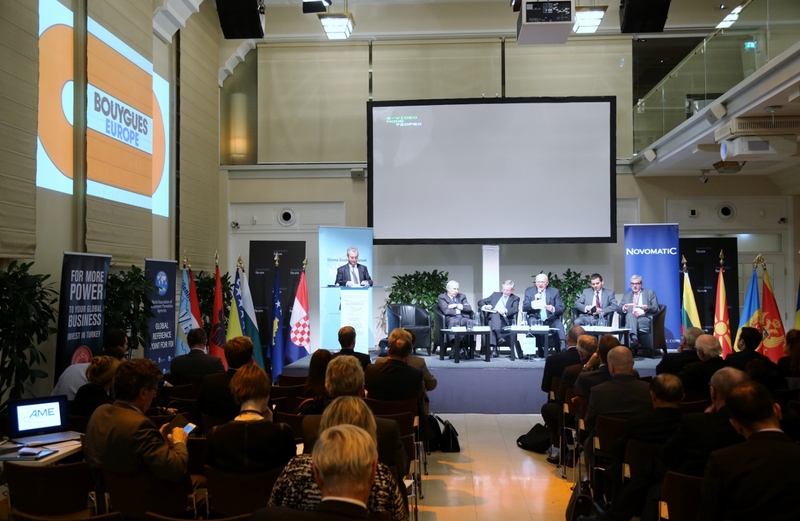 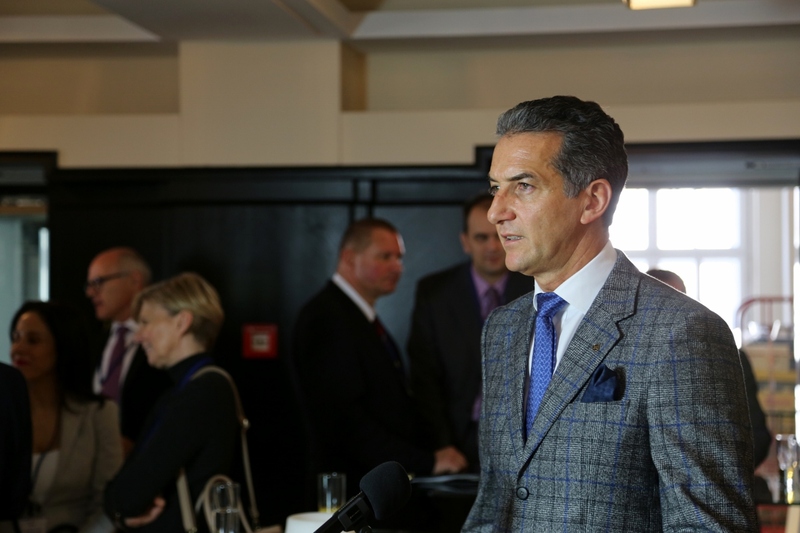 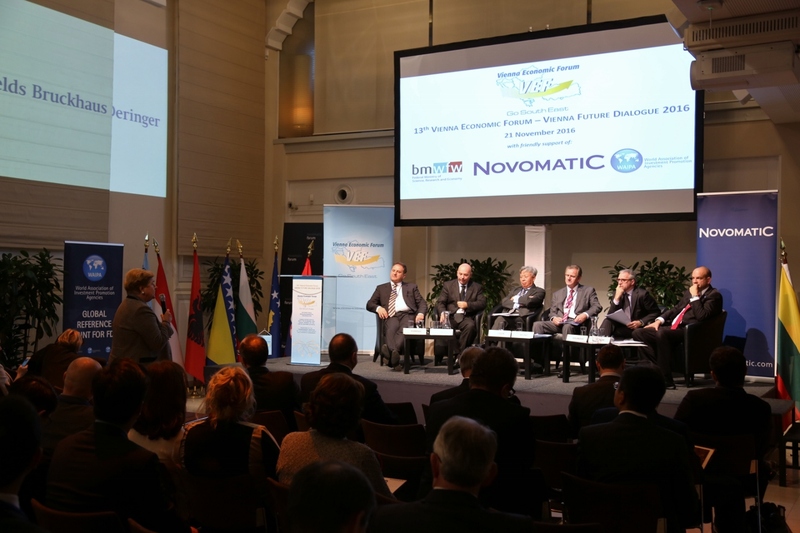 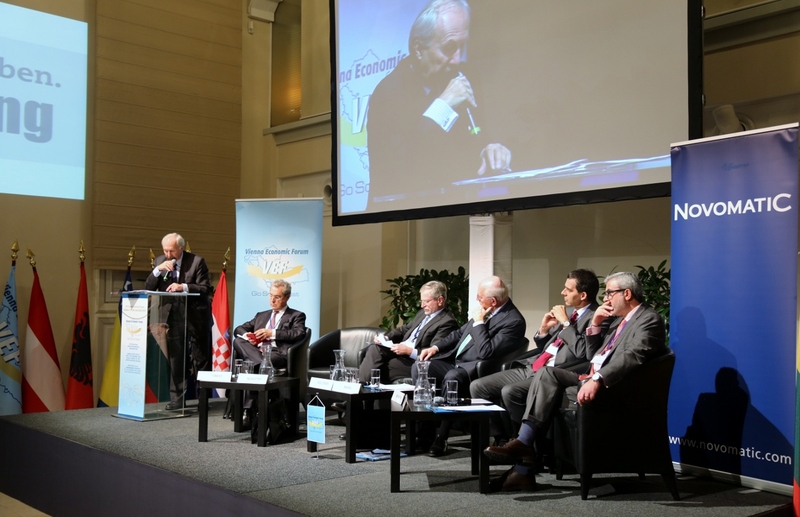 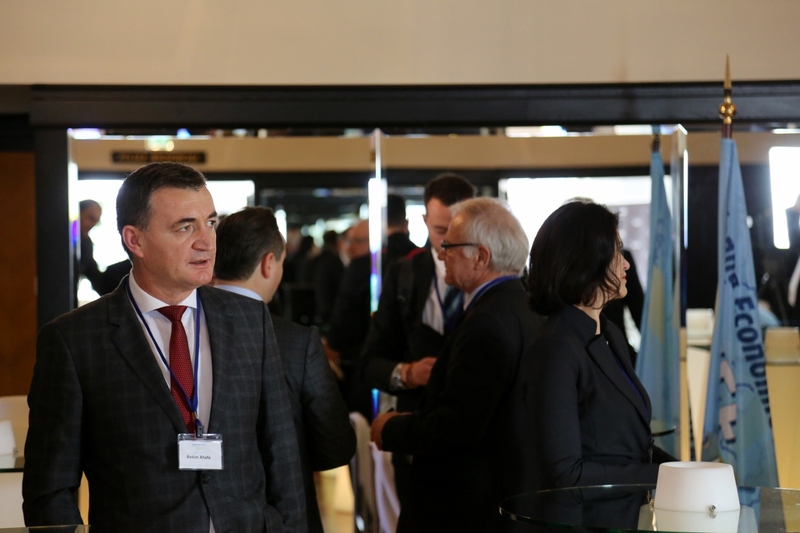 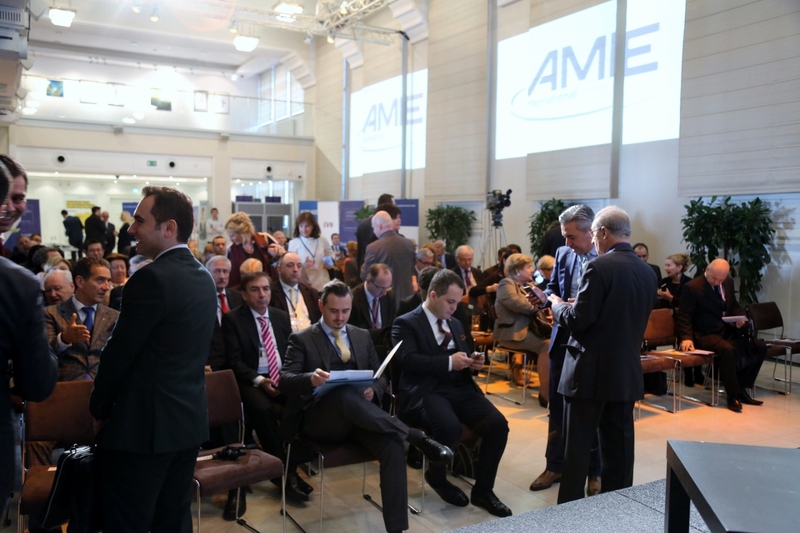 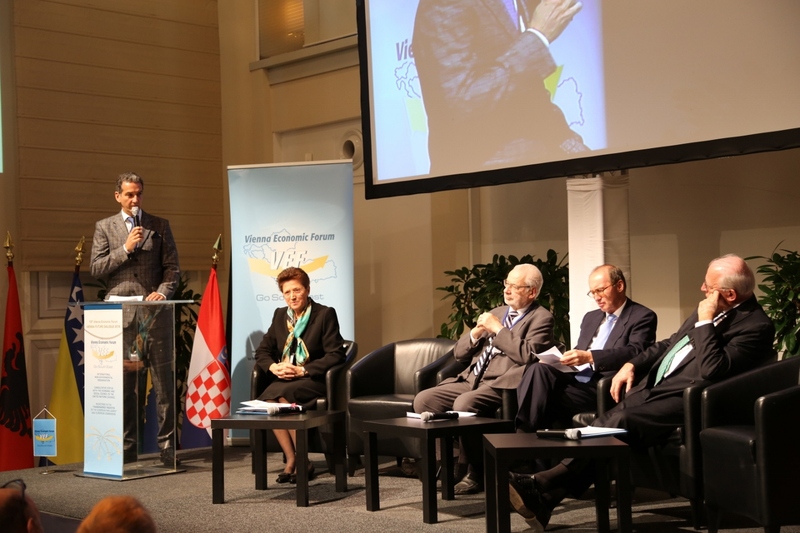 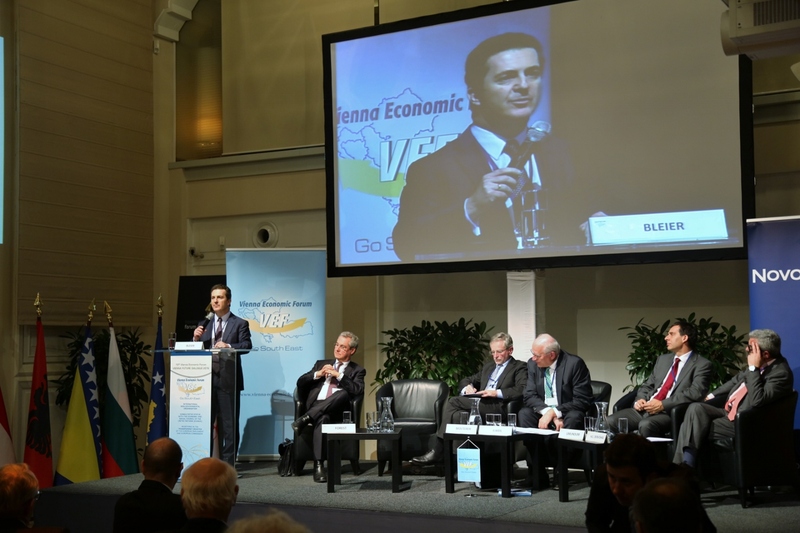 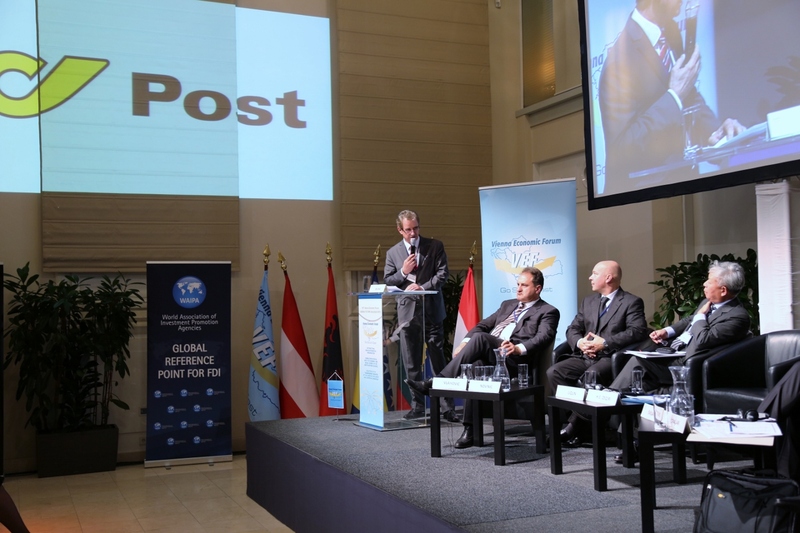 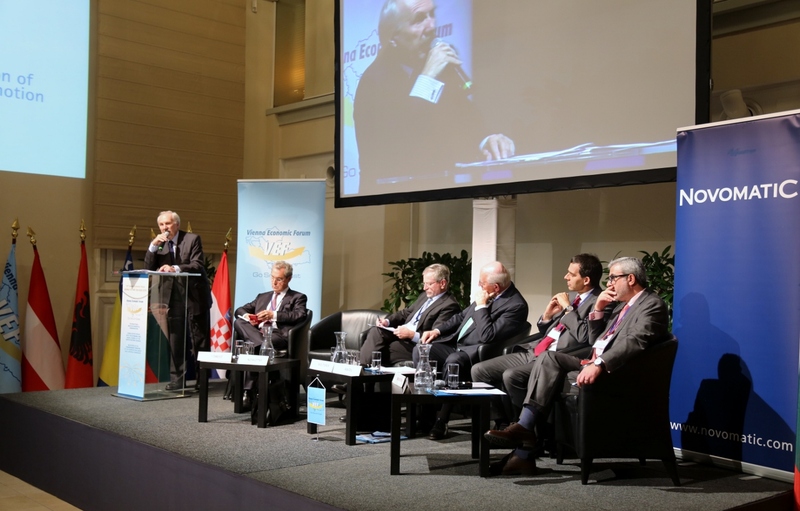 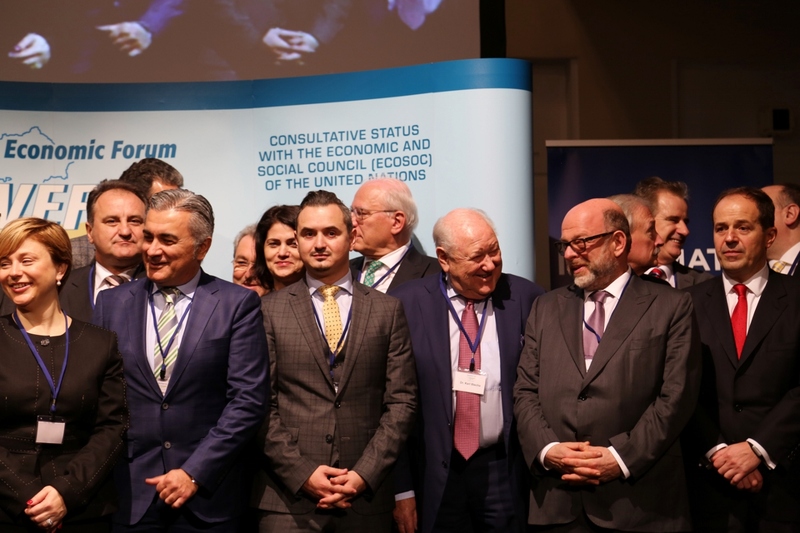 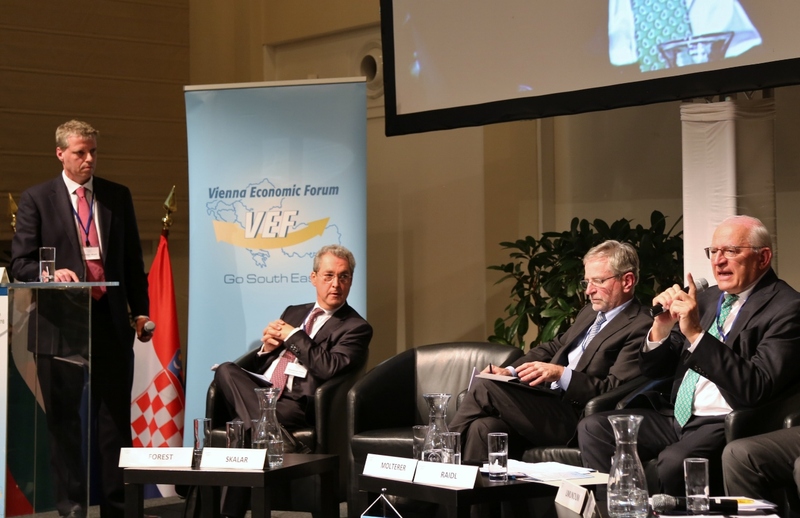 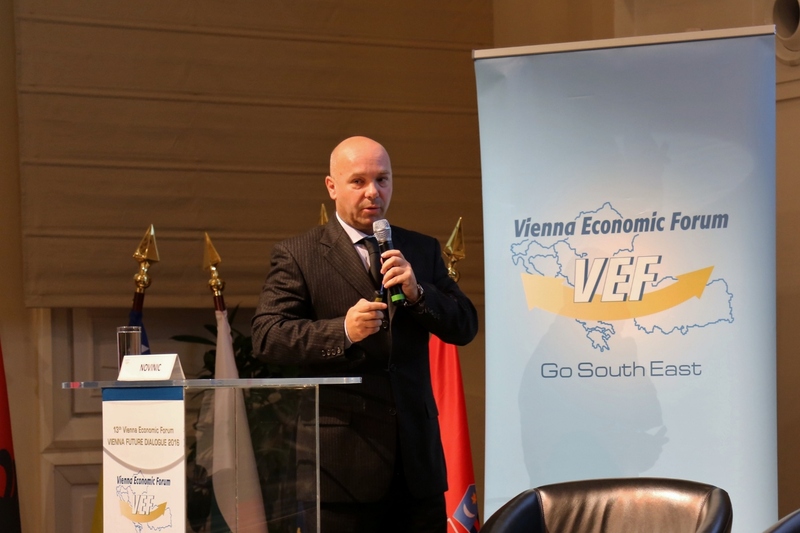 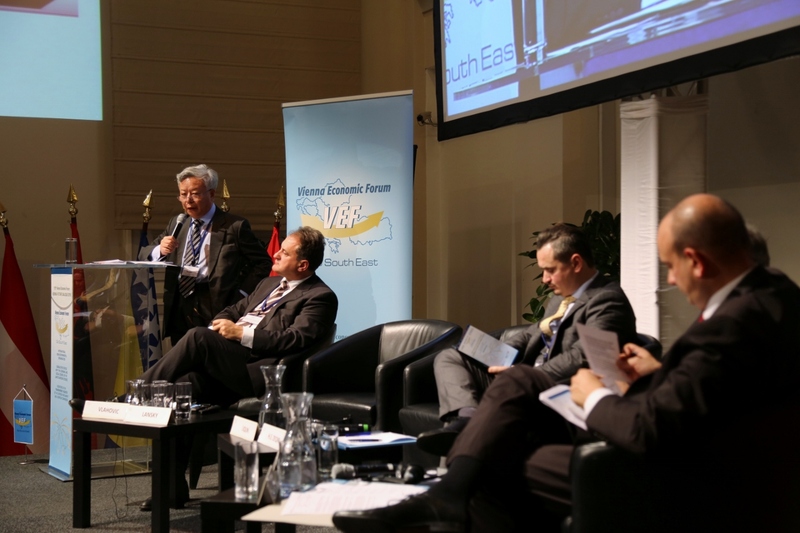 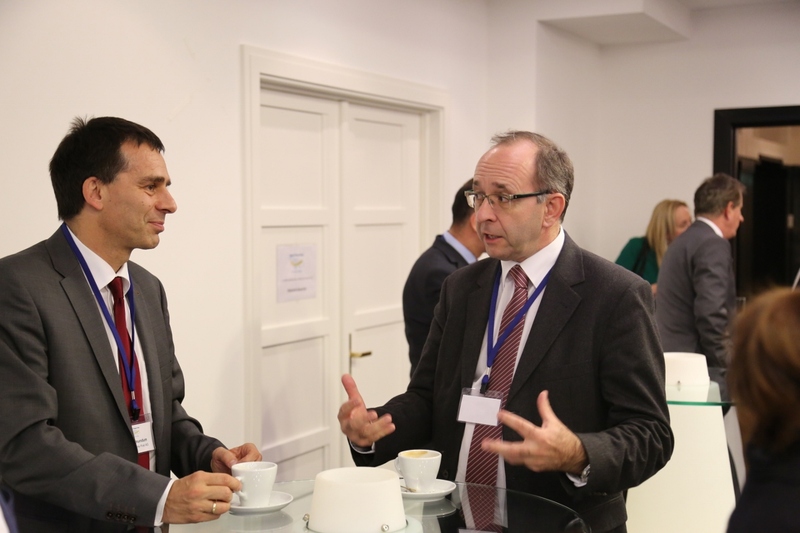 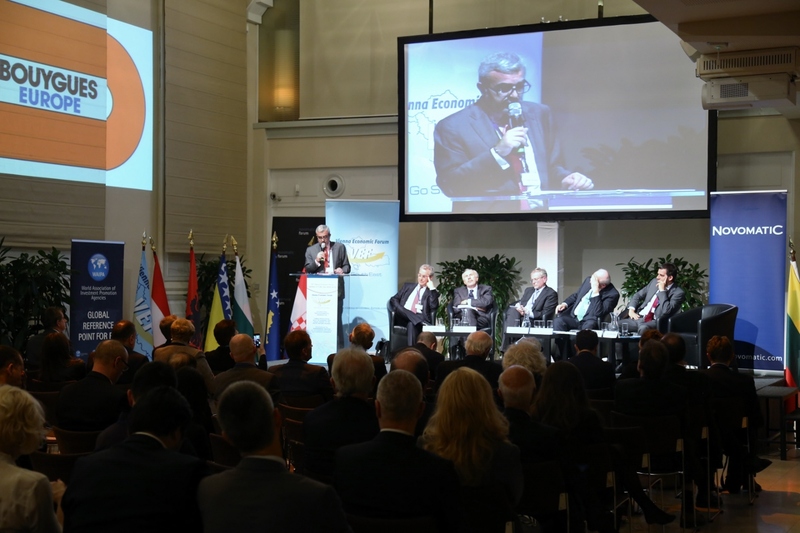 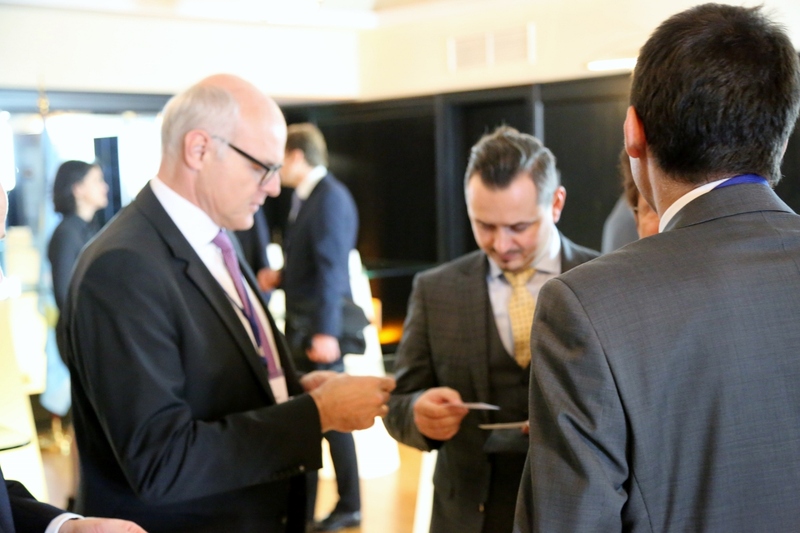 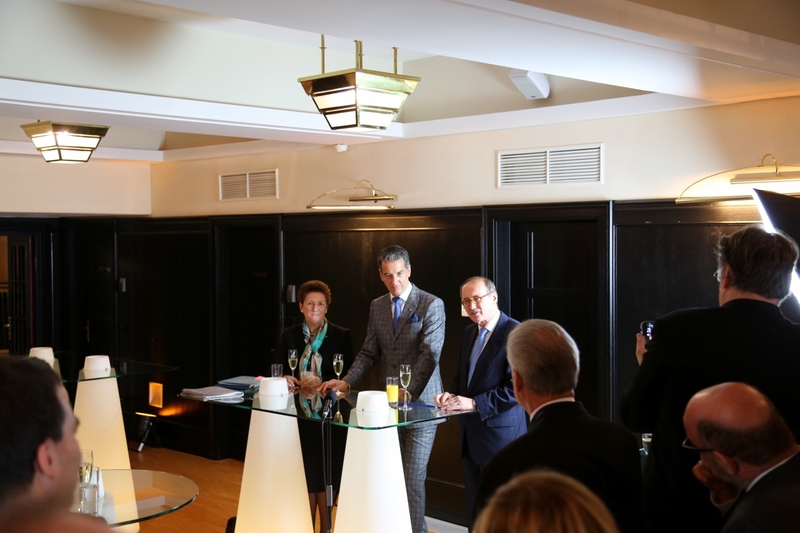 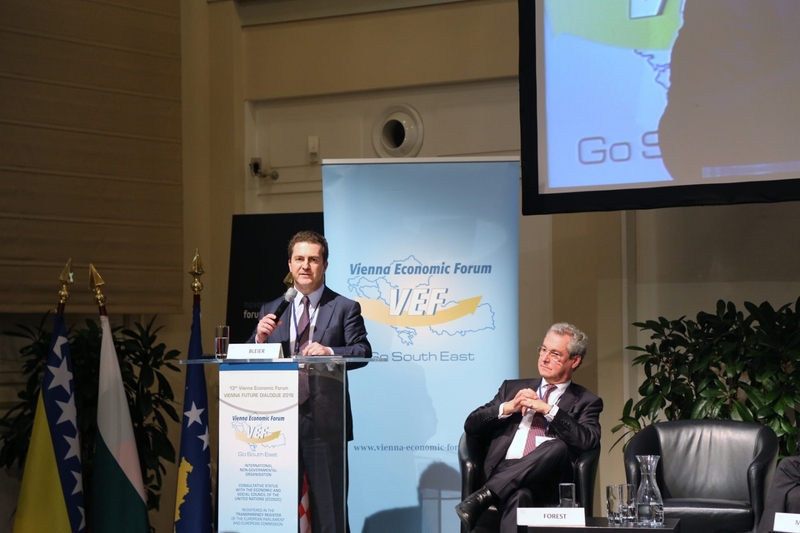 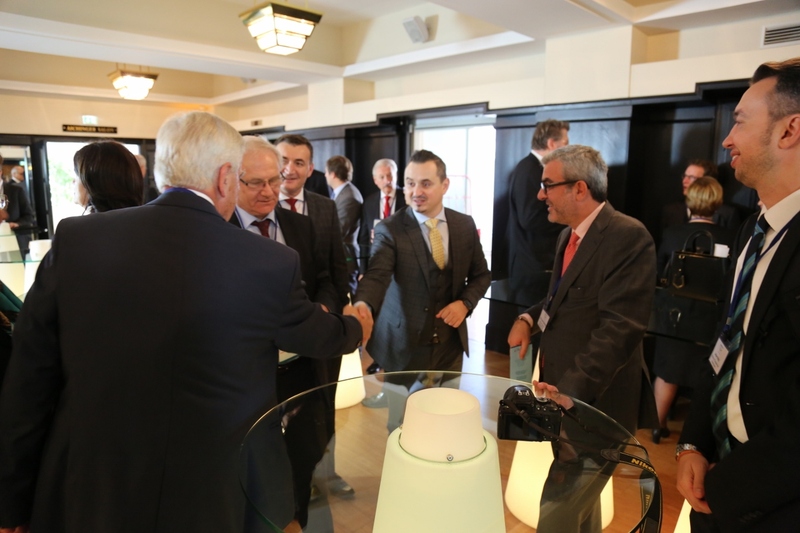 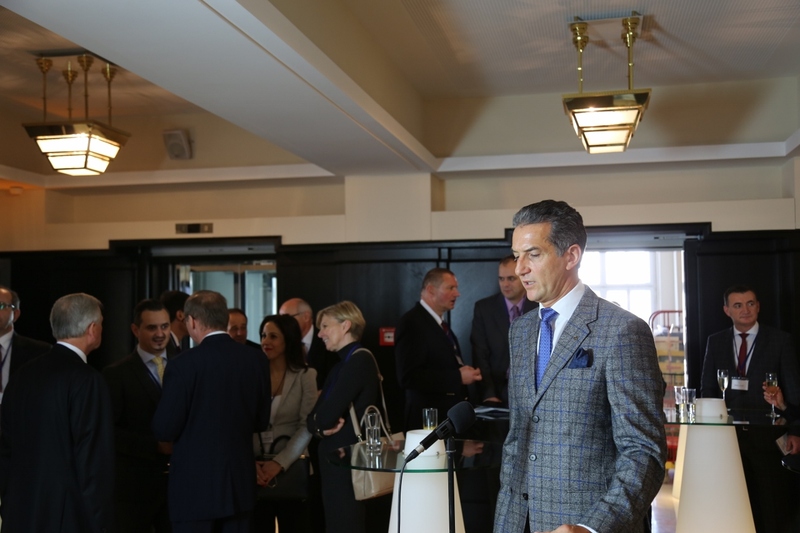 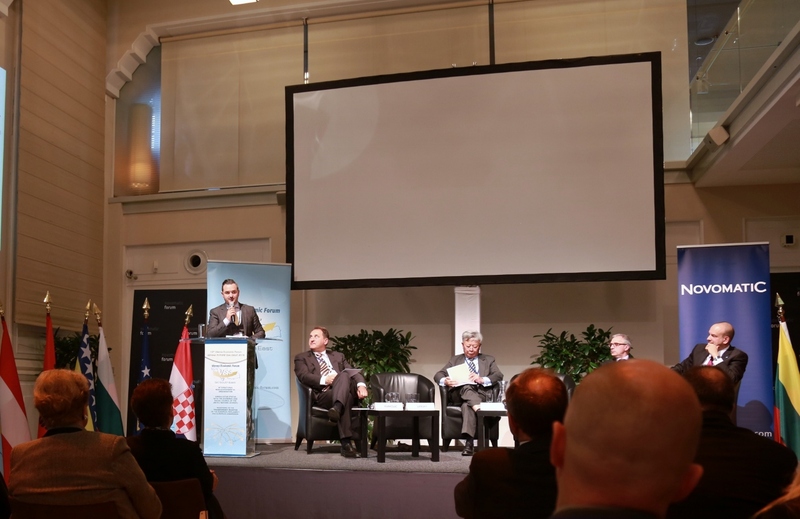 On 17 June the Board of Vienna Economic Forum invited together with the Ambassadors of the Member Countries of VEF to the "15th Traditional Meeting of the Friends between the Adriatic and the Black Sea". 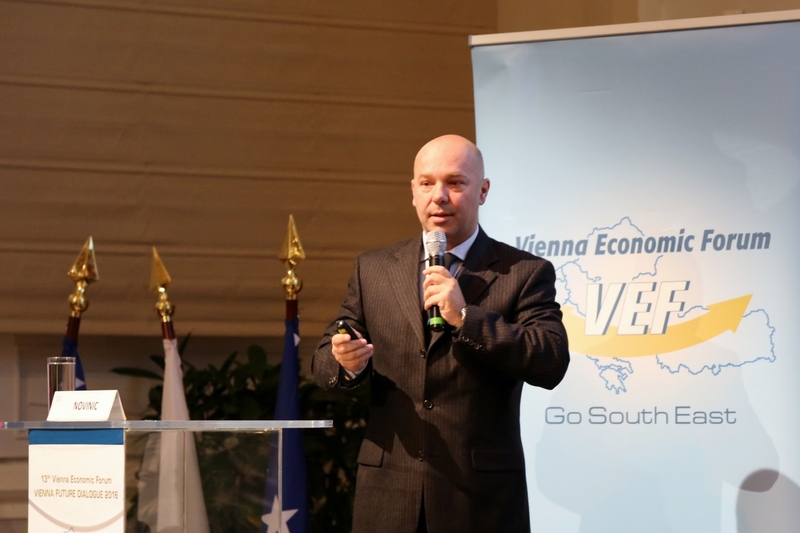 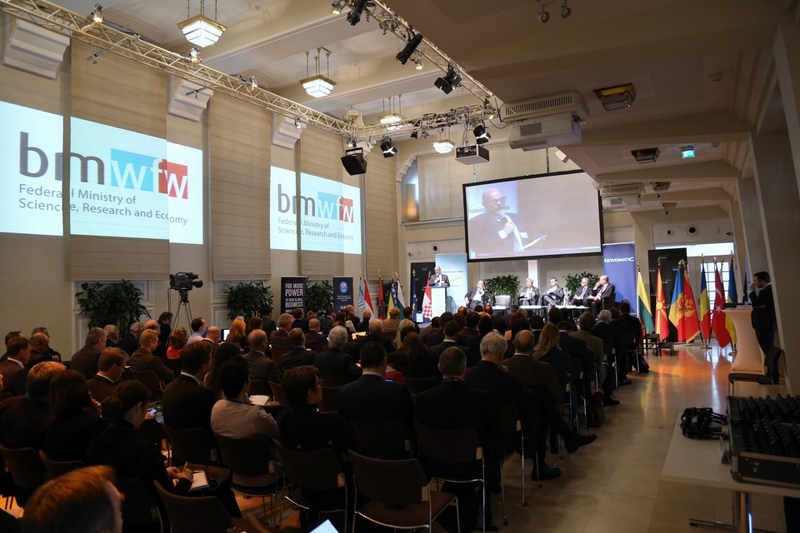 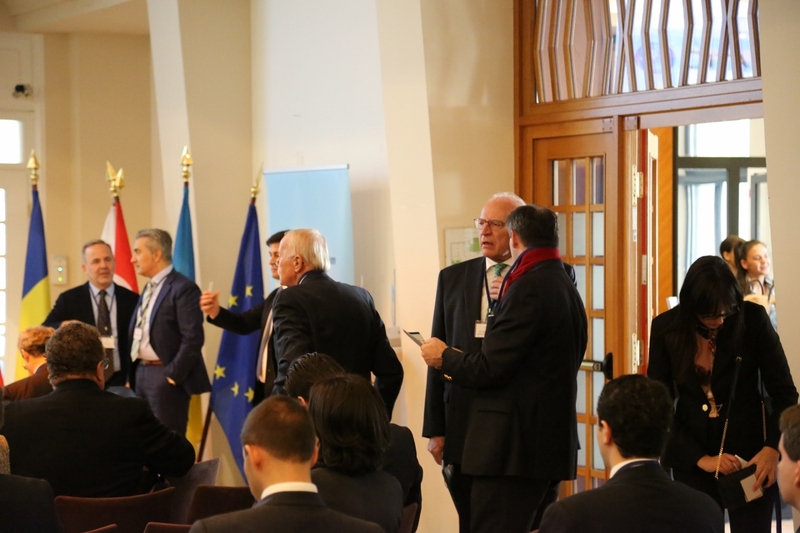 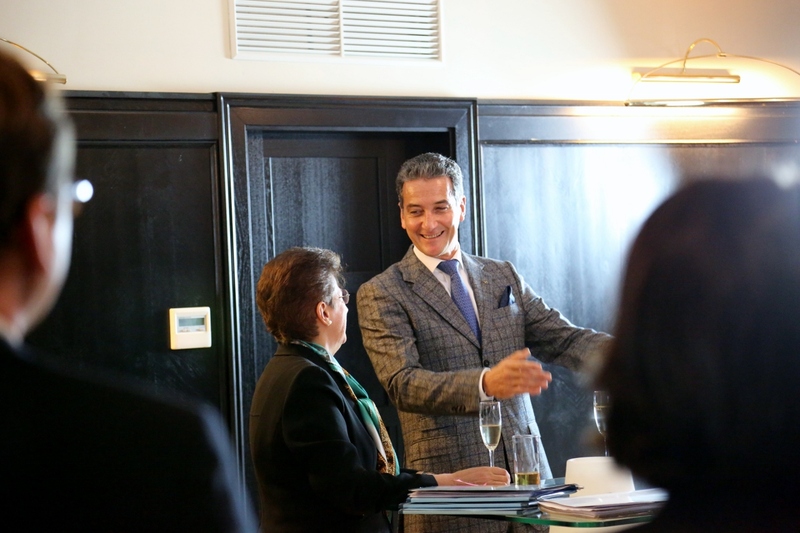 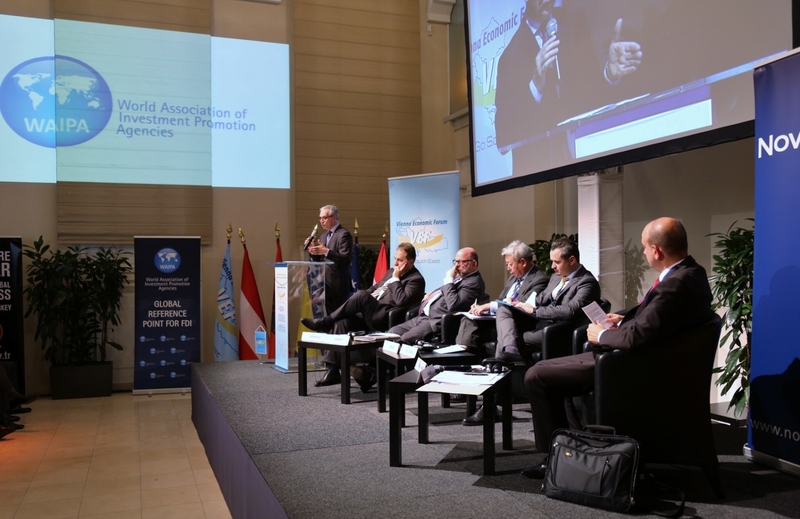 The "Culinary and musical journey through the countries of the region" with the participation of the member countries of the Vienna Economic was as traditional organized at the Diplomatic Academy of Vienna. 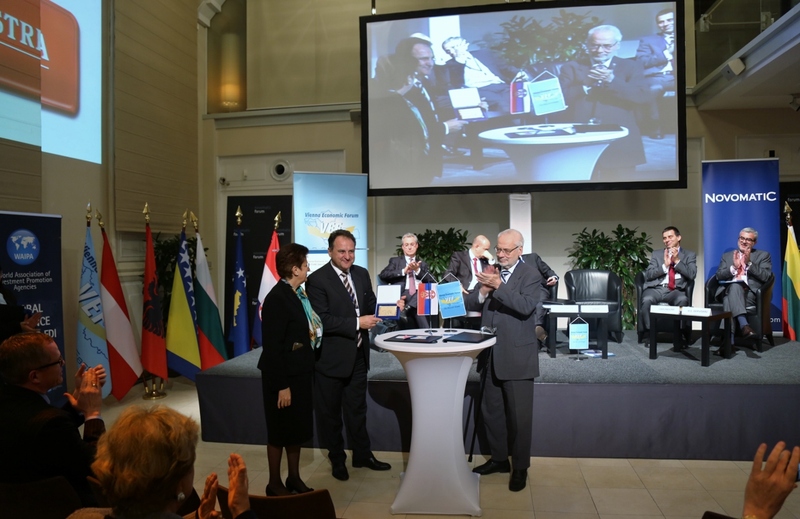 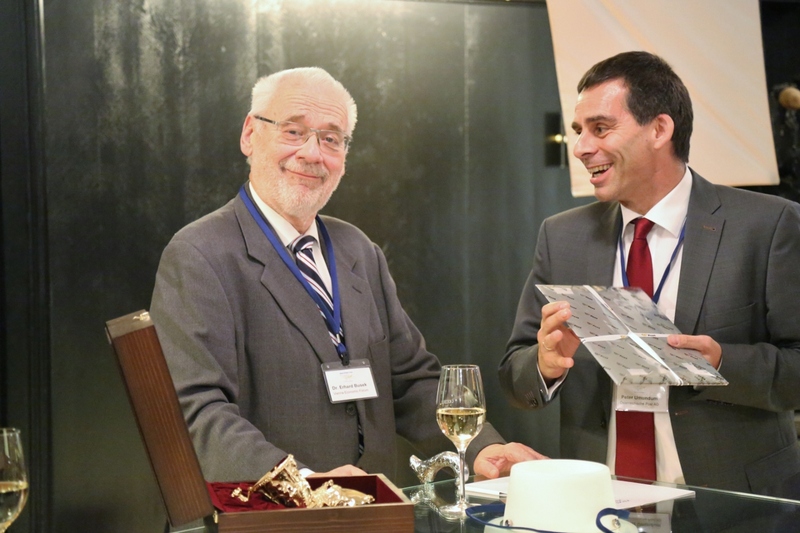 The words of welcome at the jubilee event came from founding father and honorary member of VEF Dr. Herbert Stepic. 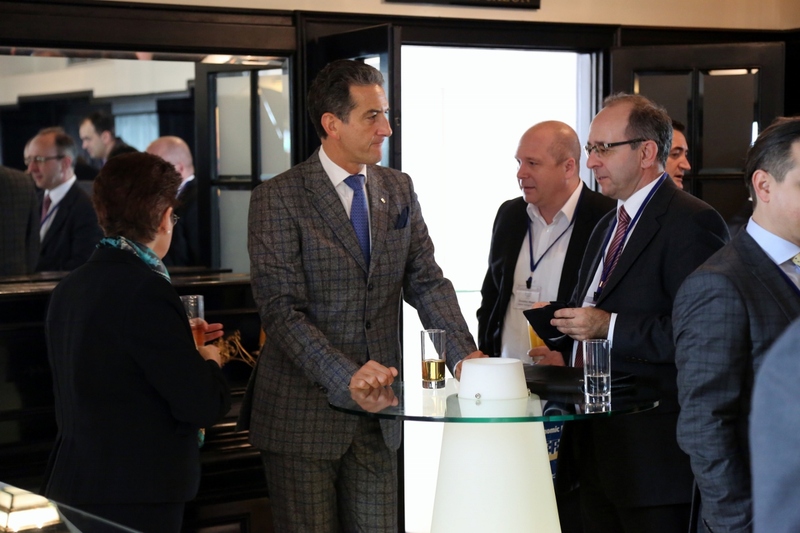 The member countries have spared no effort to impress the guests with their country-specific culinary delights. 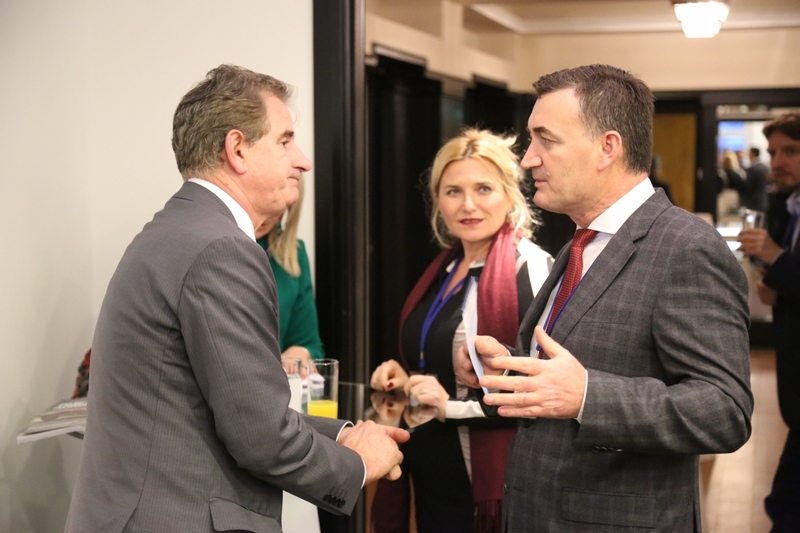 The artistic performance was as in previous years, the highlight of the evening and the guests enjoyed the performances of artists from Albania, Bosnia and Herzegovina, Turkey and Bulgaria. 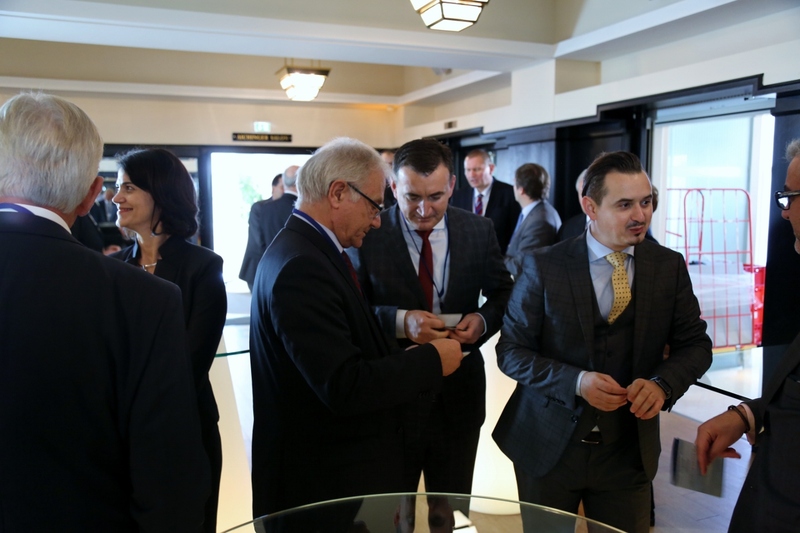 The folk dances of the region have animated many of the guest to join the dance. 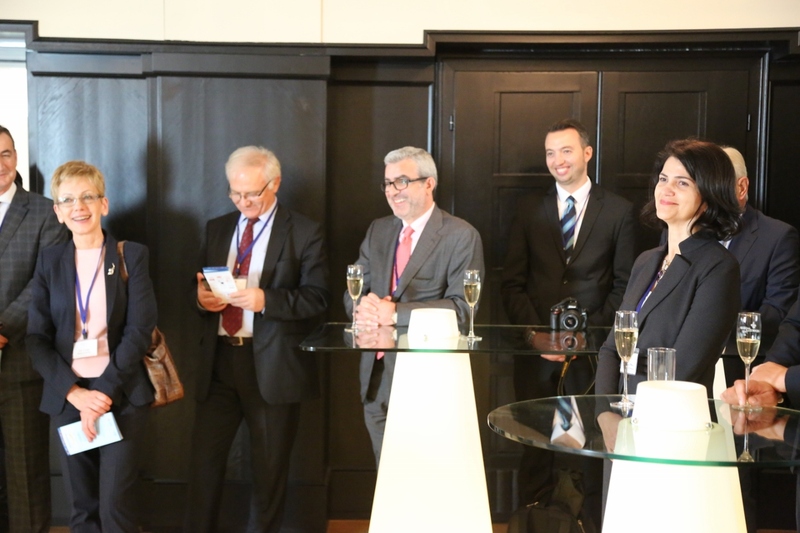 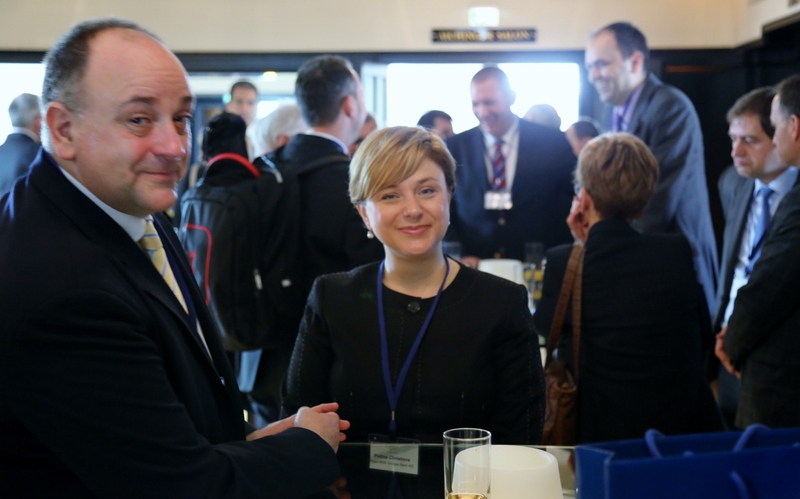 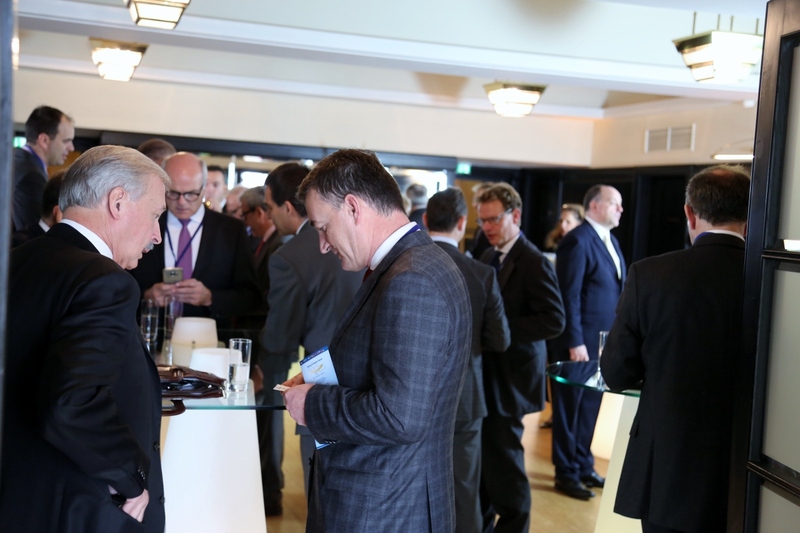 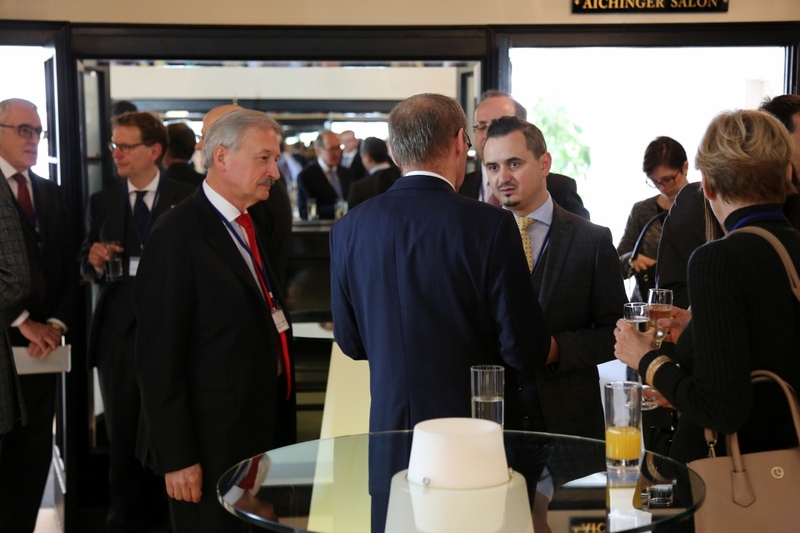 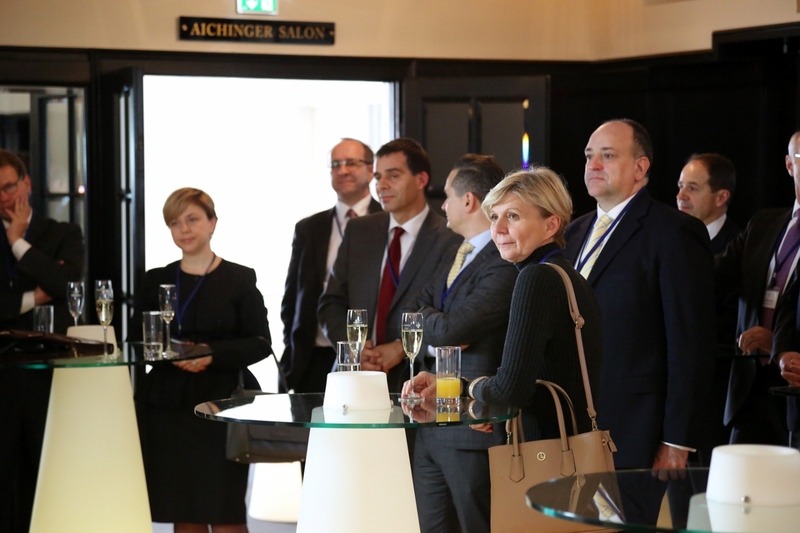 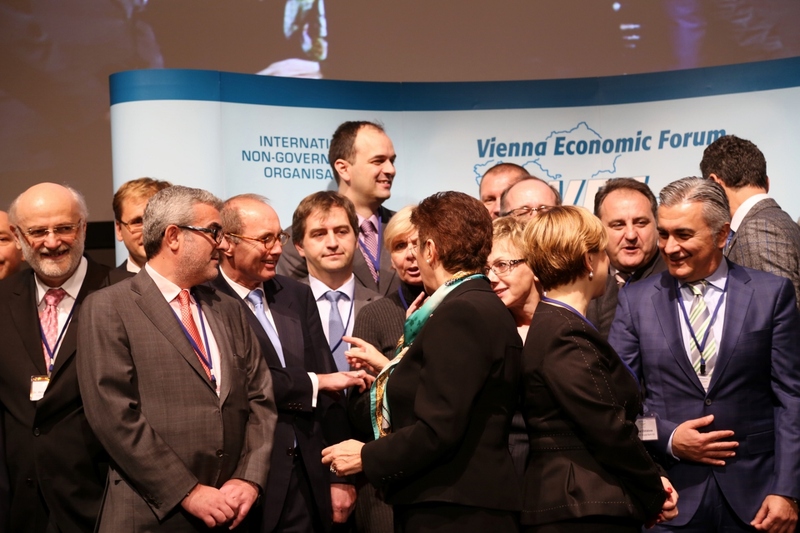 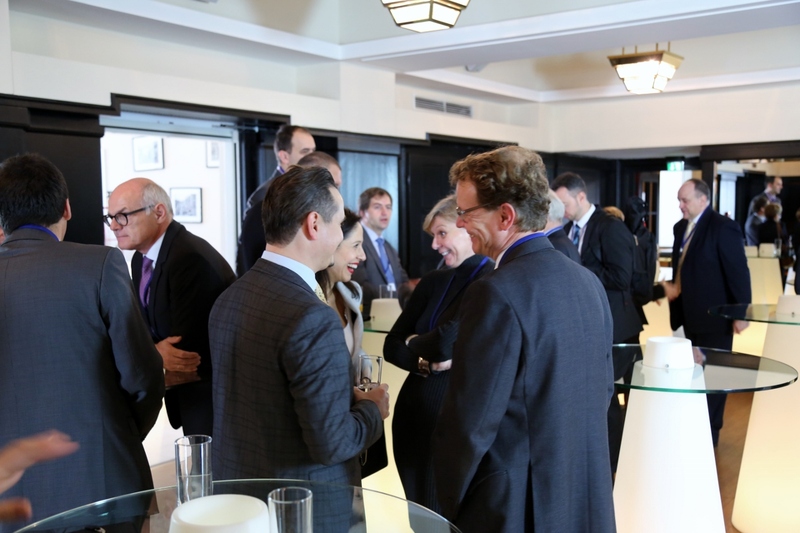 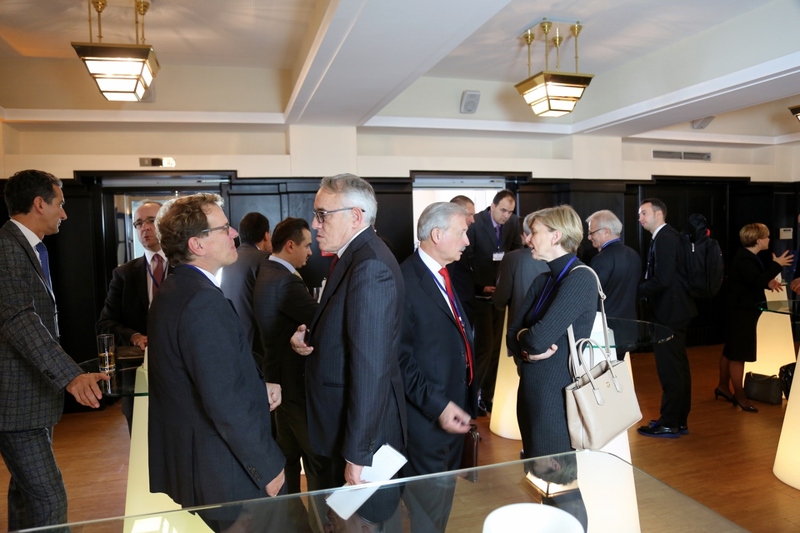 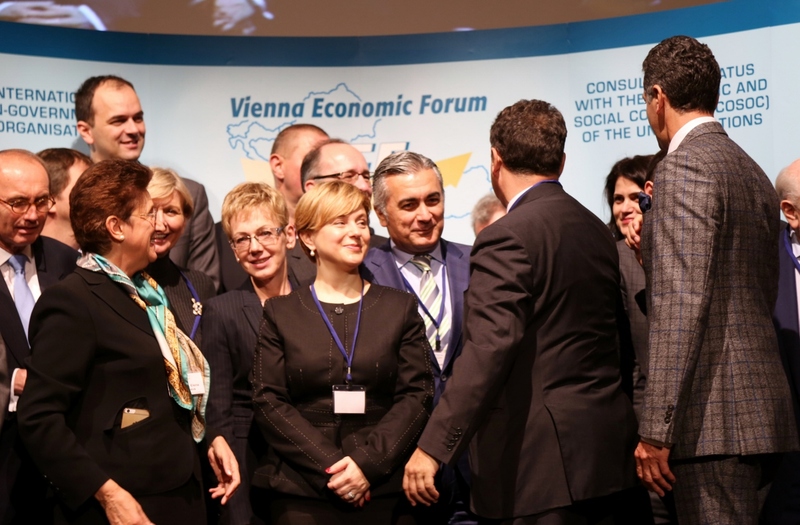 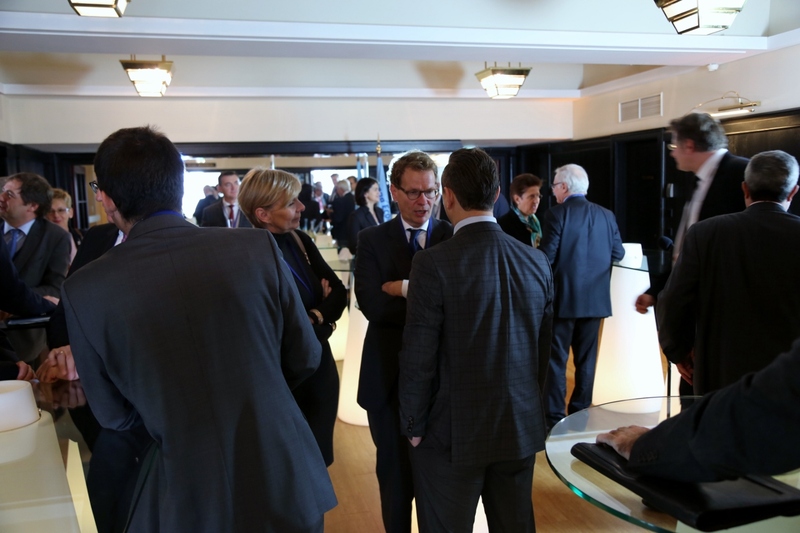 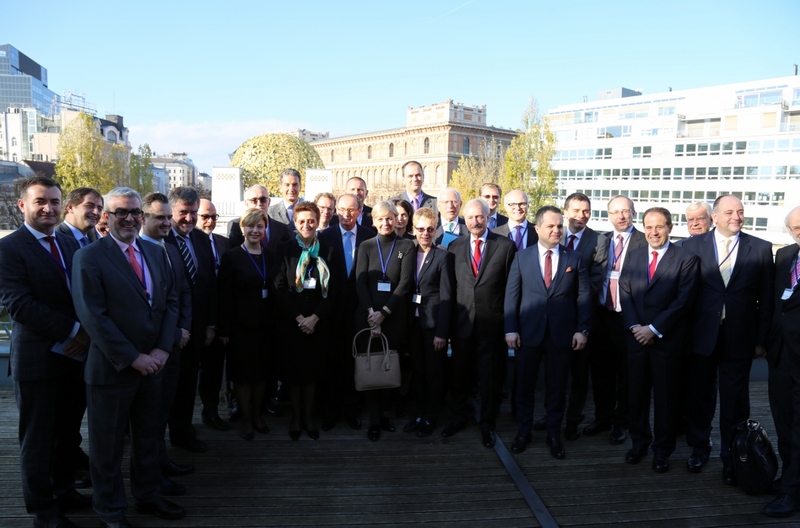 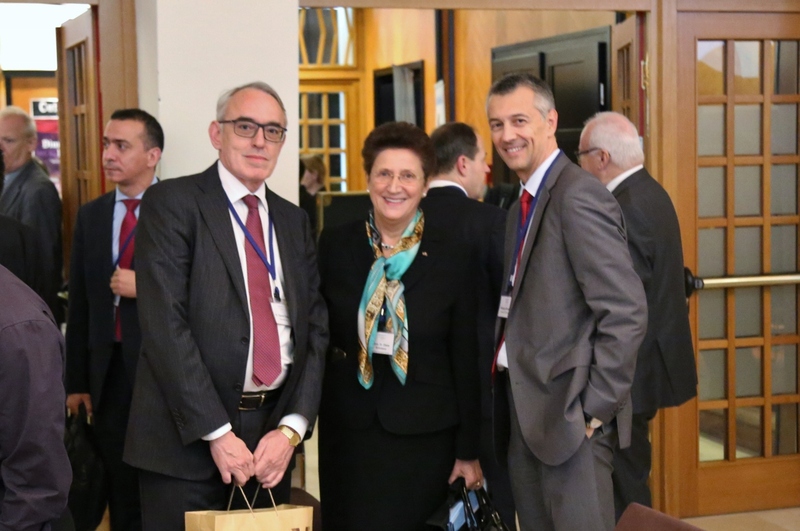 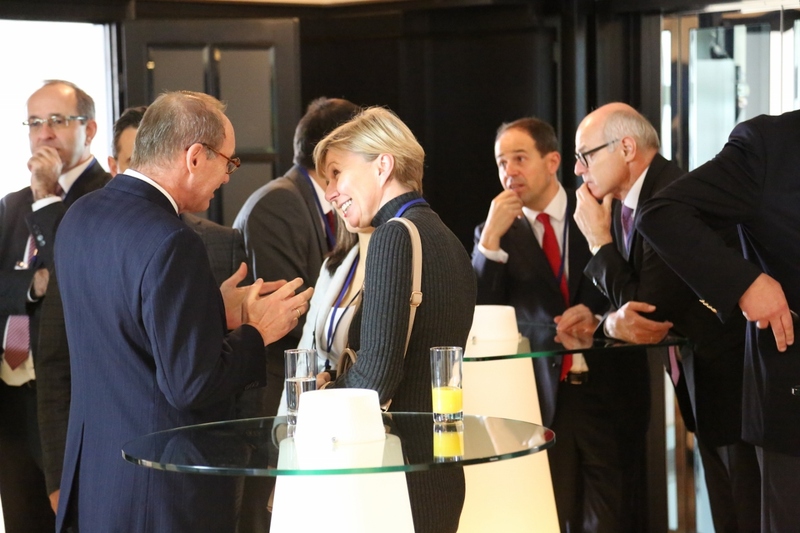 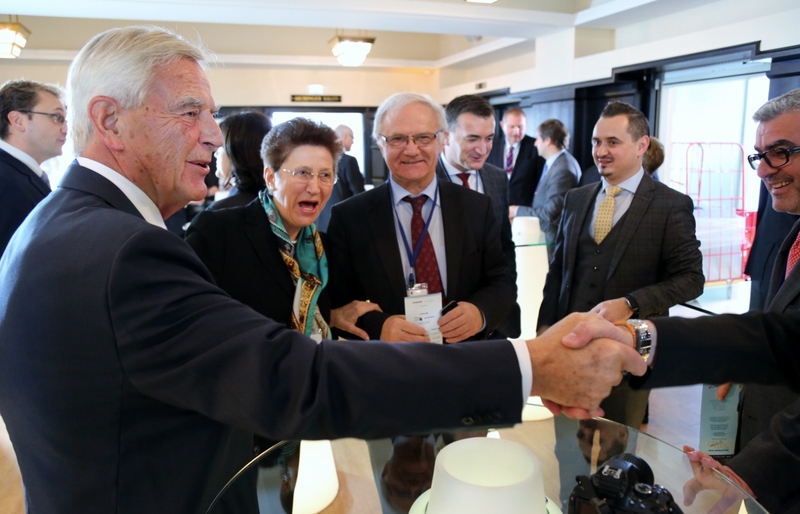 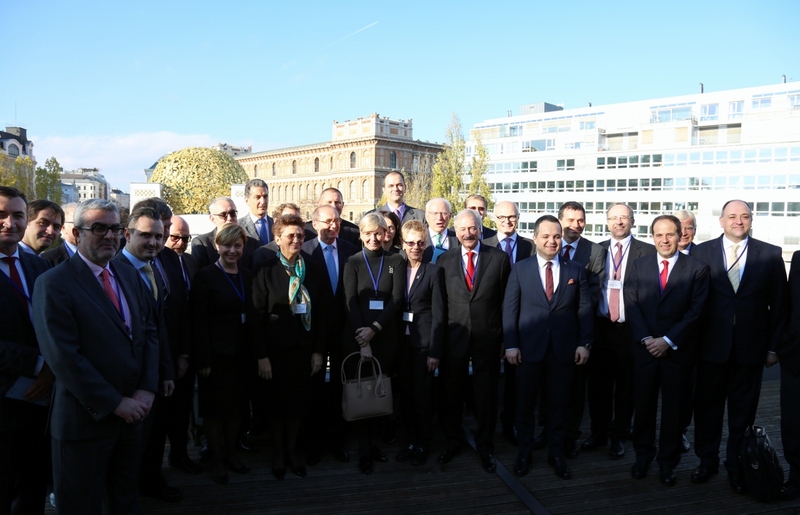 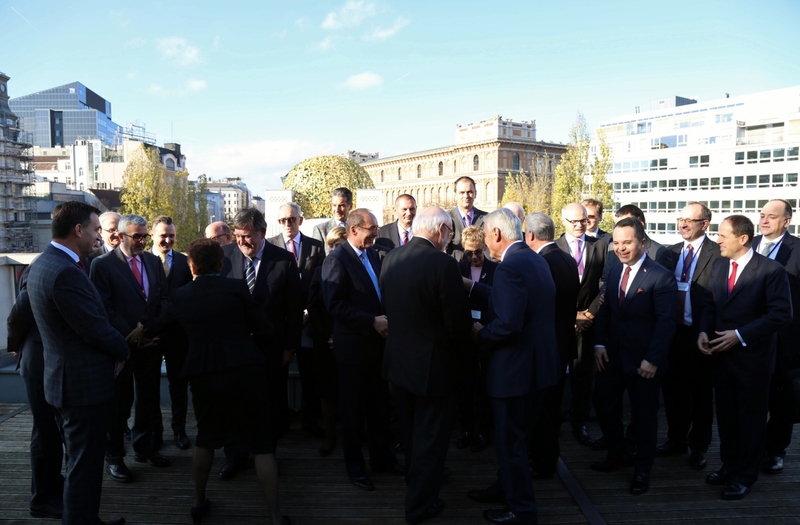 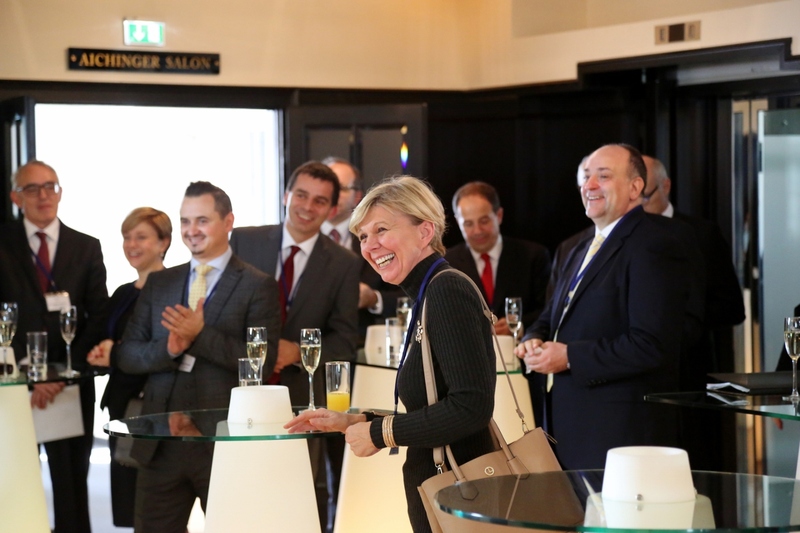 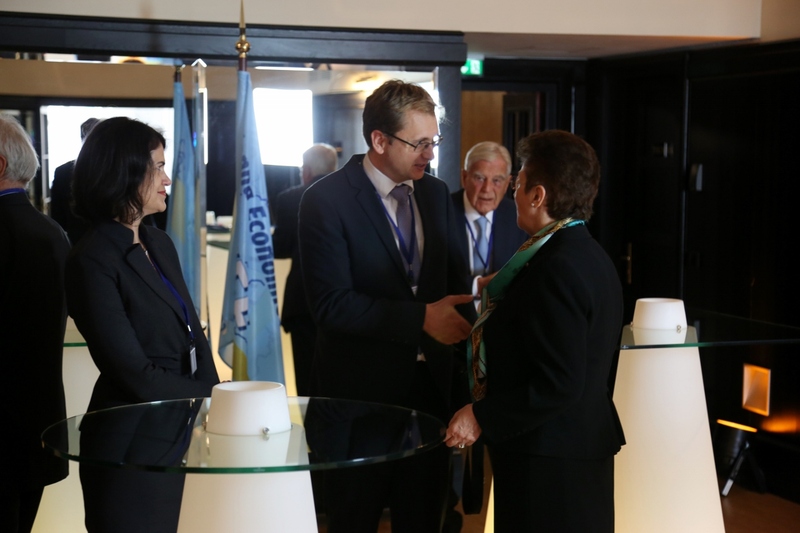 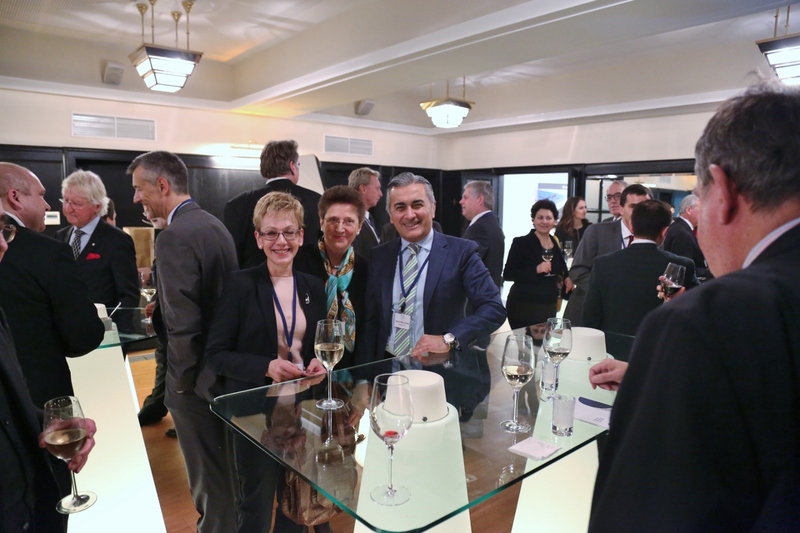 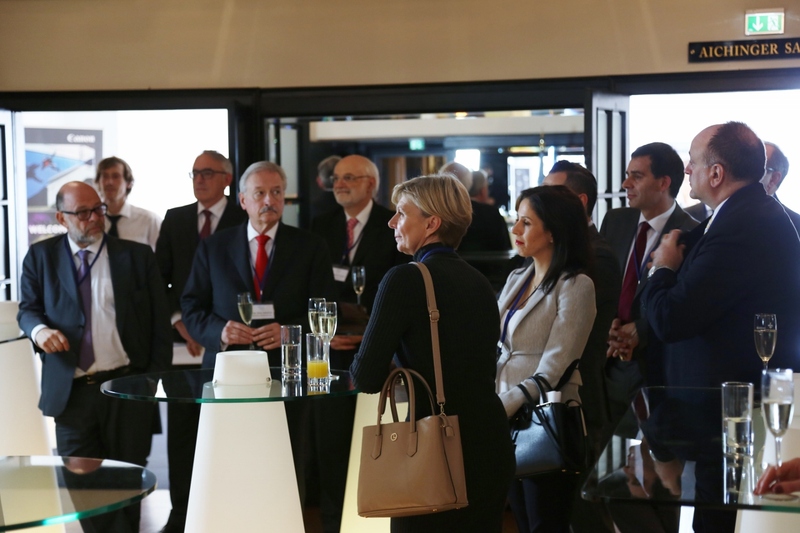 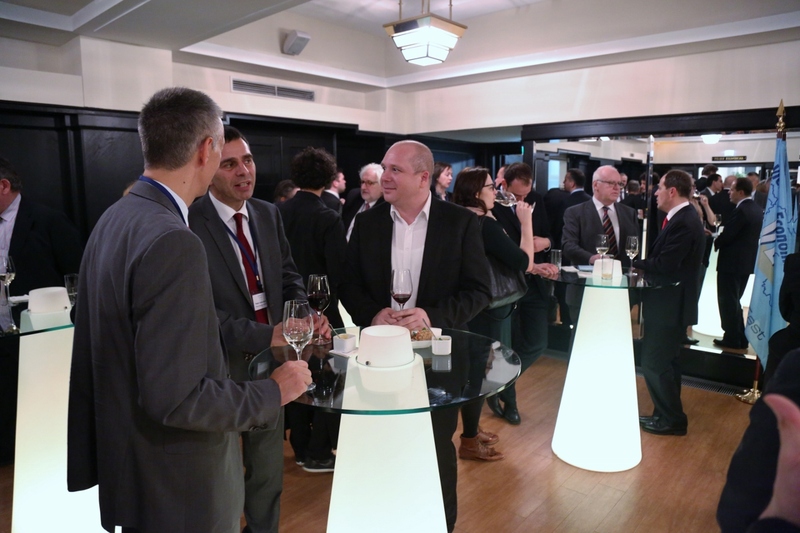 In addition to the Secretary General Ambassador Dr. Elena Kirtcheva welcomed numerous board members, members, partners and friends of the Vienna Economic Forum. 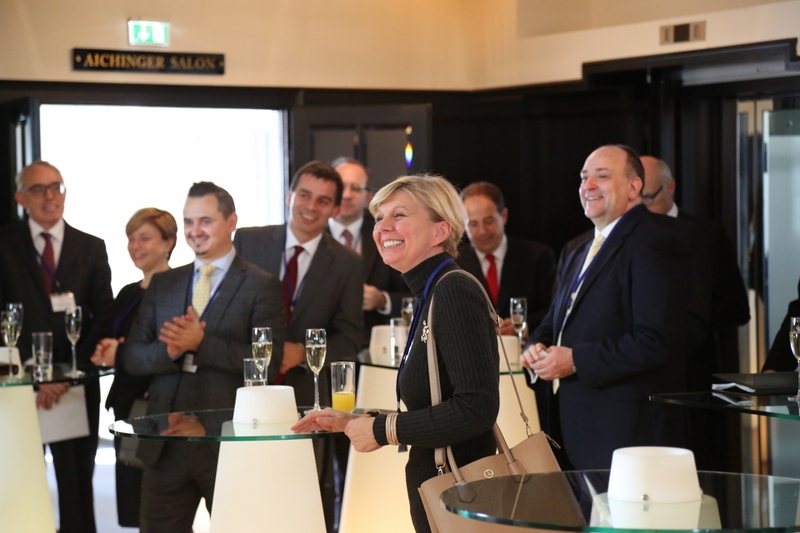 The great number of participants enjoyed the good atmosphere, the culinary delights and musical pleasure. 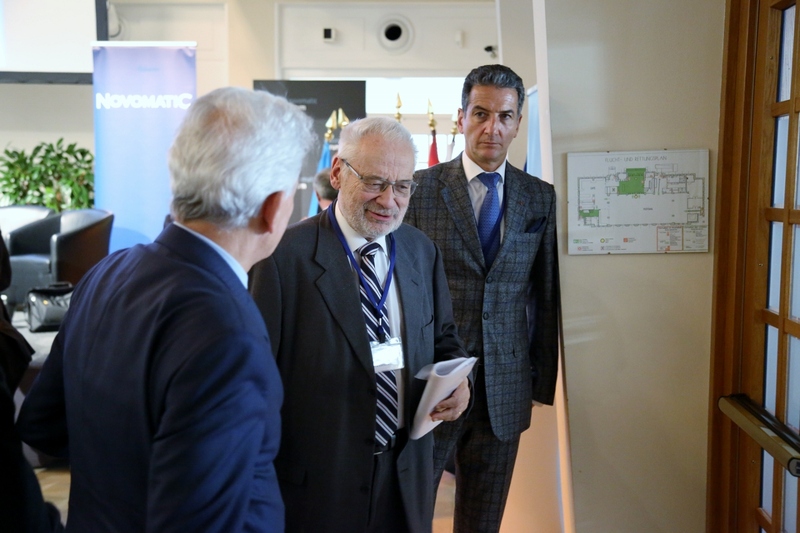 The unique atmosphere was also in this year again a proof of how much connects the people of the region from the Adriatic to the Black Sea.